Writer’s note: As a new moderator to this subforum, one of the things that Lemur, Myth, and I are going to try to do is to bring some extra life to this forum. On my side of things I'm going to try to encourage AARs (after action reports for those who may not know) to bring some added content. One leads by example, so here we go! I'm going to try to update this as often as I can. Some days I'm really busy, other days I have nothing better to do, so update frequency may vary. Growing up in the household of a Suebi head chieftain can be intimidating. Even from a very young age, any showing of weakness is seen in a negative light. As you can probably tell, I didn’t have many friends growing up in the capital, Lupfurdum. Being a friend to the chieftain’s only son was a risky endeavor. My father’s bodyguards followed me around everywhere I went, and for adventurous young Northern children, it doesn’t make you very fun to be around. So I would listen to my minder and her stories of lands abroad, and I would train with my bodyguards in the arts of war. 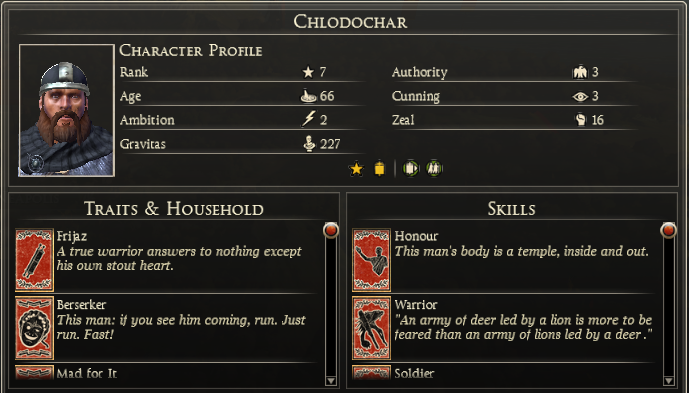 My name is Chlodochar, and I am the head chieftain, and have been for twenty-two winters. I am the victor of over thirty battles against my enemies, no defeats. 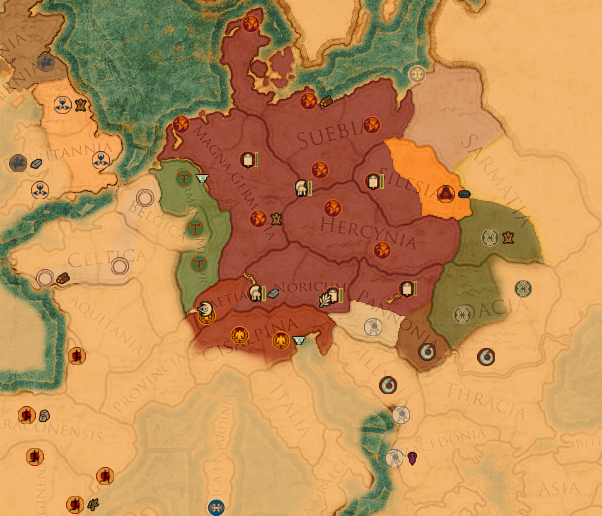 I have brought most of the North under Suebi control. 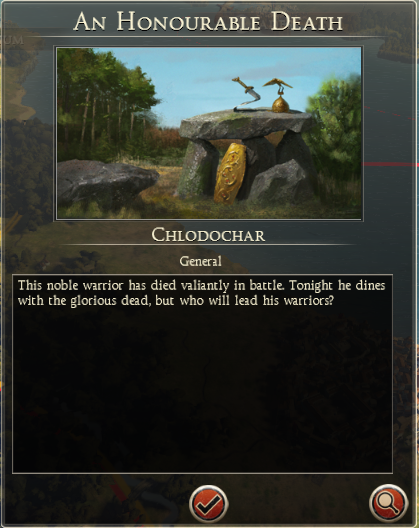 I have had rival leaders sent to death in battle for threatening me. 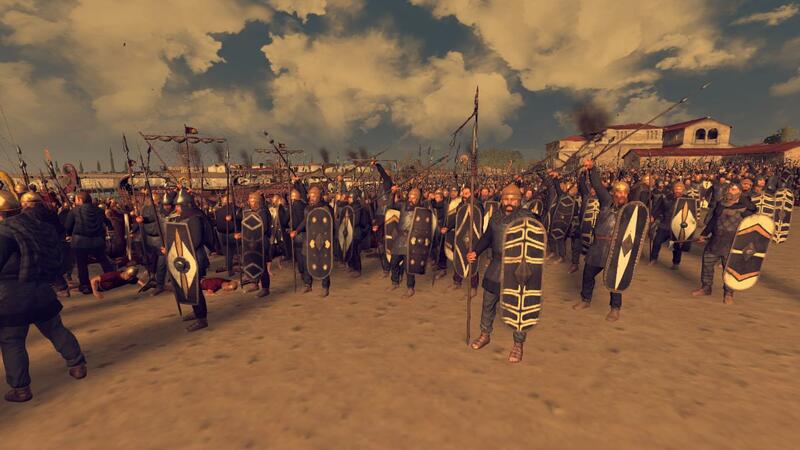 I have stood before tribal chiefs, sword in hand as they made threats against my rule. I have been injured by assassins twice, but never in battle. Wōdanaz blesses me and my army, The Dread Berserkers, with good fortune, and we have always emerged victorious. My father died when I was nineteen winters old, leaving me an unruly tribe to tend to, which, as you can imagine, was not an easy task, especially for someone who had not even lived through twenty winters. Dealing with countless tribal leaders and problems that arise is no small undertaking. If it wasn’t for my advisors I do not think I would have survived past my first winter. Something which has always been at the back of my mind was the stories my minder told me about the city of Roma. I heard stories of roads paved with gold and the walls made of silver, and where everyone is adorned in enough treasure to fund a hundred armies! Ever since I heard these stories I have had this unquenchable thirst to sack Roma. If not me, I will give my heir this dream. 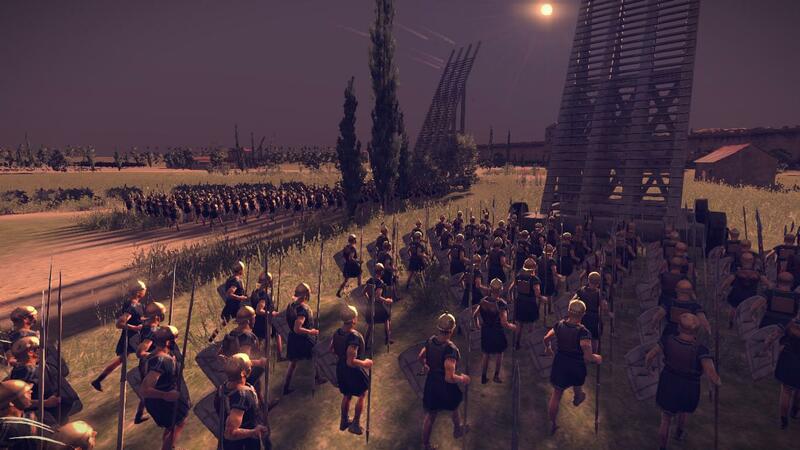 Someday, Suebi warriors will march through Roma as conquerors! But before we can sack Roma, we must unite the tribes around us. The Gutones, the Rugii, the Cimbri, the Frisii, and the Lugii must unite under one flag. 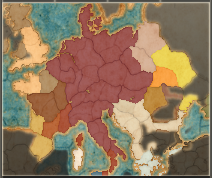 After years of attempting to form a confederation, the other tribes, being the selfish, finally refused, saying that they would bring war to our doorstep if we did not abandon this silly dream. So we brought the war to them. It didn’t take long until all those tribes called themselves Suebi. 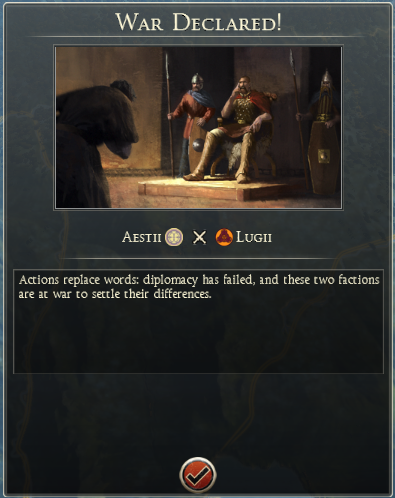 We considered taking down the tribe of Aestii, but for the time being we are at peace and we decided to not bother them. Although we did send an army under my adopted brother Ricfried to be a deterrent for any invaders. We then turned our attention to our southern Celtic neighbors, the Boii. 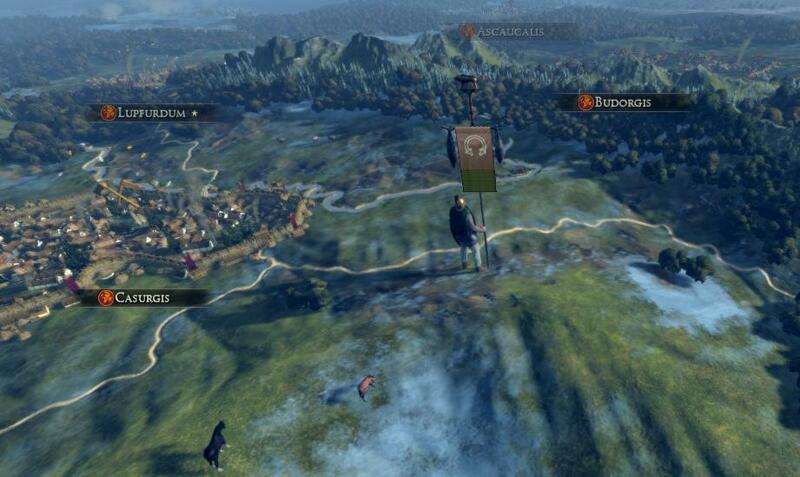 Our Targets were the towns of Budorgis, Istros, and Belz. 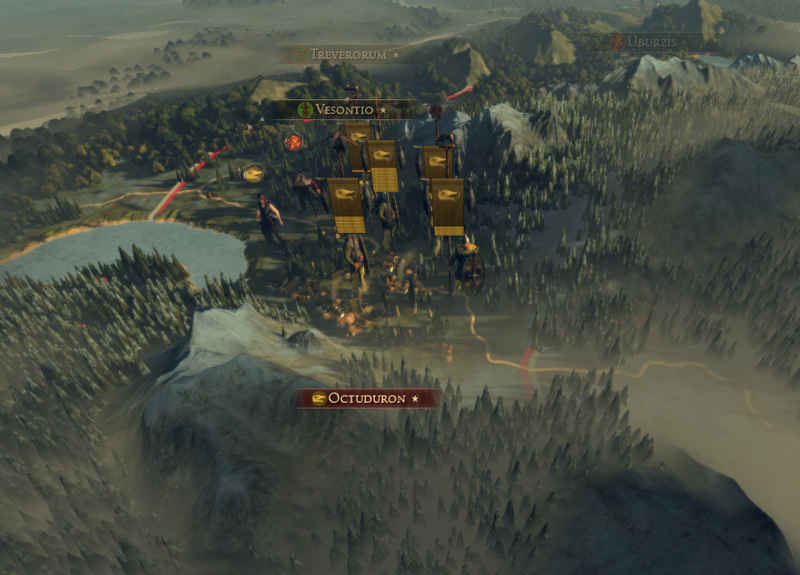 Budorgis fell quickly, but the Boii pleaded with us to end the war, offering us 1,000 gold pieces to end it before we did any more damage. 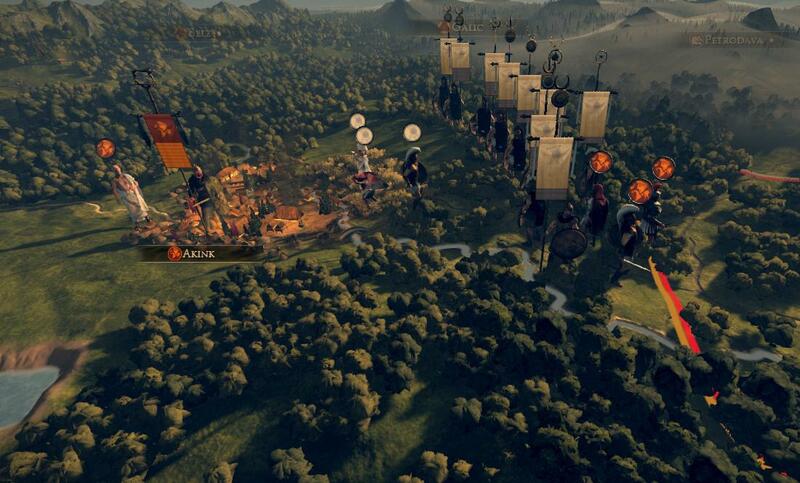 So we accepted, and used the time to reinforce our armies before we would launch the next attack. 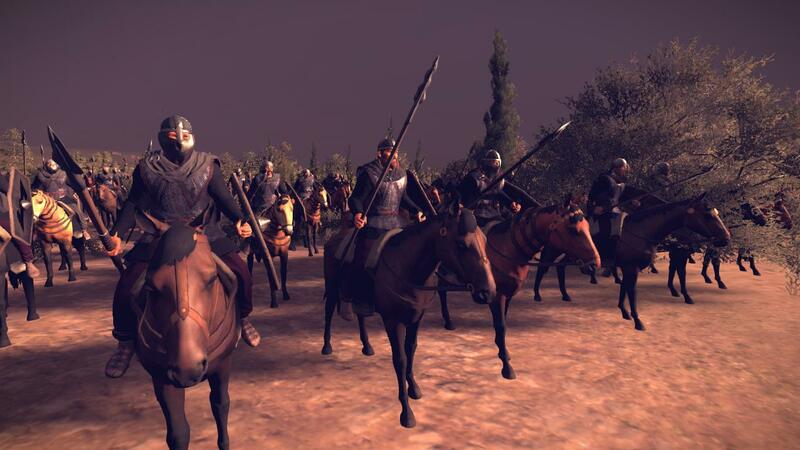 We sent an army under Leuthard, The Sacred Spears, to take over Istros, and I headed with my army to Belz. But to our dismay, the information on Belz was old, and a tribe from the East, the Budini, already took over. 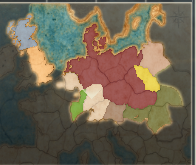 With the Boii out of the way and our borders secure for now, we look to the South, and towards our grand prize. And in the way of our prize lies many towns and villages, the first of which being the town of Uburzis, controlled by the Raeti tribe. I'm not concerned about them, because my spies report that they are short on food and their tiny army is famished. 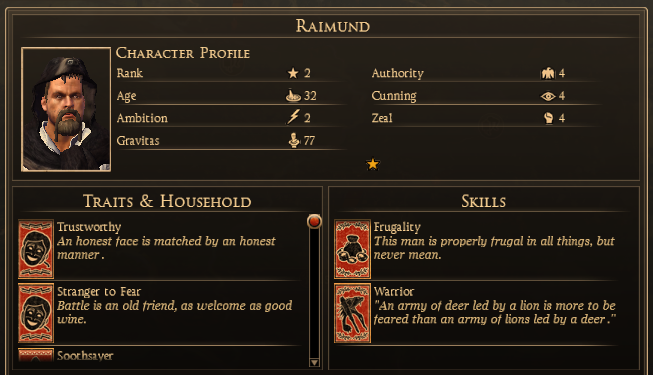 But my biggest rival, a chief named Raimund, wants to lead the attack and get the glory for himself. Unfortunately for me, Raimund ended up refusing command of the army that would take Uburzis. In the end I gave command to my youngest brother, Gundovald, who some people say looks like a younger version of me, which is understandable. 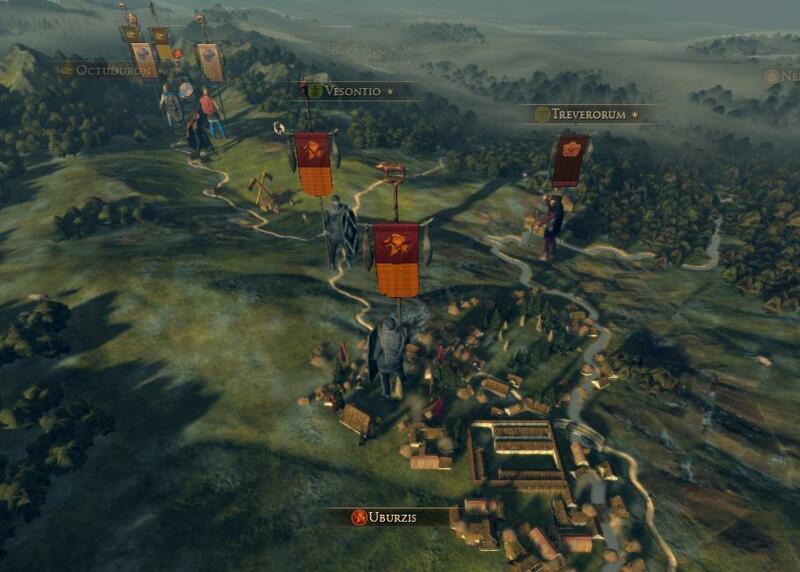 So now our forces were poised to easily take over Uburzis. 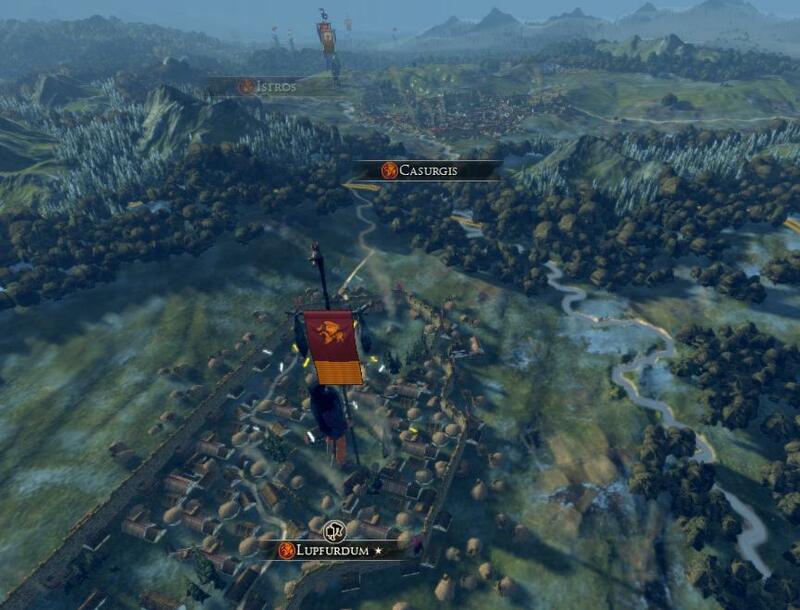 Gundovald would take Uburzis, and I would defeat the small army to the south of the town. We declared war, and Gundovald moved in. I should mention now that the Nori and the Helvetii tribes would now be coming to the aid of the Raeti. It was going to be an easy victory, and even though this was to be Gundovald’s first real battle, he wasn’t too nervous. Still, I decided to watch from the sideline to see how my brother would do. 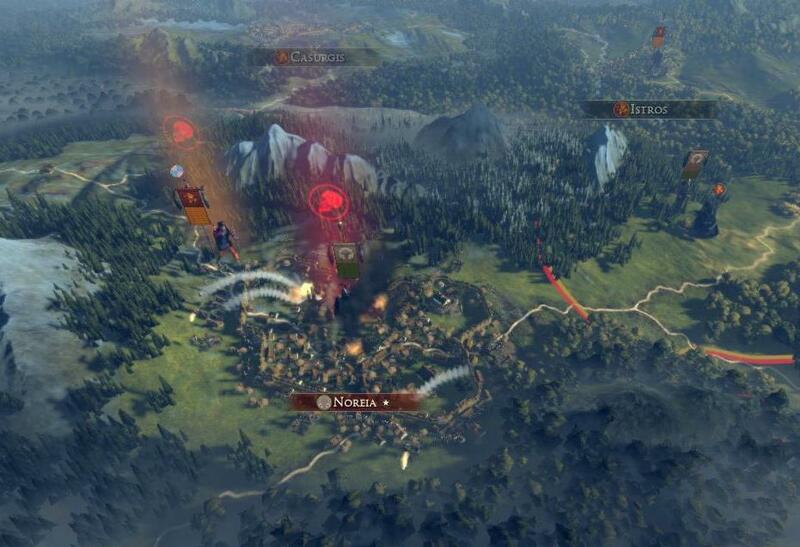 Because of our superior numbers, Gundovald decided to split his forces into three parts, so he could attack the town from three directions, forcing the enemy to split up. When everyone was in place, Gundovald sounded the general advance, and they charged. 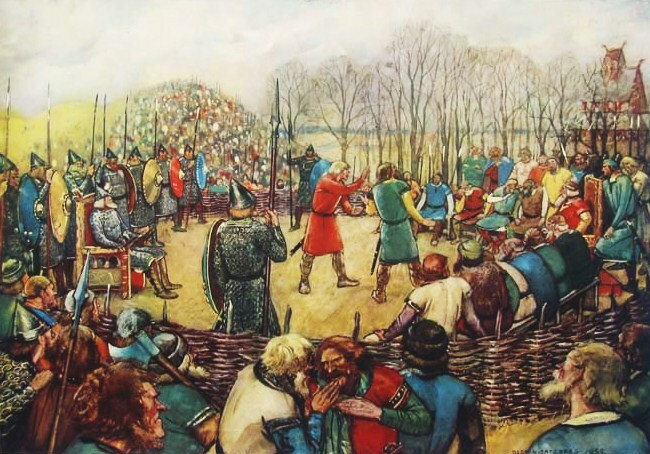 The Gallic tribesmen did not go down without a fight. They actually fought quite well. Our forces were a bit pinned down, and that’s when our third part of the army charged in to flank both of the sections that were tying up our forces. The battle ended quickly after that. 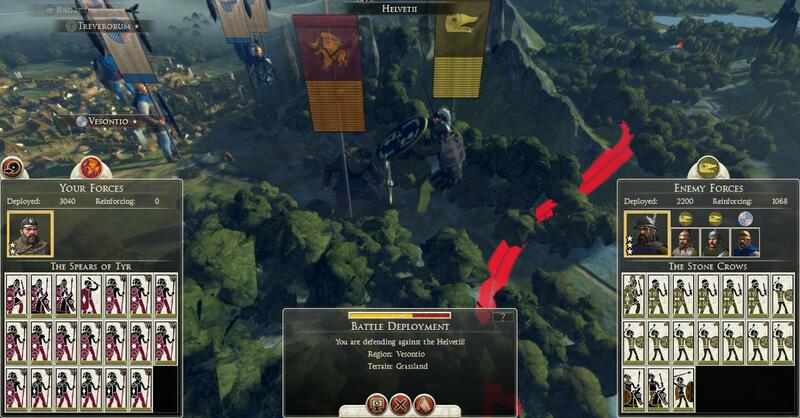 It was a good showing for Gundovald’s first battle, even if he did lose an entire unit in the battle. He wasn’t too happy about that, even though I explained that losing a unit or two in your first battle is nothing to be ashamed of, especially since he is so young. But comforting my youngest brother aside, I had to deal with the other Raeti army to the south. 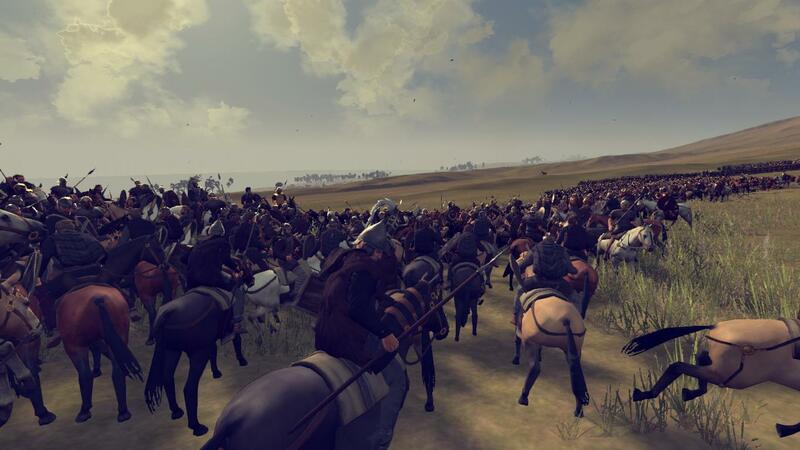 I saw a unit of Gallic cavalry charging forward, so I sent a unit of scout cavalry to deal with them. 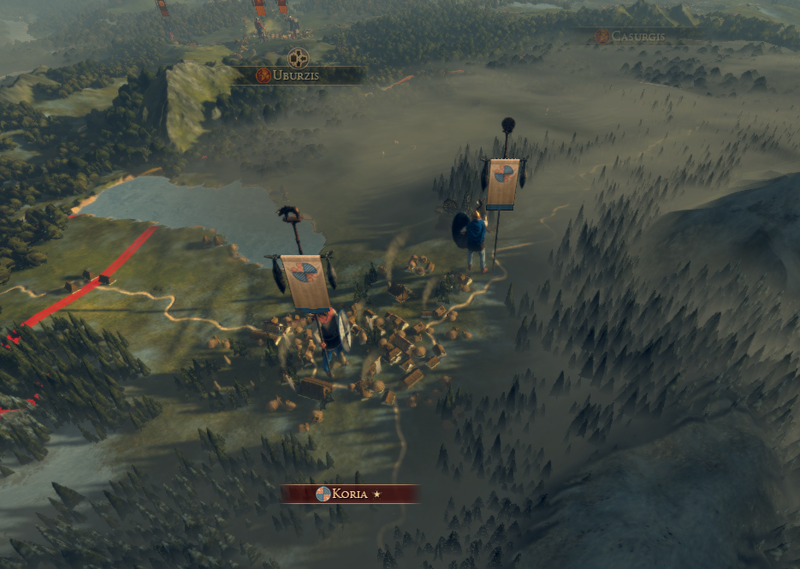 Big mistake on my part, I did not realize that the enemy cavalry was shock cavalry while the cavalry that I sent against them was not prepared to deal with them. It was too late to recall our cavalry, and the scout cavalry unit took heavy losses before other units could come to its rescue. 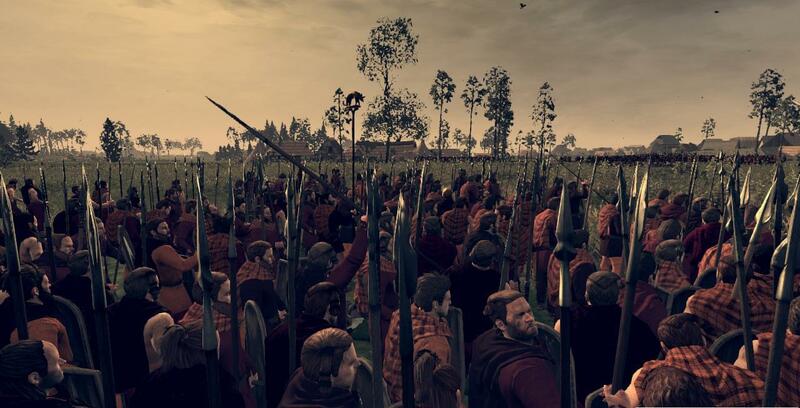 Then our main lines clashed together, Gallic spears breaking against Germanic shields. 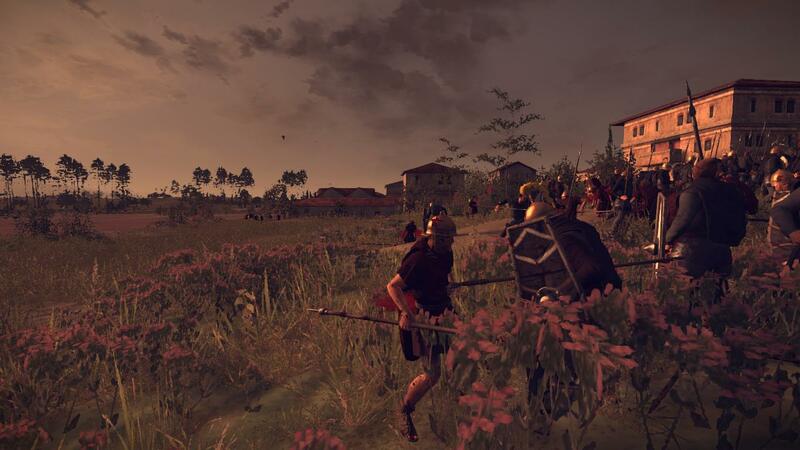 A unit of Spear Brothers was intercepted by the enemy general and was having trouble, due to the superior equipment of the Gallic general’s bodyguard. 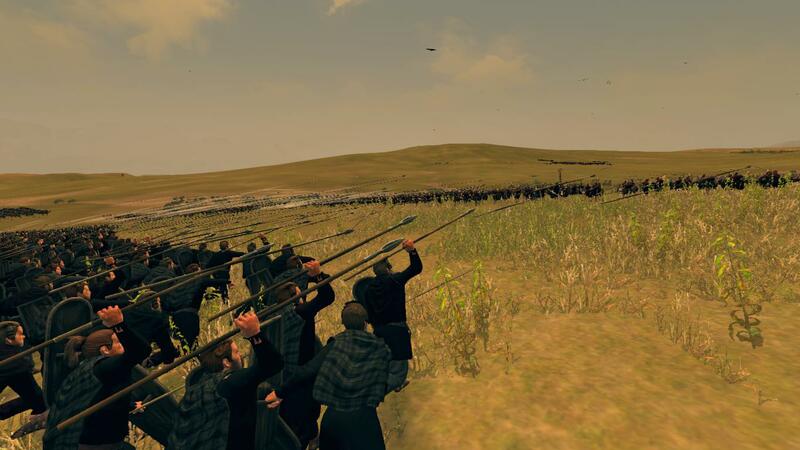 They began to waver, until a neighboring unit came to their rescue with a volley of javelins and then joining the melee. 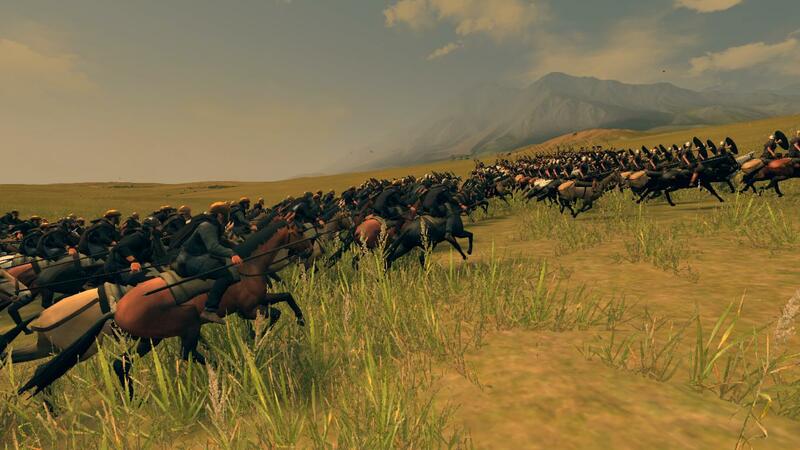 After a bit of a struggle, our forces began to route the enemy while our cavalry chased down the enemy units. Soon all the enemy forces were in full retreat, ending the battle with the only real casualties on our side being the unit of cavalry which I threw away unnecessarily. It was a great victory with minimal losses, but now we had to look further south, because while the Raeti were almost out of warriors, their allies, the Helvetii, were approaching with a large army. It was going to be an interesting next few weeks here, and I'm sure Wōdanaz will bless us again with victory. 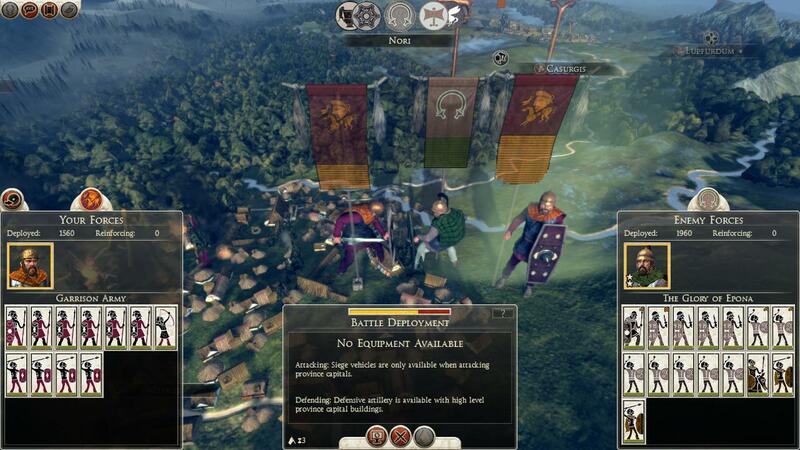 Quick authors note: I was actually surprised about the battle AI, it really shone through. 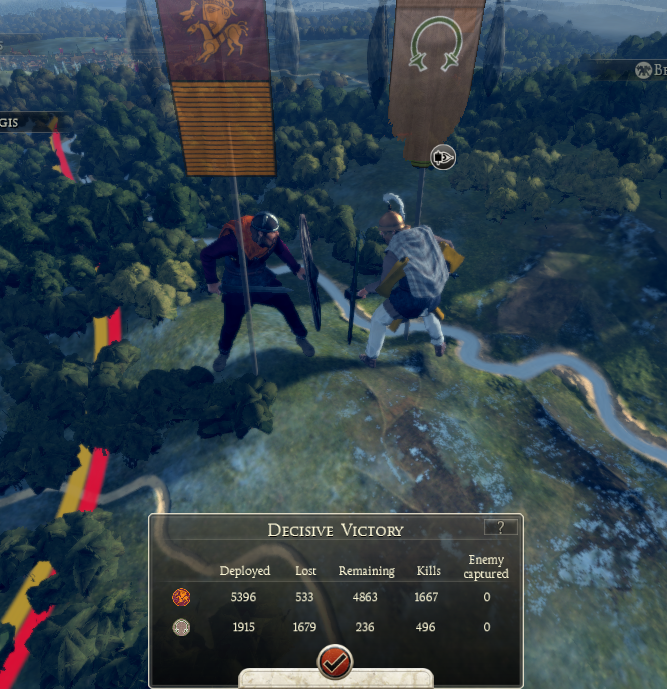 While it didn’t win, obviously, but it tried to flank me numerous times (such as the bodyguard unit, took one unit unawares) and used cavalry somewhat effectively, using the shock bonuses to its advantage. We thought that the Raeti would attack with the Helvetii backing them up, but we waited a few weeks in anticipation, but nothing ever came. We sent out our riders to check the passageway between the mountains where they would come from, and it was clear of enemy forces. We then sent spies to the neighboring enemy towns, and we found our enemy. The Raeti had fallen back to their last town, while the Helvetii, with their considerable strength, had pulled back to their town as well, seemingly abandoning their allies. And their other allies, the Nori, didn’t seem much of a threat. So I sent orders to my riders to continually patrol the border area to watch for enemy incursions, while I had to return to Lupfurdum. Raimund was stirring up trouble with the elder council, and I had to be there before any damage was done. When I arrived, I could tell that the other chiefs were looking very nervous. Raimund was standing at the front of the room, looking very cross. When he saw me, he quieted everyone down and began to speak, using grand gestures while he did so. He stared at me with cold eyes that could only belong to someone who is thirsty for power. How he knew about my aspirations about Rome, I do not know, but I had to think of something fast, because otherwise I would be totally emasculated in front of the people I could show no weakness to. I decided to come clean. Sometimes honesty is the best policy. Raimund glared at me, turned, and left the meeting. I won this battle, but I really need to keep my eye on Raimund. If I don’t, I could be seeing a full-fledged rebellion on my hands, and possibly, my death. But barring a full-fledged uprising, I shall continue to push south, towards the city of gold. *In Norse and Northern Germanic mythology, Jörmungandr is a giant sea serpent that Loki fathered, which circles the earth, keeping the oceans in by biting its tail. 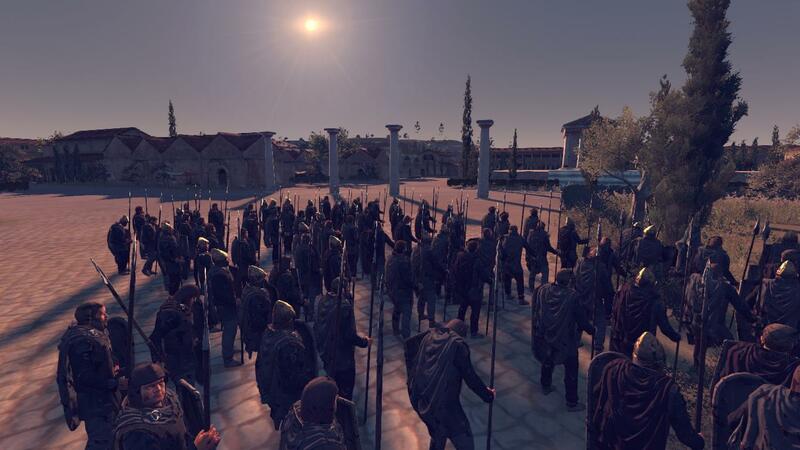 After the meeting with the elder council I headed back to my army, and prepared to invade the Raeti territory. But before we could launch the attack, a rider came back from Casurgis with an urgent message. A Nori army was approaching, seemingly headed for Lupfurdum. The message said that they had already recalled the Bloodsworn, under Ricfried to the capital city in a forced march. While the added numbers is certainly helpful, the Bloodsworn were exhausted, so their performance in battle will suffer. In addition, the Sacred Spears were sent to intercept the Nori army. 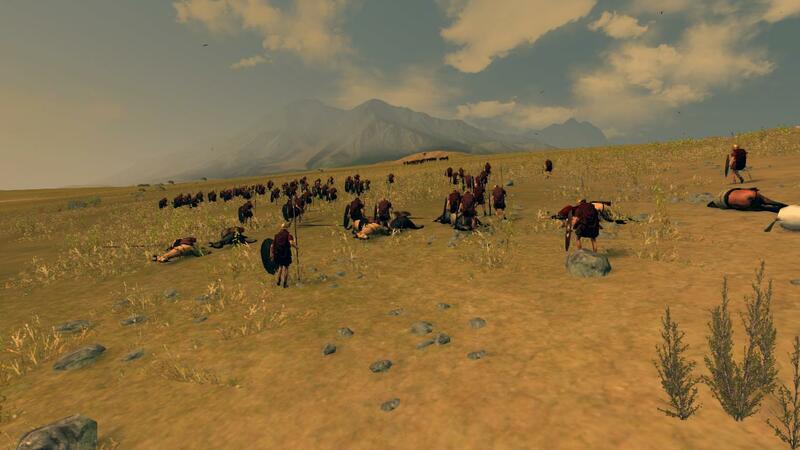 The Nori army retreated north of Istros, and the Sacred Spears followed, seemingly cornering them. 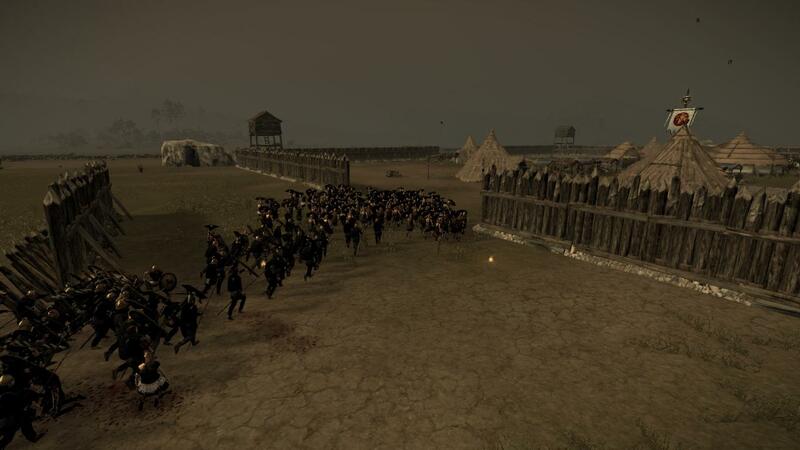 Our scouts reported more enemy forces at the border, so I set out with my army to counter them. 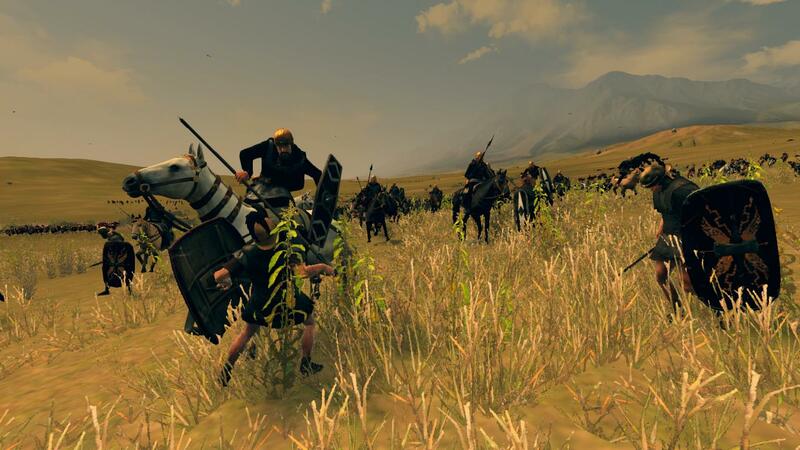 While we were on the march a rider arrived, saying that Istos had come under attack by the Nori army. 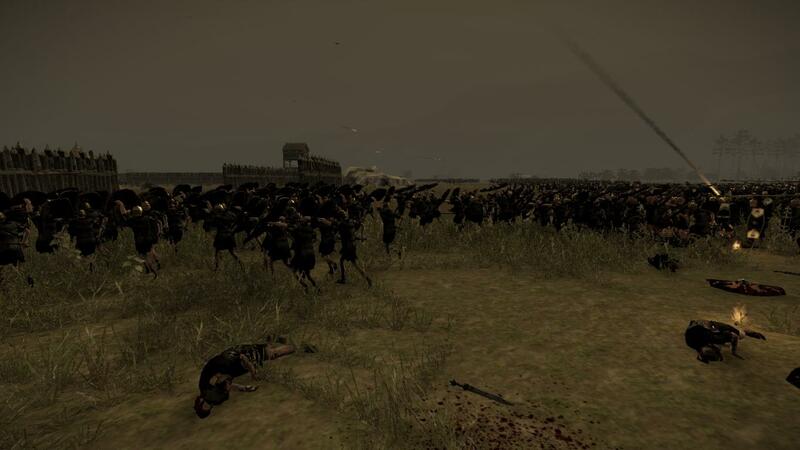 How they got past the Sacred Spears, I do not know, and why they were not able to come to the rescue of the small town garrison I do not know, but whatever happened, the Nori army snuck around our forces and was able to attack the lightly defended Istros without threat from the Sacred Spears. 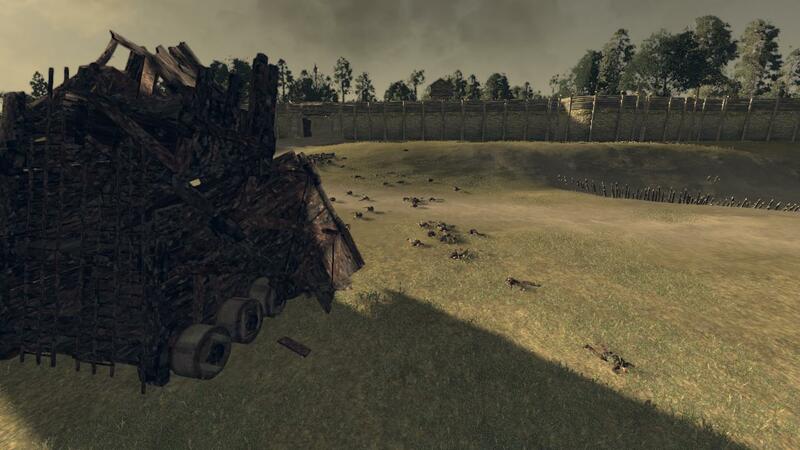 The small garrison had little hope of survival, but was intent on inflicting as many casualties as possible, forming shield walls in an effort to hold out as long as possible. But it was impossible for mere tribesmen to hold back the surge of enemy soldiers, most of which were much better equipped. It was only a few minutes before they had broken through our lines. Frantically we tried to plug the lines, trying to create choke points to trap them in, but there were simply too many of them. Soon the garrison was trying desperately to flee, but they were mopped up by enemy forces. None survived. 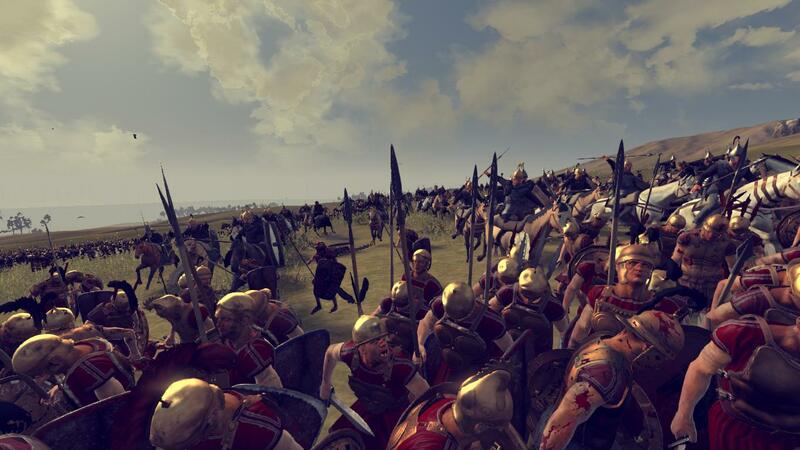 Reeling from this defeat, I turned my army towards Istros, determined to kick the Nori out of Istros. 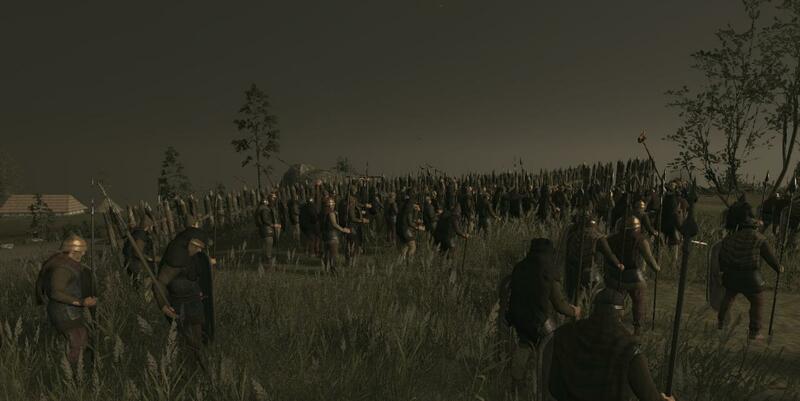 The Nori army wisely decided to meet us on an open field for battle, not wanting to get penned in within the confines of the town. 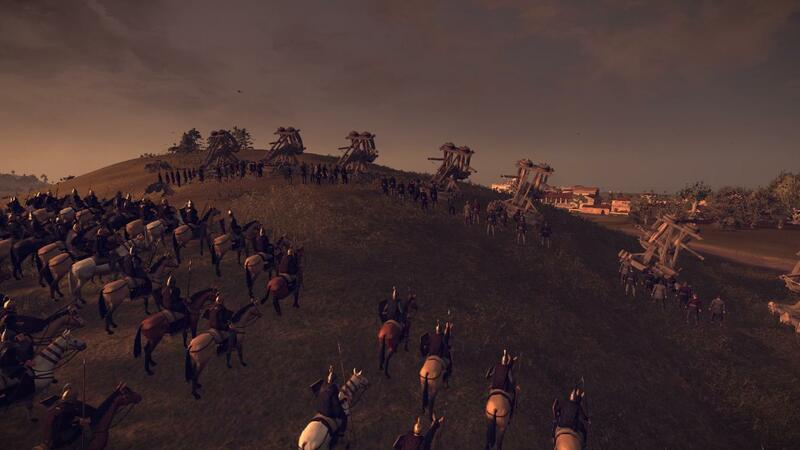 With our new heavy cavalry and better equipment, we made an impressive force, forming up from the south. The Sacred Spears, eager to atone for letting the Nori evade them, joined the battle, forming up from the east, leaving the Nori trapped in the northeast part of the battlefield. I split my force in half. 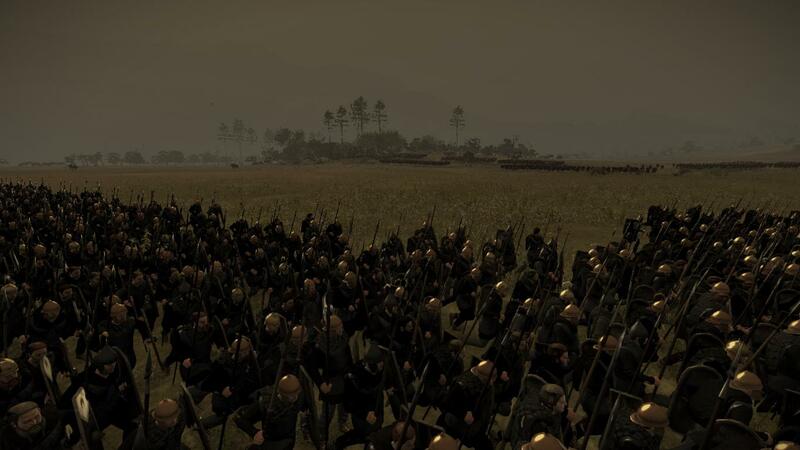 Half of my forces slowly advanced through the forest, hidden, to surprise the Nori on the flanks, while the other half, combined with the forces from the Sacred Spears, distracted the Nori forces from the front. We charged, our lines in a fierce melee erupted. The battle was beginning to stall when I sent in the hidden forces to flank the Nori. 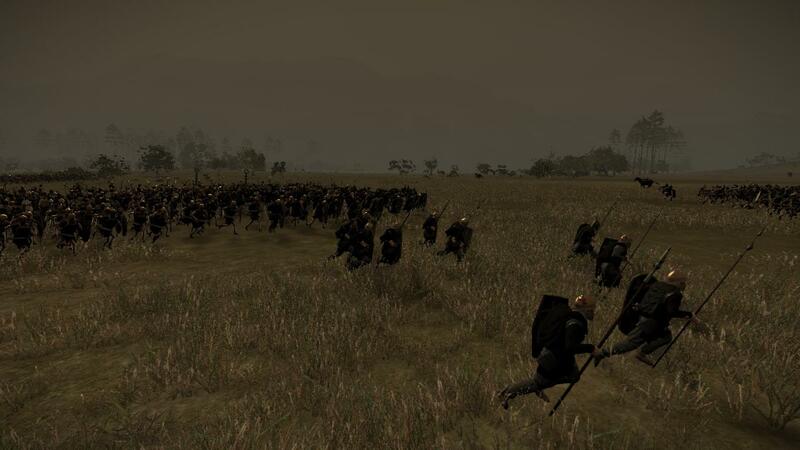 The Nori were surrounded, and it didn’t take long for them to rout, only to be chased down by our cavalry. 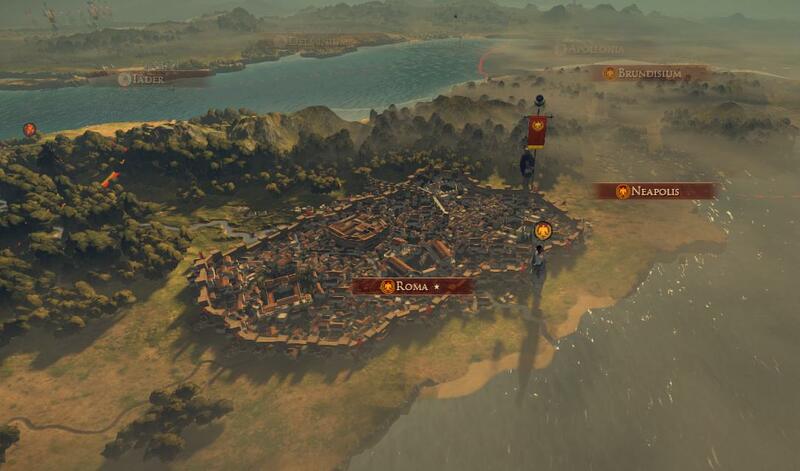 With the victory, we easily took back the town of Istros, and now we could look to the south to make the Nori pay for everything they have done. 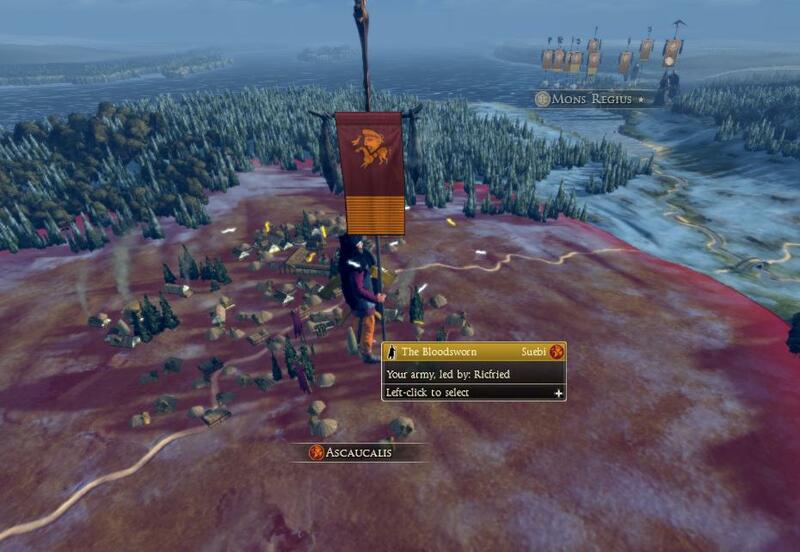 After the battle at Luna Silva I decided to press my advantage, and we marched on Akink, which at the time was only defended by a small garrison. 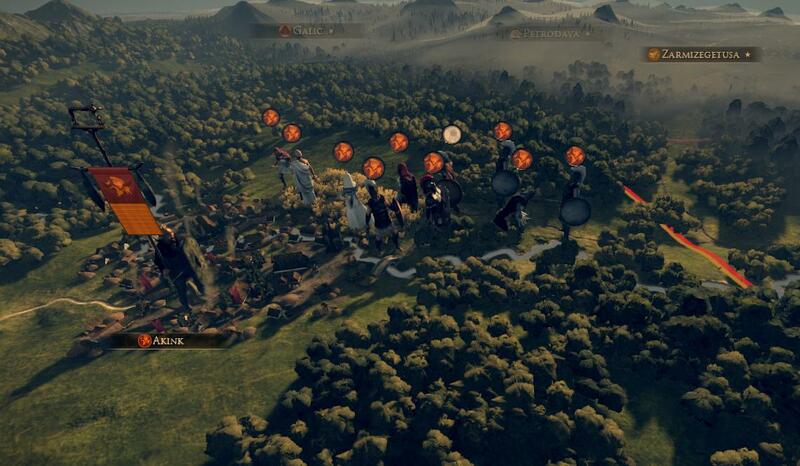 Because of our superior numbers, we would split our forces again to surround them. With our warriors attacking from all sides, it didn’t take long for the Nori to capitulate, and while our cavalry chased down the survivors, we rejoiced. It was a very easy victory, we lost a mere twenty men, six of which was from friendly fire. I did my usual walk through the town, inspecting it to see what we could gain from this settlement. We usually just occupy the towns we capture, but there was this voice I kept hearing telling me otherwise. It kept telling me that I should sack and burn the town, leaving it in the dust. There is nothing in this town for us. No resources, no major supply of iron, nothing. There isn’t even that much gold here. Why should we keep it? There is no reason. We shall sack it, take everything they have, and burn it to the ground. I tried to put them aside, but they got louder. Clearly this is a sign from Wōdanaz. He is speaking to me, I must follow his words. So I did, I sacked the town, despite the protest of my captains. The voices stopped. It must means that I have pleased Wōdanaz. It wasn’t until later when I realized what I had done, and decided to help rebuild the town. We would keep the town, and I would personally oversee the rebuilding of the town. Meanwhile, we got word how the Helvetii had declared war on one of their neighbors, so that removed most of the Helvetii threat. A rider arrived sending report of a Raeti army at the border. We were raising an army at Casurgis. The army would be led by Raimund. 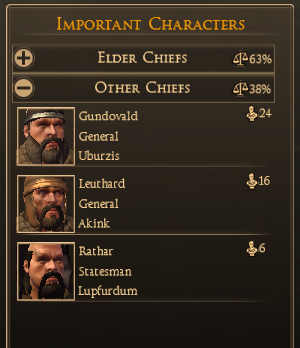 It’s not my choice of commanders, but the elder council was pressuring me, so I must oblige. A few weeks pass, as the rebuilding of Akink continued, I awaited word on Raimund’s success over the Raeti army. 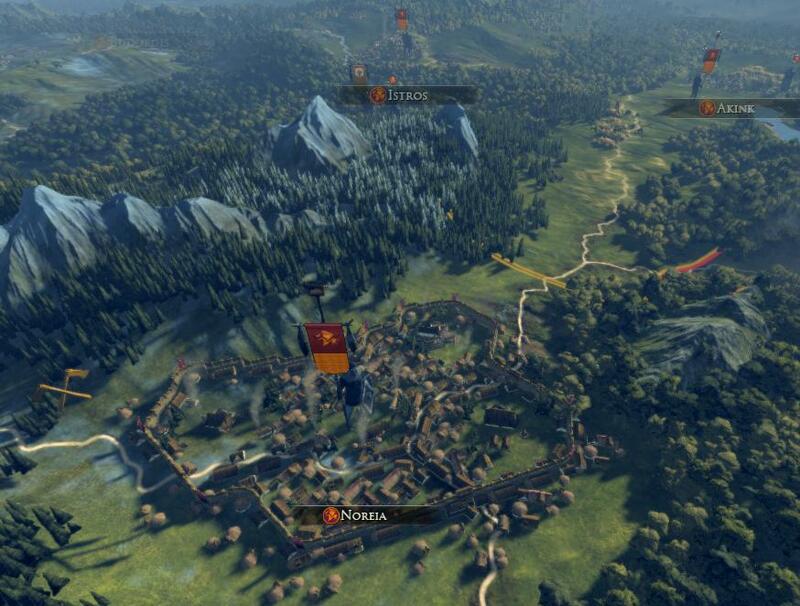 I read reports that it was a small army so I did not expect Raimund to have much of a problem with it, but a week later I received word that Raimund had chased the Raeti all the way to the Nori town of Noreia, which was defended by a large Nori army, and was besieging the town. To increase his forces, Raimund had recruited over four hundred mercenaries to assist him, costing us over one thousand gold pieces. And even with the added manpower, Raimund was in danger of being defeated by the numerically superior Nori forces. I fear for our warriors who had no choice but to follow that foolish man into war. Raimund, what have you done?! The voice in my head told me things. Things about my enemies, my rivals. About Raimund. It told me that he was a braggart who was thirsty for glory, and nothing else. I needed to exploit this. 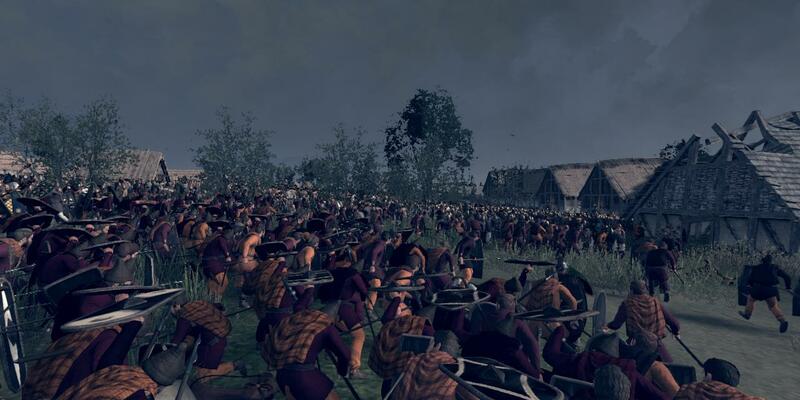 Maybe I would ignore Raimunds army, ignore their plight, even though there was a large army approaching them to reinforce the garrison at Noreia. But it told me that I must help my fellow Suebi. So I must go. So I led my army, renamed The Champions of Wōdanaz, to attack the army that was headed to reinforce the Nori garrison. It was early morning that we formed up to face the Nori. We charged, and the battle began. The battle didn’t take too long, the Nori lines crumbled fairly quickly, and our cavalry cleaned up the routers. It was a surprisingly easy victory. It was soon afterwards that we learned of what happened at Noreia. Due to losing the relief army, the garrison decided to wait it out, but when they were about to lose their food supplies, they had to sally. Raimund wisely decided that an assault on the city would not bode well. The enemy offered battle on a foggy day, choosing that day to help conceal their movement. The initial enemy force to counter us was a very small one, consisting of mainly ill-equipped tribesmen who routed fairly quickly. 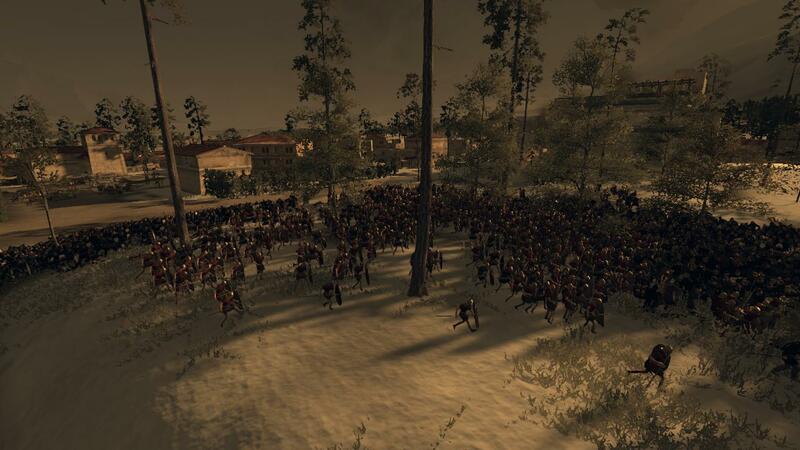 The army reformed to meet the much larger part of the enemy army. But from all accounts, Raimund and his guard charged forward without waiting for the rest of the army, apparently looking to win glory. They soon found themselves in a vicious melee alone, surrounded by enemy soldiers. It was soon afterwards that people tell me that Raimund fell from a Nori sword. The rest of the army arrived soon afterwards, and drove back the enemy forces. 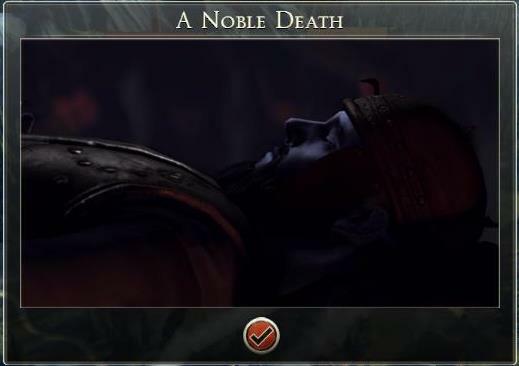 The loss of Raimund was taken as a grievous loss for most of the Suebi, but for me, I was glad that his arrogance had gotten the better of him. And on top of that we had taken the Nori capital with minimal losses. It was a great victory, for both the Suebi, and especially for me. Soon after the victory at Noreia, I was poisoned. I'm not sure how exactly, but I was feasting with some of the elders from Akink, when we all started to become sick. One of the elders eventually died, though thankfully the doctors told me that I will be okay, even though I won’t be feeling well for the next few weeks. We were able to find the person who tried to poison us; he was a Nori sympathizer who was paid by the Nori to put some sort of plant in our food which was supposed to kill us. Thank the gods that he failed. 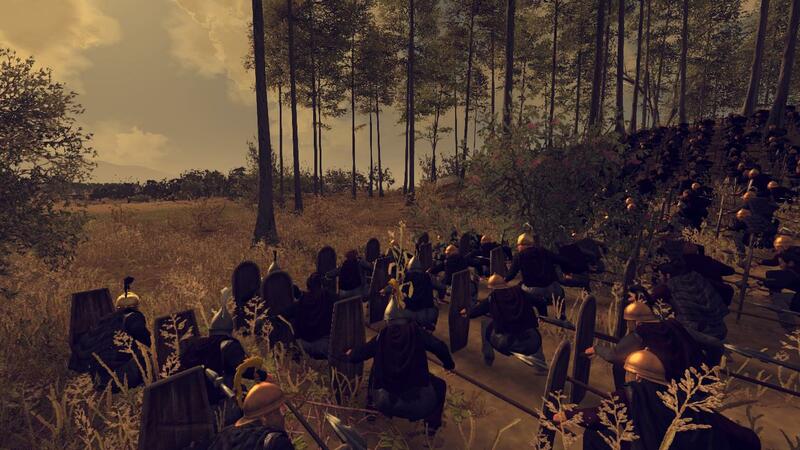 While I was resting, I decided to meet with my armorers on how to better equip my army. 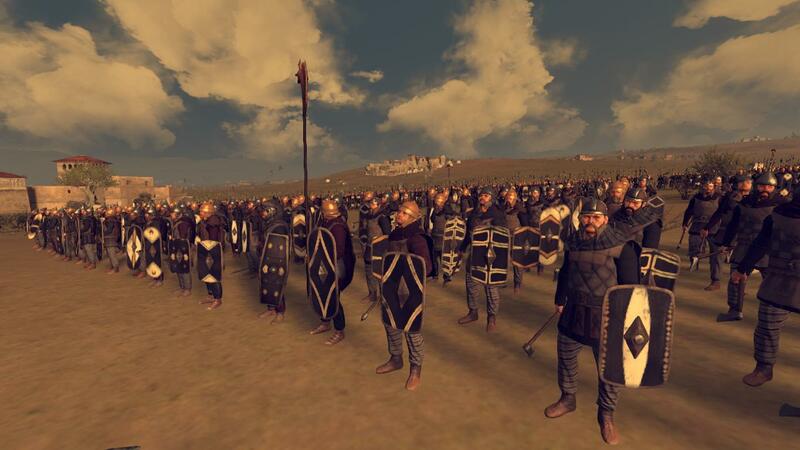 With the money we have accumulated from our conquests and new discoveries in iron smithing, we have been giving our levies leather armor with metal plates while giving our Spear Brothers chain mail, and after capturing many Gallic helmets, we now had enough of them to give to most of our warriors. With these improvements, our warriors now could face our more armored enemies. When we interrogated one of our Gallic prisoners on how they learned about their armor, and they told us that the Romans taught them. 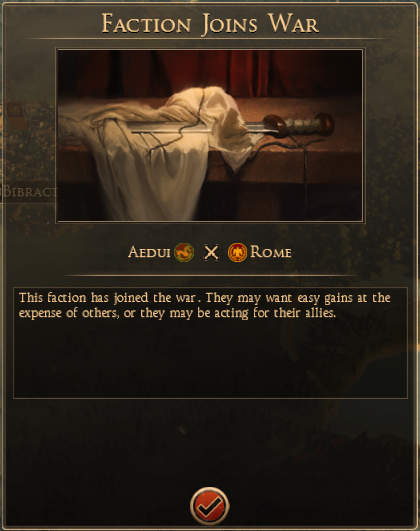 Clearly these changes are needed if we want to take on Rome. After I recuperated, I began making plans. 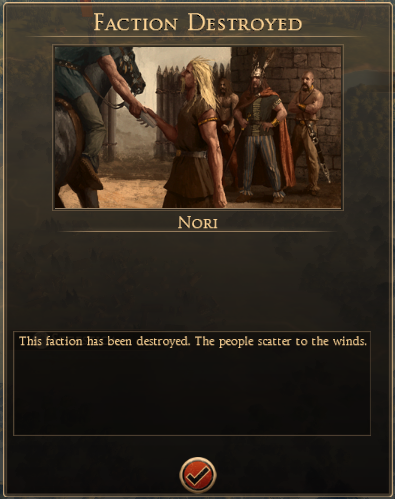 We would need to remove the Nori nuisance before we could address the other problems to the west, or the southern settlements would be constantly harassed by the Nori. They only had one settlement left, Segestica, so it was quite obvious where I would be heading next. One of my most trusted agents, a woman by the name of Hatilde, defected to the Nori. Why she would do such a thing and betray her people is beyond my understanding, and I am sure the Gods have her punishment ready for her when she dies. But it seems as if the Gods have already begun their punishment for her. 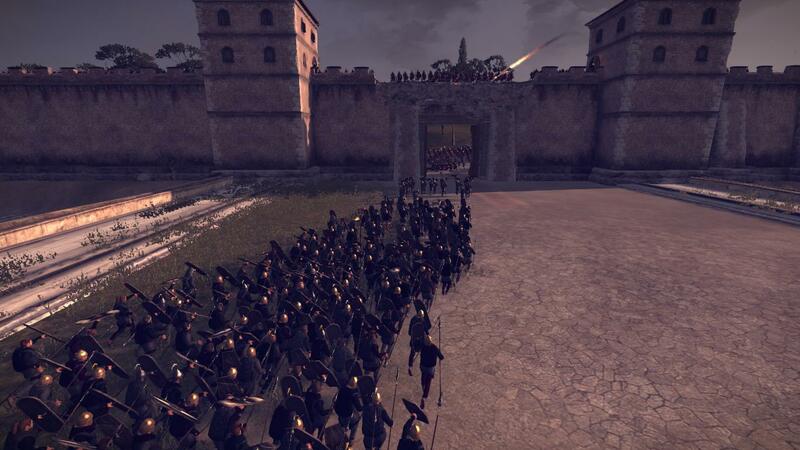 As my army was forming up for the march, we received word from our friends to the south, the Ardiaei, have already attacked Segestica, and have destroyed the last bastion of the Nori. 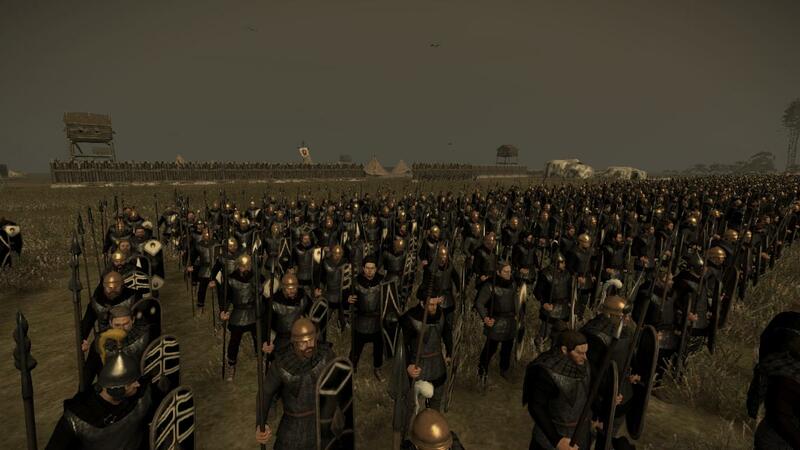 So I turned my army around and we marched towards the Raetii capital of Koria. Why they picked a small town as their capital I do not understand, but we offered battle, and the Raetii responded, albeit feebly. 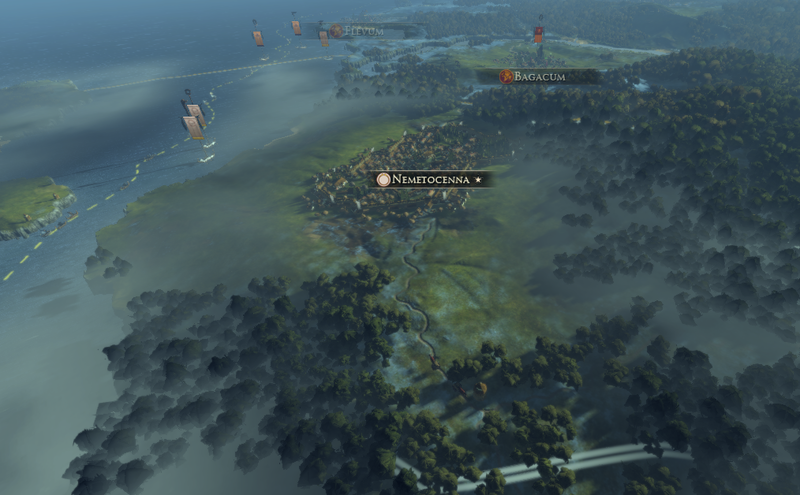 I purposely gave battle on a day with a heavy fog to instill fear into their hearts. It seemed to have worked, as they were only able to inflict twelve casualties on us before they fled. And it was then our scouts reported the sighting of the people we have heard of for decades- the Romans. 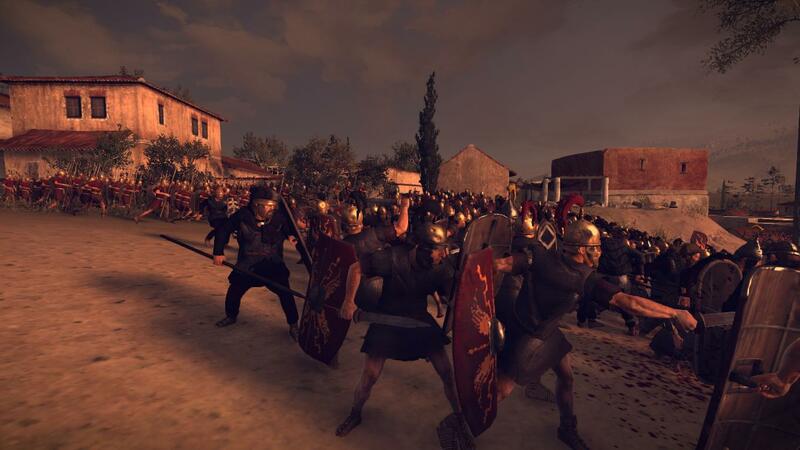 There was a massive Roman force around the neighboring city of Medhlan, so we would need to beef up our forces before we can move against them. In the meantime, we sent our diplomats to arrange for a non-aggression pact to buy us some time. This means we must end this war with the Raetii and the Helvetii. To do so, I plan on sending The Spears of Tyr, led by Gundovald, against the last Raetii town of Vesontio, and the Bloodsworn, led by Ricfried, against the Helvetii town of Bagacum. Ending this war quickly is essential. Not only because the Romans are a considerable threat, but because politically things were not looking good. My family was gaining influence, while the others were losing support. I fear that a civil war is brewing, and I do not want to be caught unprepared. 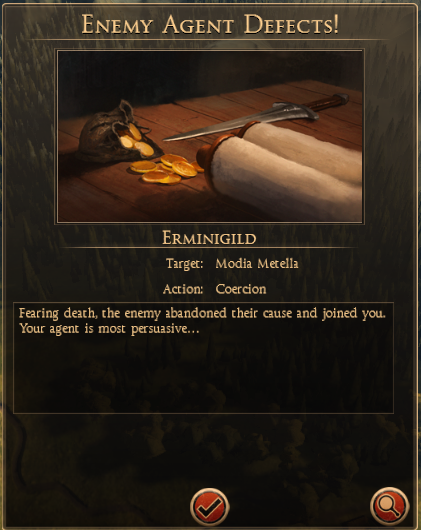 Since Gundovald was the new leader of the opposing families after Raimund was killed, I have to keep my eye on him, but considering the amount of gravitas he has, I'm not as worried about him as I was with Raimund. In addition, Gundovald is a lot more cautious than Raimund or Karl was, and the chances of him dying in battle are a lot slimmer, and as such, that makes him dangerous. Writers note: A few new mods were added. 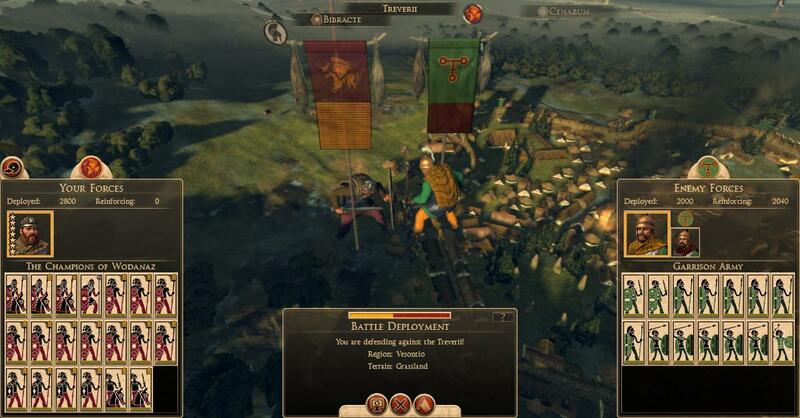 I added a mod that introduced new units for the "barbarians," a mod that gave some of my units armor, as mentioned in chapter seven, and finally a mod which recolored my units to something less orange. And this is on top of already using Radious's mods. The Spears of Tyr marched towards Vesontio. Their scouts reported a relatively light enemy force around the city, so Gundovald continued on towards the city, seemingly unaware of the Helvetii army coming down upon him. They offered battle, along with their Raetii allies. 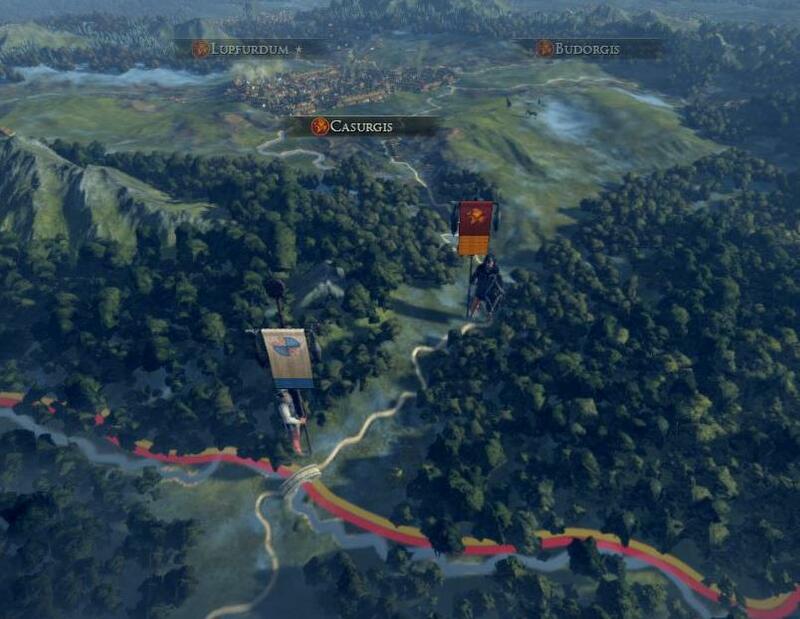 The enemy armies approached from two separate directions, obviously trying to split us and weaken us. 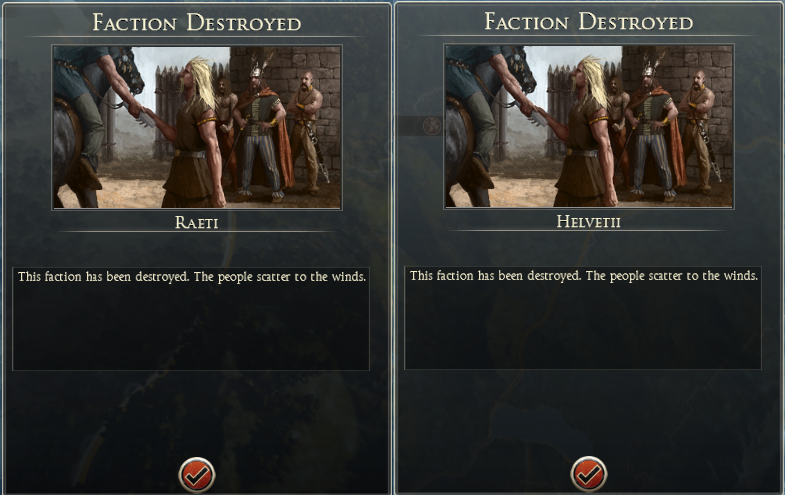 From all accounts it worked, splitting the Spears of Tyr in half, with one half dealing with the Raetii army and the other with the Helvetii. A Helvetii cavalry charge from the rear on the right flank was stopped by a unit of our Noble Cavalry, but they sustained casualties while doing so. The left flank was essentially held up by an elite Raetii unit that fought to the death, taking over two hundred of our warriors with them. But what really put us in trouble were the slingers that the Helvetii and Raetii units had fielded which rained death on our flanks. Our infantry was tied down fighting the very stubborn Celtic infantry. We didn’t have enough cavalry to chase down all the slingers and to deal with the enemy cavalry, and to defeat the elite units we had to surround them. So when we would surround them the slingers would mow us down from the back, and then would attack the cavalry when they were chased after since they couldn’t all be chased after at once. As said, we didn’t have enough to chase down all the slingers rapidly, so that resulted in hundreds of casualties from their slingers. Eventually the left flank defeated the Raetii elite unit and was able to come into assist the right flank by taking out their slingers, but not before Gundovald had to charge in to assist the line with the Helvetii. Eventually the tide turned and our men were able to defeat the Helvetii by slowly surrounding them and finishing them off with a well-timed cavalry charge. 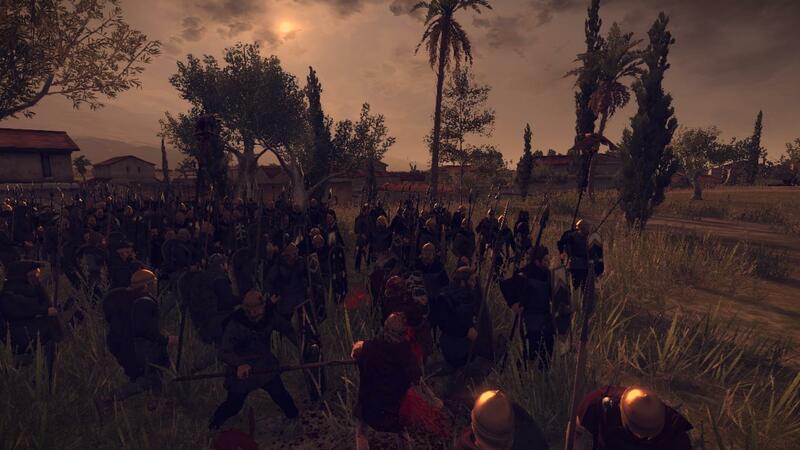 It was a very costly victory; about half of the army was dead or wounded, but we had defeated a large Helvetii force. In his after-action report to me, Gundovald mentioned that we had to remove the levies from our offensive armies; they broke too quickly and sustain too many casualties in battle. Of the six units of levies in his army, three had been totally annihilated and the other three had been decimated to the point that they were combat ineffective. This made me realize that the four units of levies in my army, while extremely experienced, might also be a liability. When we were not at war I will replace them, but for now, I do not have the time nor funds to replace them. But our vulnerability was plain to see, and the remaining Raetii forces, quite large when put together, seized that opportunity and attacked our exhausted force. They retreated as far as they could before the enemy finally caught up with them. The survivors tell us there was a very grim atmosphere among the remaining warriors. The night before there was a light snowfall, leaving the battlefield looking very depressing, as each man contemplated his fate. 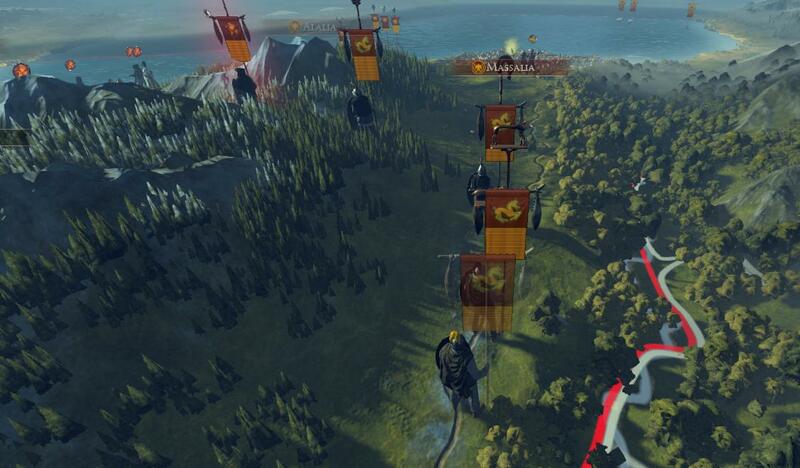 Gundovald, aware of their impending doom, initially decided to make a giant shield wall. But once again, the enemy forces were split. The large Raetii force was a ways off, and the much smaller Helvetii force was quite close. So Gundovald made the decision to take on the Helvetii force first before dealing with the Raetii. And he had to do it quickly, because the Raetii army was fast approaching. It wasn’t long before they arrived, and Gundovald was still in the middle of defeating the Helvetii. There was very little that our warriors could do but fight as long as they could. Initially it looked like we might actually pull off a victory, but fresh Raetii warriors entered the fray, and we were doomed. There were simply too many of them for us to fight, and too few of us. It was about this time when Gundovald died valiantly in battle. While he was the head of the opposing family, I harbored no resentment against him like I did Karl or Raimund. He was a good man, and a loss for our nation. The Spears of Tyr were totally trounced. There were only 85 men remaining of the over 3,000 that left a few weeks before, so confident of victory. 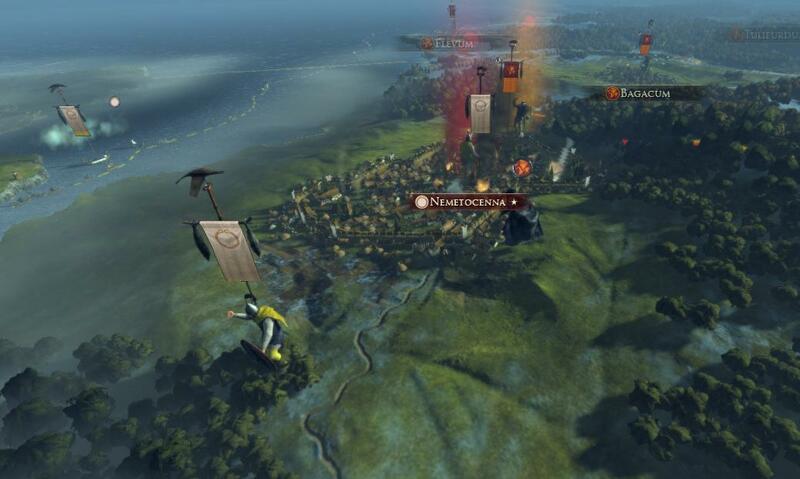 Was it hubris, or just bad luck of being attacked by massive enemy armies multiple times without being able to retreat and recover? 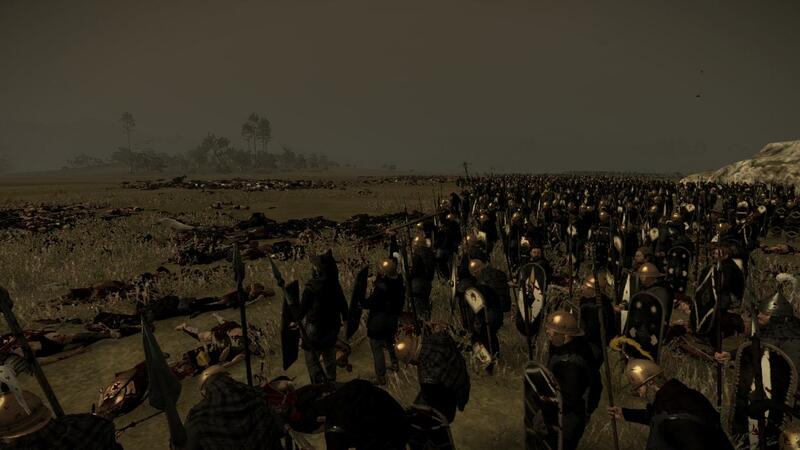 Hearing of the defeat, the Bloodsworn headed to avenge the loss of our brothers, and the Spears of Tyr were resurrected back in our home province, for we would not allow those filthy Celts to forever tarnish the name of one of our armies. We would get revenge on the Helvetii and Raetii. I might be getting old, as my 50th winter is fast approaching, but I will see the Helvetii and Raetii destroyed before I die. With Vesonito taken by friendly armies, we headed for the final Helvetii town: Octuduron. Not wanting to head into the same trap that Gundovald fell into, we sent our scouts ahead. What they reported was disturbing. 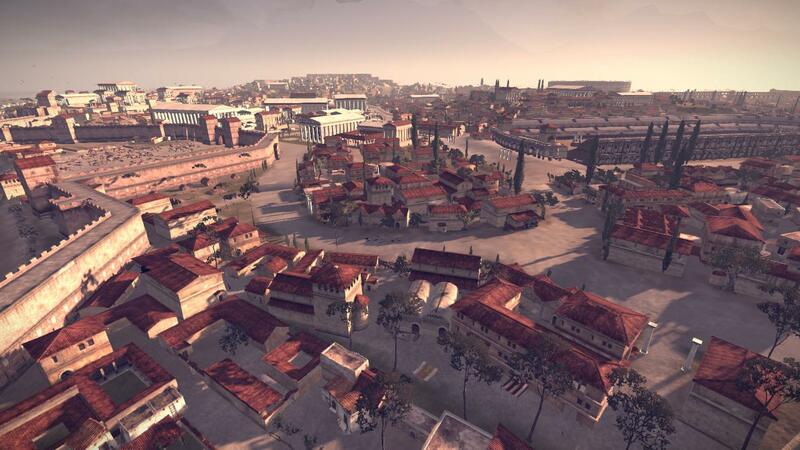 The Romans had taken over the town, eliminating the Helvetii. 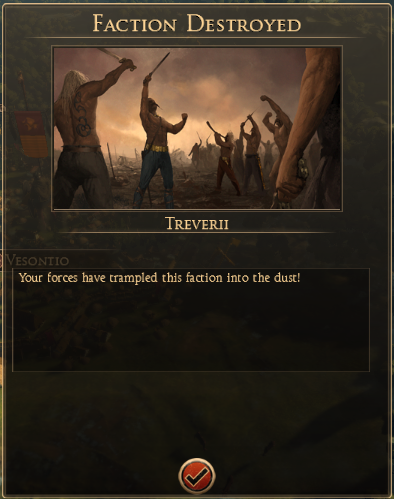 At the same time, we got word that the Treverii, the Gallic nation that took over Vesonito, had defeated the last of the Raetii. A war that had lasted almost ten years was finally over. We were now in a very interesting situation. To our south were the Romans, a very formidable threat. To our west were the Treverii, who were a growing, but not quite daunting, threat. 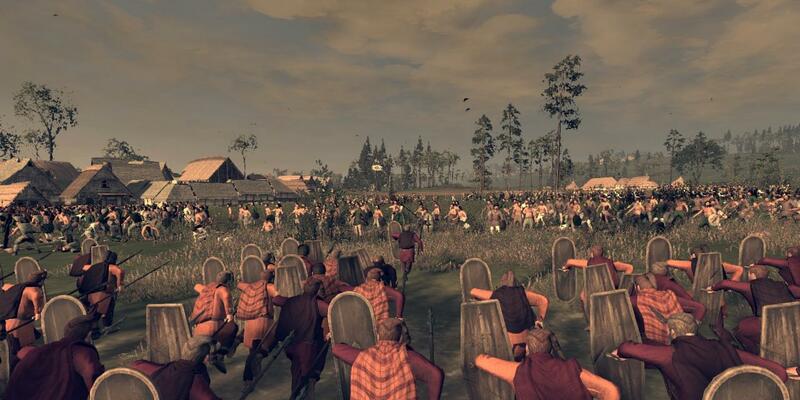 I met with Ricfried and Baldovin, my best generals, on what they thought we should do. It is a very daunting issue, as either path puts us into a difficult war. 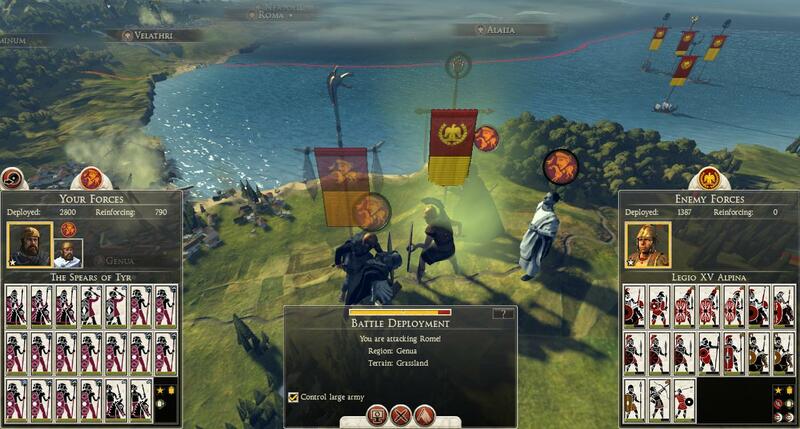 Baldovin said that we should attack the Romans first, as they are more of the threat. 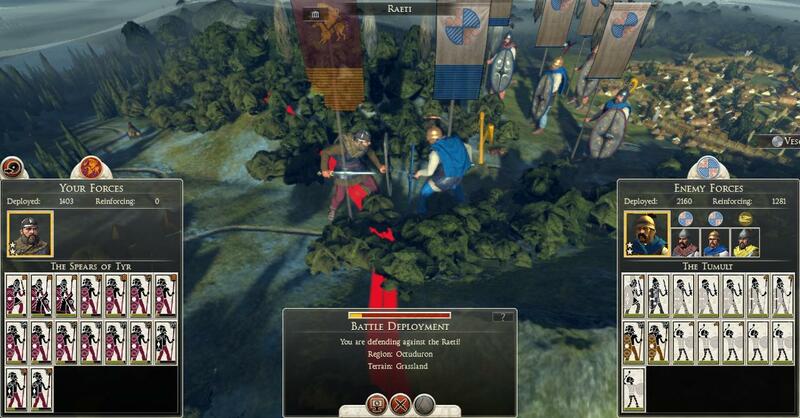 Our relations with the Treverii are stable for now, and they seem to be attacking towards their western neighbors. But Ricfried argued that we must take out the Treverii first. 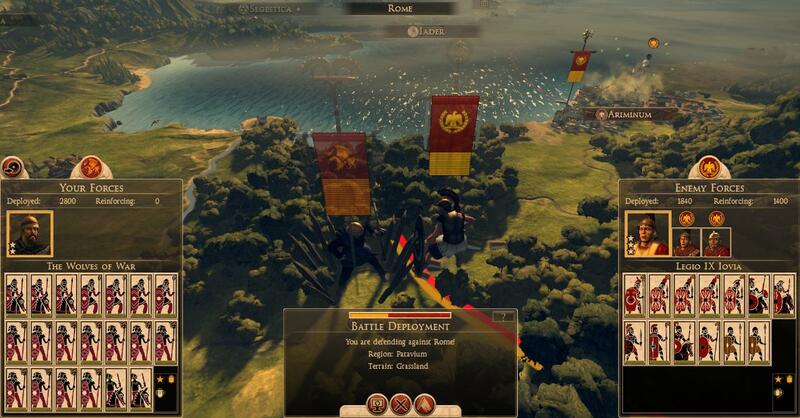 More land, more money, more armies to fight Rome with. And besides, how long would it be before the Treverii attack? Their war with the western Gallic tribes wouldn’t last long, and then what? We would undoubtedly be their next target. 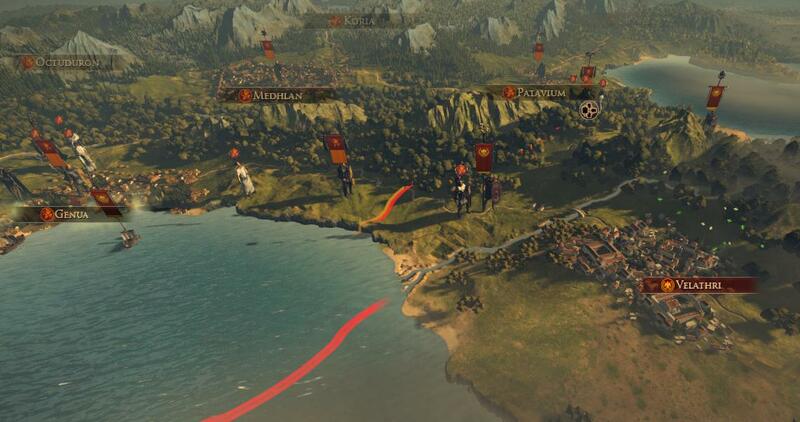 Although the Romans might get to them first, but I doubt it, the Romans just started a war with the Avernii. We ended up deciding to head into Treverii territory. From our information, they only have three or four territories. If we strike hard and fast we can take their towns and cripple them quickly before they can launch a meaningful counter-attack. Soon after our meeting, some thugs ambushed Ricfried and his guards. They were able to fight them off, but Ricfried suffered an arrow to the knee, so one of his captains took over the Bloodsworn as he recovered. 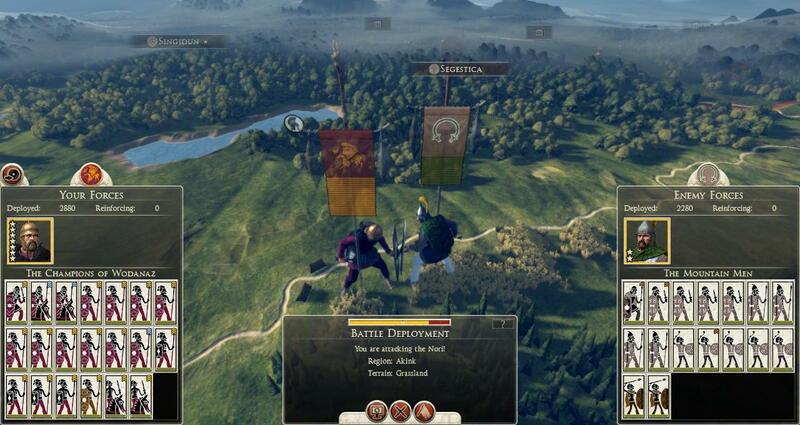 We could not launch our invasion as he was recovering, plus a reserve army was being mustered. 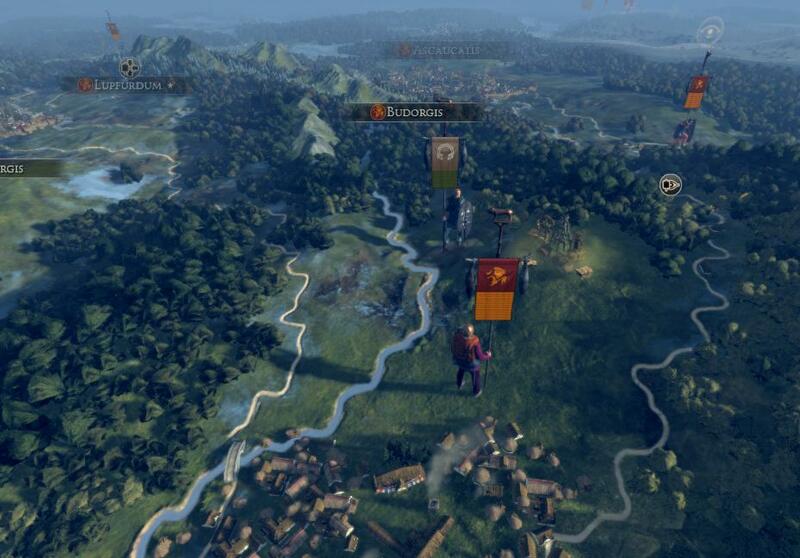 So in the meantime, we sent our spies to scout out the lands further into central Gaul. We found that the Romans had taken a key Gallic town, Bibracte, as well as the Treverii were beefing up their defenses, seemingly aware of our impending attack. We couldn’t delay forever, so as soon as Ricfried could walk we launched the invasion. 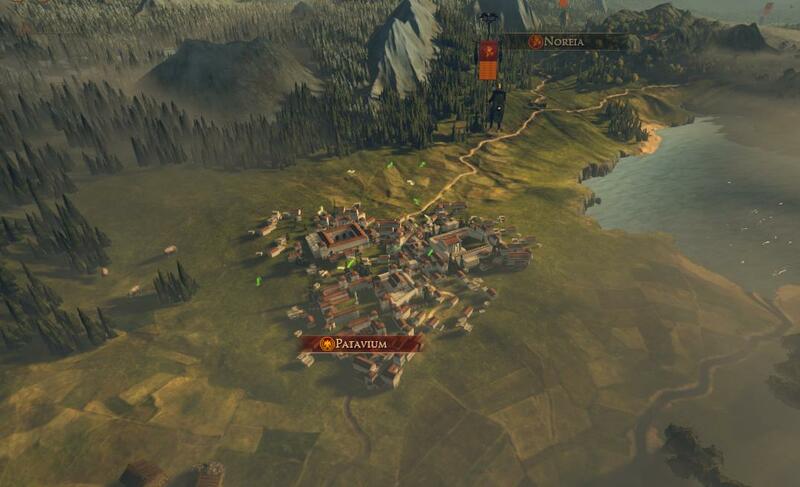 We would hit Bagacum and then Treverorum soon after, in order to take away most of their sources of income from those towns and isolate their final town of Vesontio. Ricfried reached Bagacum first. Resistance in the town was light, and it fell easily. Clearly the town wasn’t important enough for them to defend heavily like their other towns. It was an easy victory, but I had a feeling that the rest of them wouldn’t be as effortless. Authors note: Sorry for the relatively short update, its been an absolutely insane week for me. I hope to update again tomorrow. 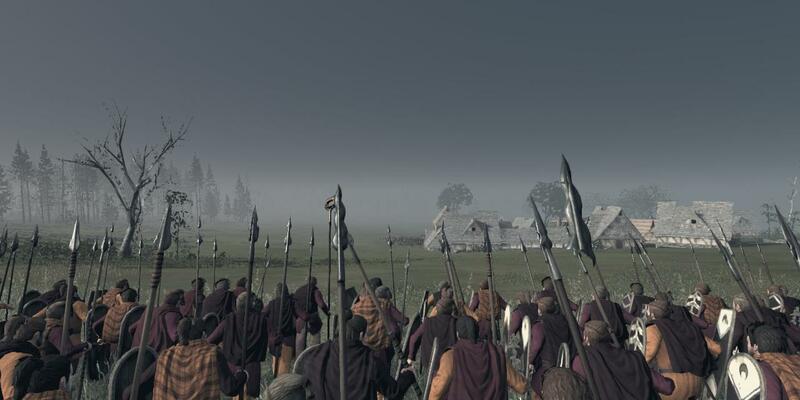 The Spears of Tyr, eager to draw Gallic blood, attacked the army that was camping by the town of Treverorum. There was an eerie atmosphere that day; the late day sun hitting the clouds gave the battlefield a brown-red glow. 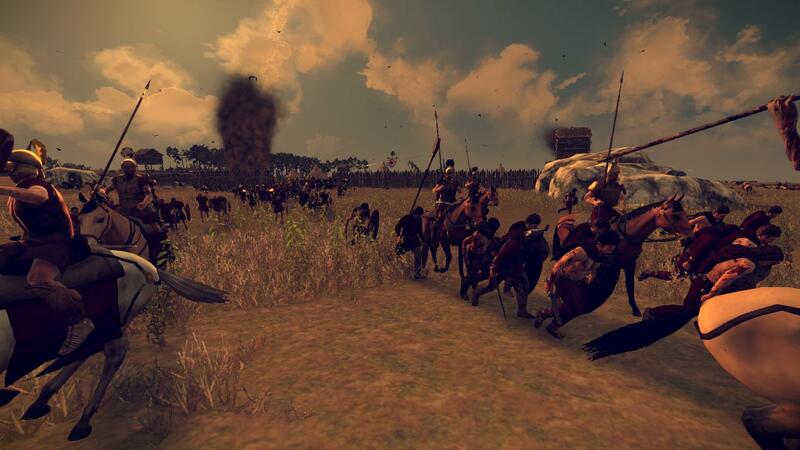 Our Spear Brothers and Bloodsworn rushed to make close the range, as the enemy had many slingers in their army. It didn’t take long to route an army mainly composed of slingers and tribesmen. 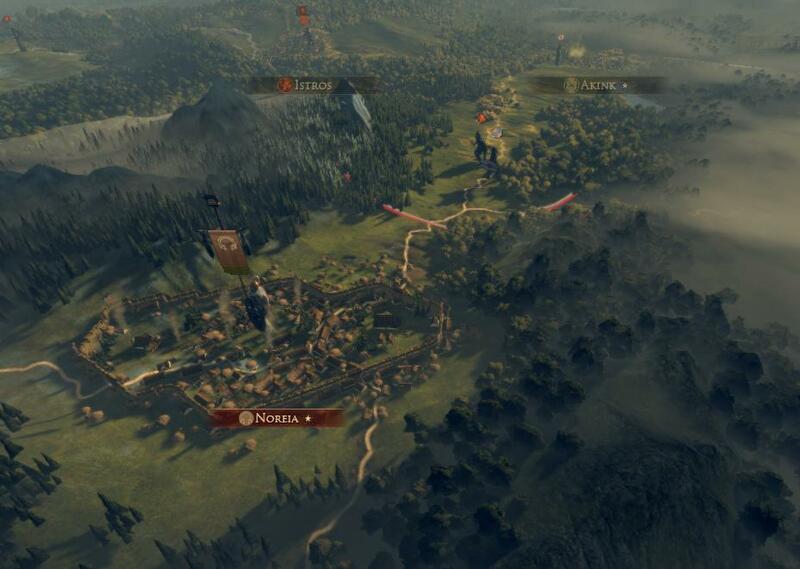 We then pressed our attack onto the town itself. We decided to attack in the rain, to reduce the impact of their slingers. An easy victory with minimal losses. 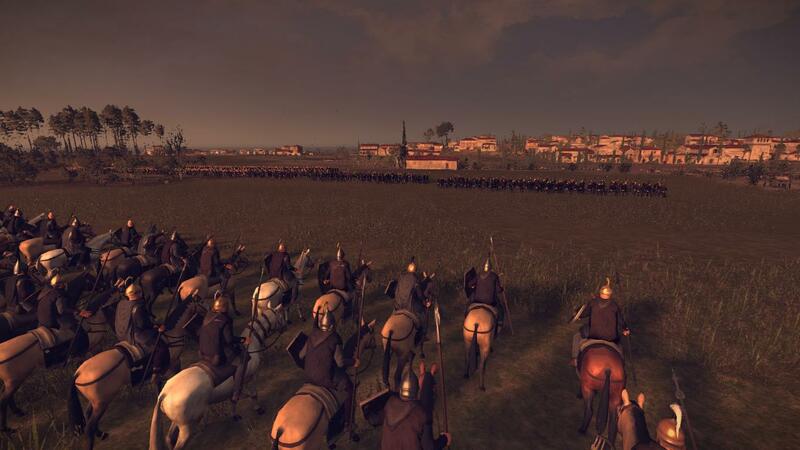 When I heard news of the victories I immediately requested whether or not one of the armies would be able to march on Vesontio. The two generals replied that they could not, as they were dealing with civil disturbance in the towns they had captured. 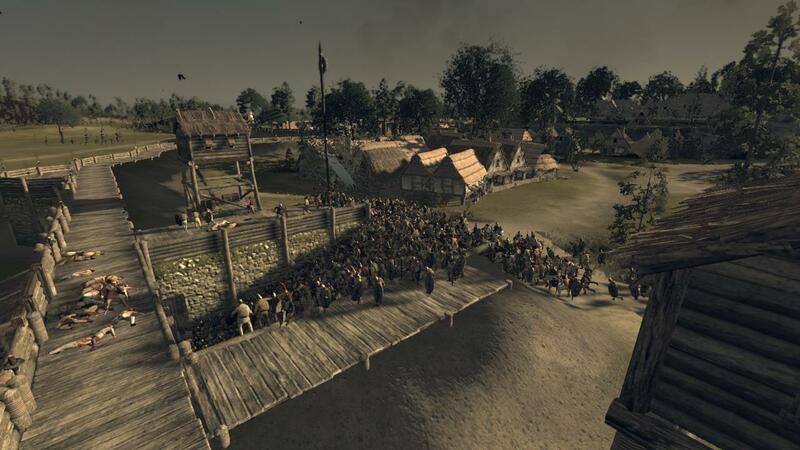 So I marched my army to besiege the town. 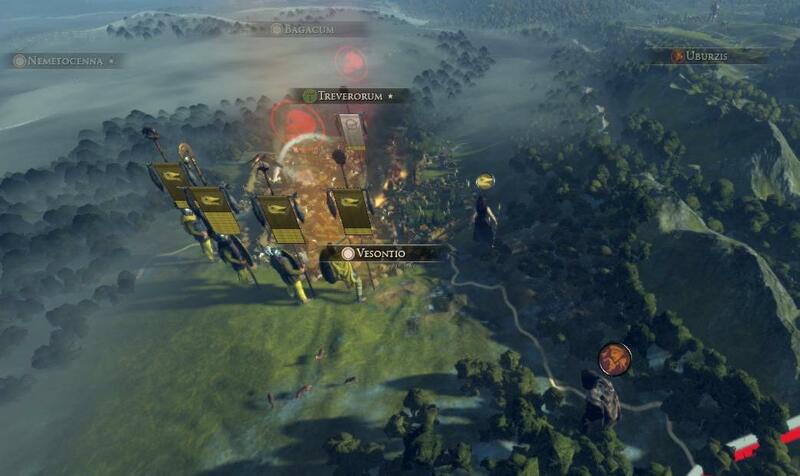 While it left a gaping hole in our defenses, I couldn’t let the Treverii use the time to organize a counter-attack. But more importantly, the voice in my head told me I had to. It told me I didn’t have much longer to be in this world before Wōdanaz takes me to Walhalla, and I needed to win more glory for myself. Let the others fight to take the small towns; they are dust to the achievement of taking a fortified city! We laid siege to the town and the defenders promptly sallied out. It was a very foggy day, and visibility was very low. In addition, a large hill on our left flank concealed enemy movement. 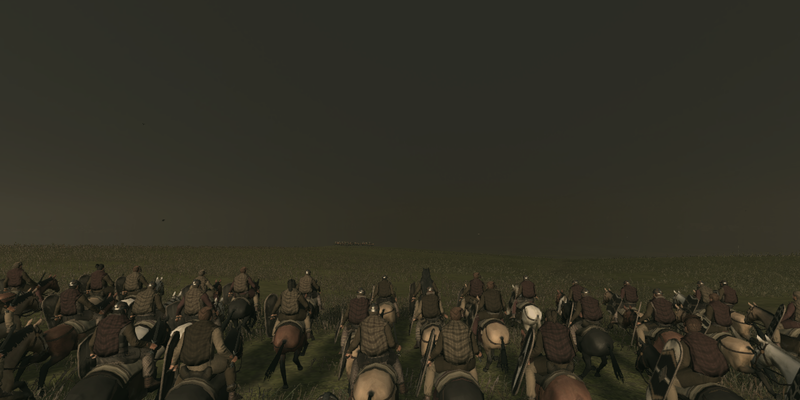 Because we couldn’t see very well, we sent our scout cavalry to find the enemy forces. 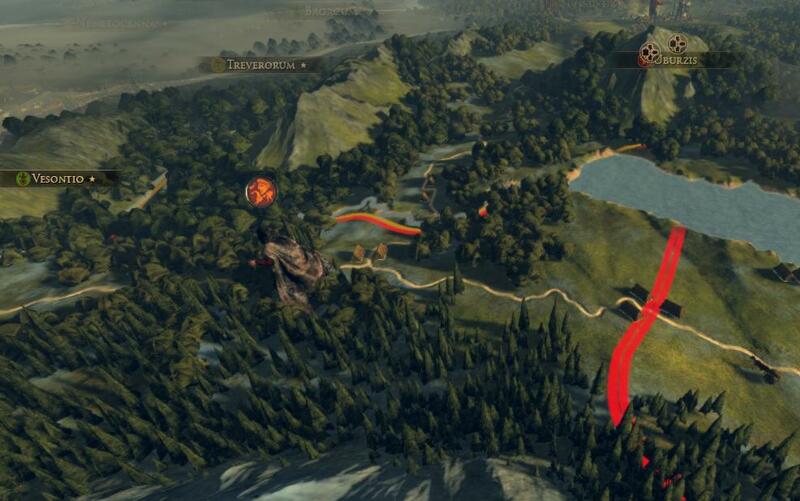 After travelling along the hill for a bit they found the enemy, and reported back. It didn’t take long for the enemy to appear over the hill. They ran down, formed a battle line, and charge. Our lines clashed. Their right flank collapsed quickly, while their left flank, reinforced by their general held on for a bit longer. 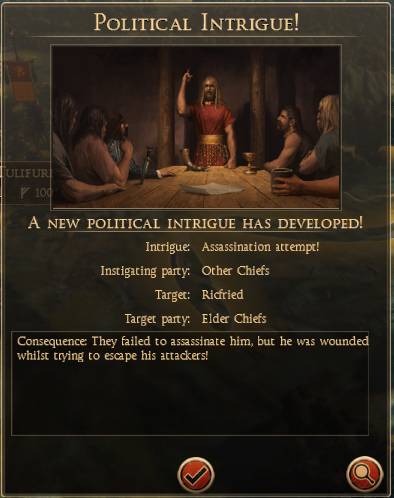 But what can you expect from a few low-skilled tribesmen and some slingers? 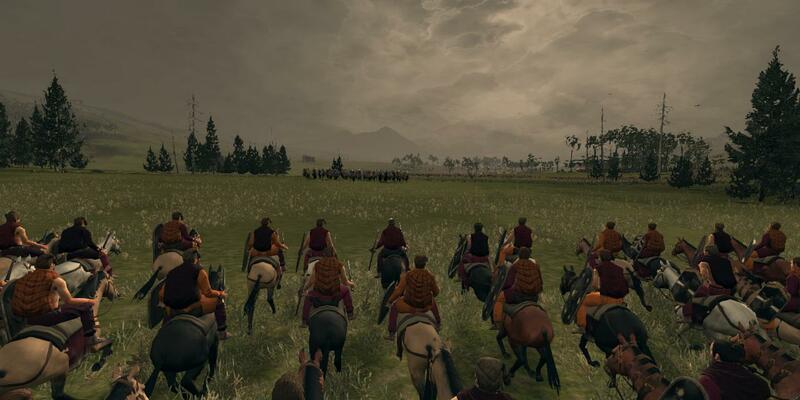 Our cavalry chased down whoever they could, and then returned to the camp to prepare for the final assault. Finally our preparations for the assault were ready. First we had to deal with a few units of slingers that somehow slipped through the siege, but they were easily taken care of by our cavalry. Our battering rams advanced forward. We had one at the southern gate and the other at the western gate. The defense at the western gate was relatively feeble. 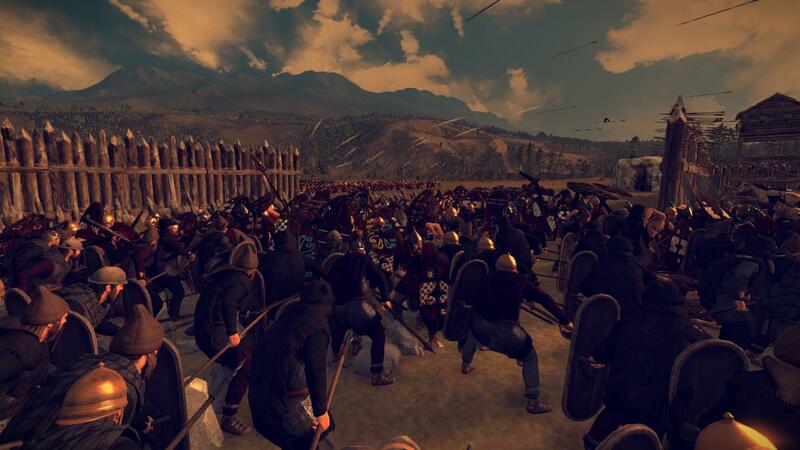 Two depleted units of skirmishers were left to defend the western gate, which was surrounded by high natural walls which would have made for a great killing zone had it been defended better. 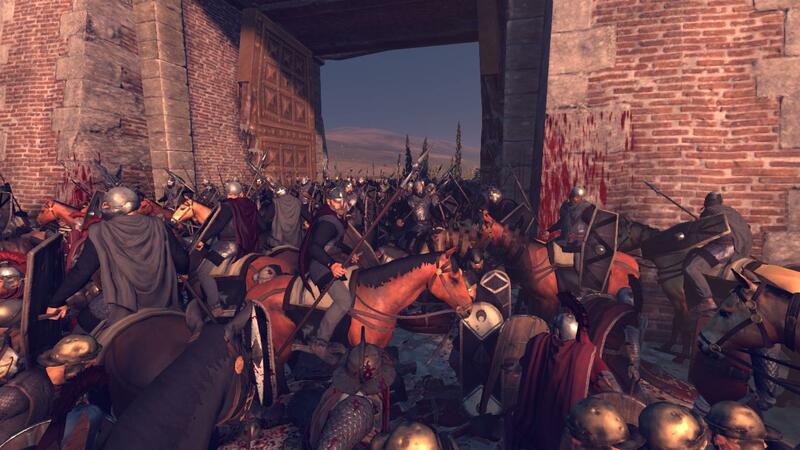 But the southern gate was extremely defended, and our warriors storming that gate found themselves in a terrible melee, with enemy skirmishers raining javelins from above as they came through the gate. But it didn’t take long for our battle hardened warriors to break through the enemy, and when our men from the western gate arrived, the Treverii surrendered. And so I was wrong. The Treverii, who had subdued the last stronghold of the Raetii only a year ago, had not fallen with a shout, but with a whimper. 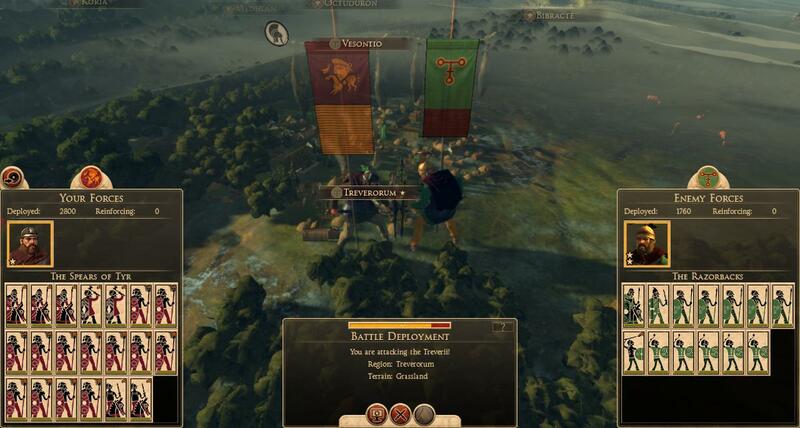 After the conquest of the Treverii, the Romans were now our only serious threat. 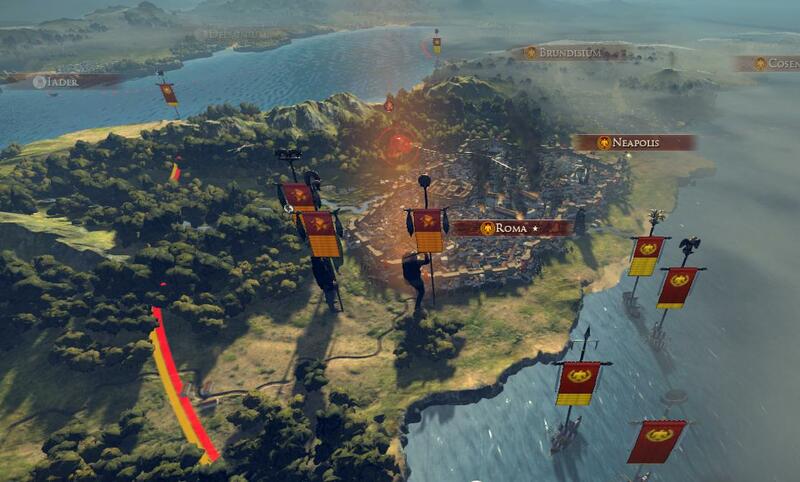 We had to act soon, and more importantly, we had to get to Roma soon. I feel like the longer this dream is not satisfied the further away it gets from being achievable. And I feel that my men are feeling it too. I feel they are getting restless. they want bigger things, not just small Gallic hamlets. 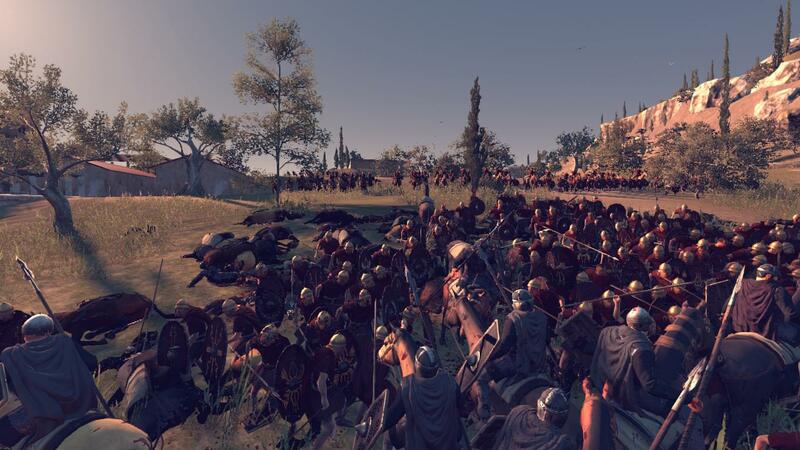 They want big and rich cities, and every week that we don't sack some large Roman or Gallic town is another week that I hear of growing discontent among the ranks. 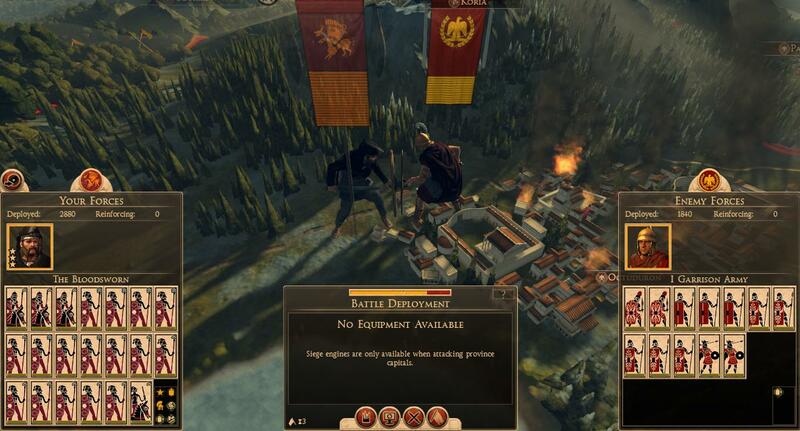 That worries me, I cannot invade Roman lands with my commanders and soldiers murmuring behind my back. And the voices have returned. They give me many sleepless nights now. I keep having this dream— or maybe it’s a nightmare— of arriving in Roma and seeing instead of gold and silver, I see blood and bones. The gates are closed as I march in with my army. The gates to Roma are gilded with golden plates embroidered with silver leaves. But as I push them open they begin to crumble, the rotten wood raining down over me. I venture further into the city. The streets are mud, with broken stones littering the sides of the streets. There are way too many piles of bones for this to have been the capital of one of the supposed cultured nations in the world. Wild dogs fight over scraps of rats that were unfortunate enough to get caught. I catch a glimpse of a few charred corpses in an alleyway, with wolves nipping at the bodies. But I think the most unsettling thing was the silence. Not even dogs barking. It was the silence of the dead. My men and I walk down the street, dazed at what we are seeing. 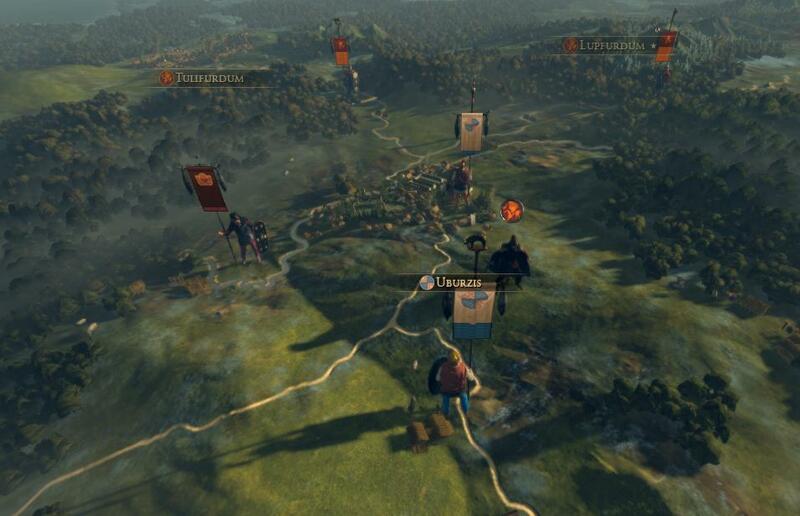 I send scouts up ahead to see if anything changes, while I give permission for some of my men to see if there is any loot still in this city. There is none. The scouts return telling me that there are large palaces and arenas in the middle of the city. We went on, hoping that the center of the city is better. We reach this large arena that is very long on two sides and short and curved on the other two sides. I think they at one time raced horses there, but now the only horses in this arena are dead and rotting. The seats are broken and dirty. Stray cats prowl the stands where it seemed like once thousands of people cheered as horses raced. Then I wake up, every time, and I go back to a dreamless sleep. We have to learn more about the Romans. Considering that they are our biggest threat, we knew very little about them. 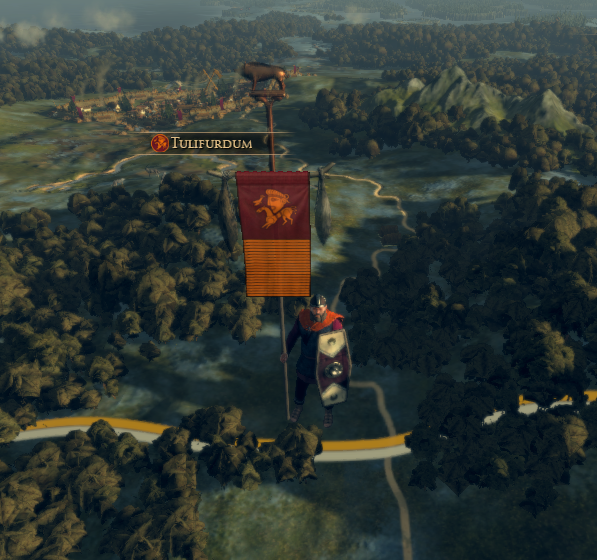 So I sent my best spy, Erminigilid, to discover more about the Romans. Starting from Koria, he moved past Medhlan, which we already knew about it, and headed south. He eventually found the city of Roma. He ventured further south, finding more Roman towns and cities, until he came to the ocean. 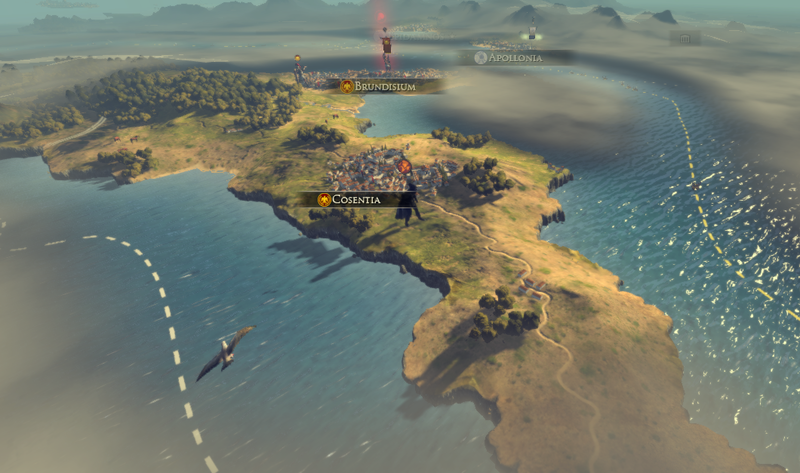 He thought that was the end of Roman rule, but then he learned about passage to an island off the coast called Sicily, where he met with a Siracusani envoy who talked to him about a possible alliance. And he found out that the main part of Roman lands is called Italia. Our way into Italia could be Sicily. 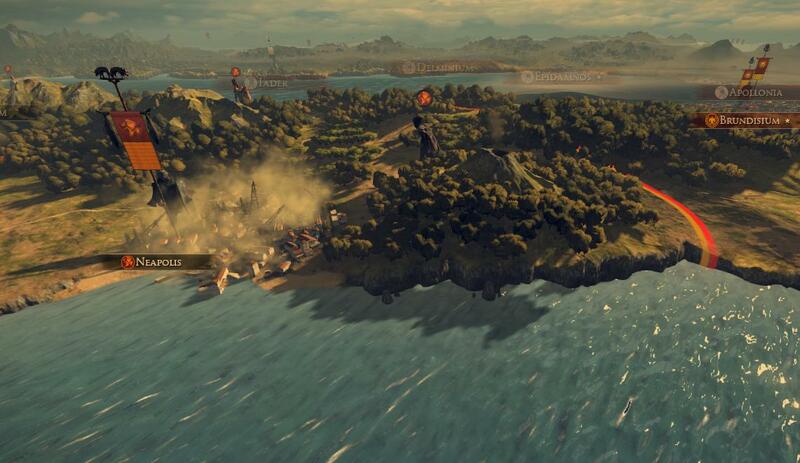 If we were to land there, kick out the Romans from the island, give it back to Syracuse as a gesture of goodwill, then we could use the island as a staging ground to invade lower Italia, and eventually take Roma. While this was going on in the northeast, two of our neighbors, the Aestii and Lugii, went to war. 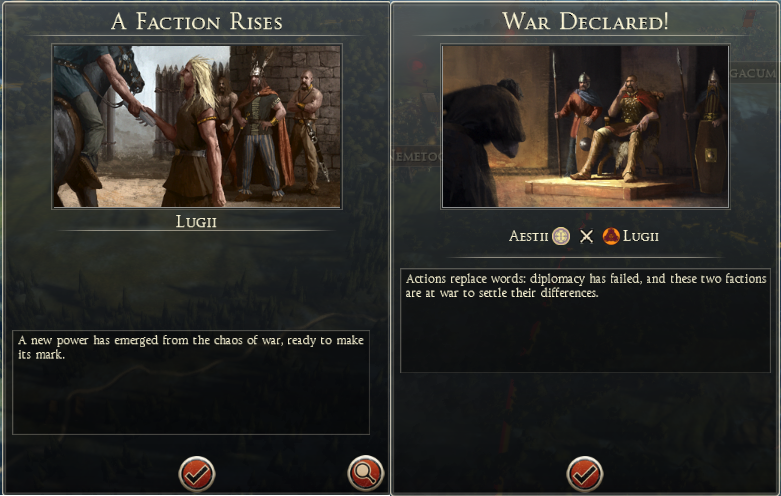 For decades the Aestii have been sitting around, doing nothing, and now it seems like they plan on doing something with a numerous armies they have been raising. And a month later, the conflict was over. Although it was not the Aestii who defeated them. The Eravisci defeated the Lugii, giving us a new neighbor. A neighbor with whom we do not have the best of relationships with. It seems like they want their home town of Akink back. Which is a shame because I don’t think we will be feeling too amicable to the idea of simply giving up a town that we captured to them. I met with Ricfried and Baldovin about our next move. They brought something to my attention the problem with the Artrebartes. 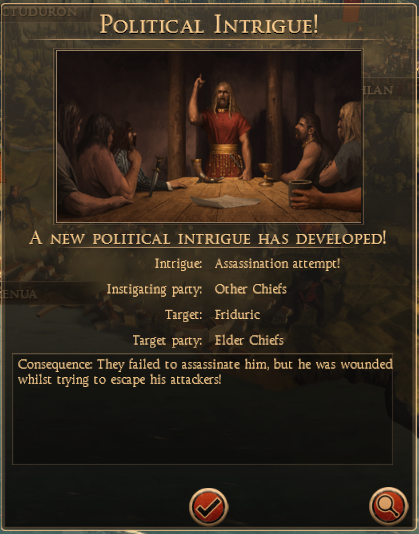 Our relations with the once-small Gallic tribe had soured to the point where our spies report that war was being discussed by the Artrebartes tribal leaders. It was time that we took steps to remove the Artrebartes threat, because we do not want to be in a large conflict with the Romans and have the Artrebartes attack an undefended border. 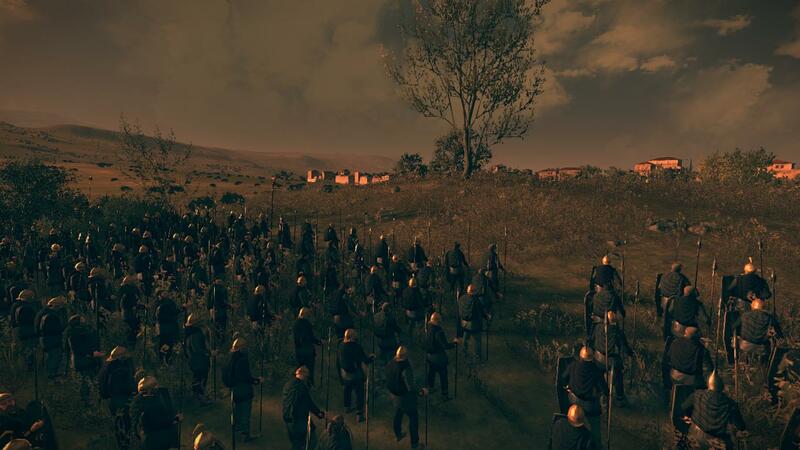 Another army was being trained at the moment, as soon as that was completed we would begin our invasion. 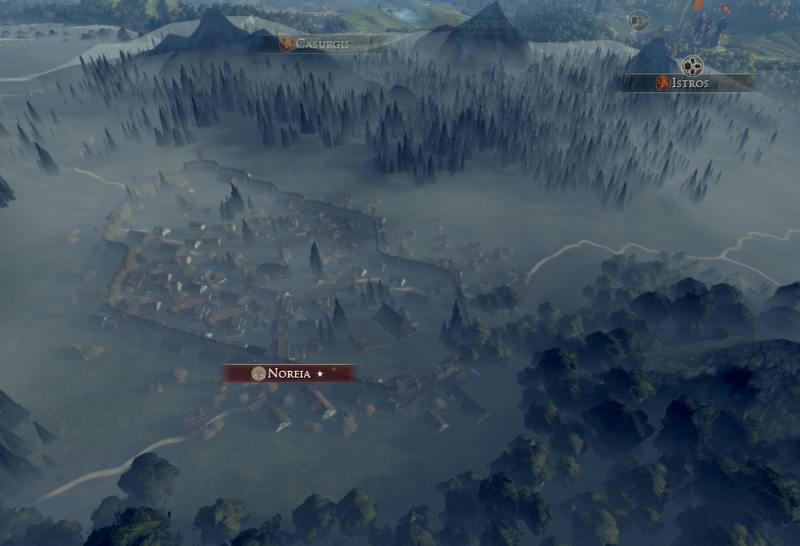 Ricfried thought that an obvious first target would be the Artrebartian capital of Nemetocenna. A factor that we had to take into account was the numerous smaller Artrebartian navies that might land their troops far behind our lines and cause havoc to the countryside. So to remedy that problem we would raise a number of small armies on our northern border to ensure that we would be able to defend from any possible incursions. When Erminigilid came back from Sicily a few weeks later, I asked him what he thought of the city of Roma. I went to bed happy, and I once again dreamt of roads paved with gold. As we were preparing for our invasion, we heard that the Lugii people had risen against their occupiers, threw them out, and then created a new independent state. And then was promptly attacked, again, by the Aestii. Finally our preparations were complete. 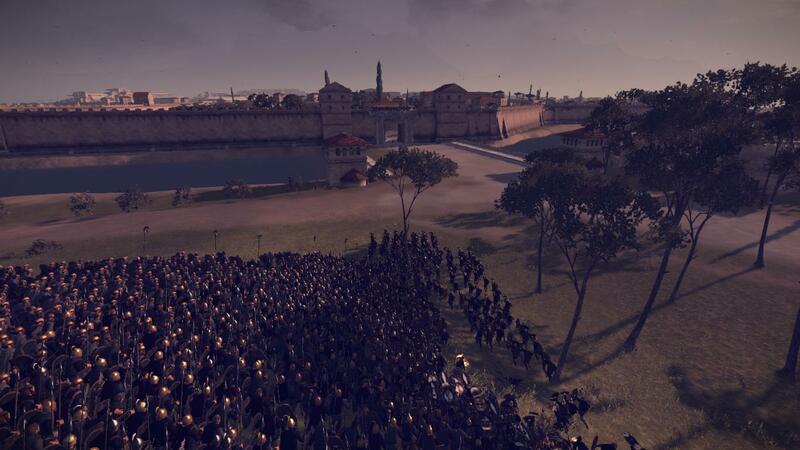 Numerous small defense armies were posted on the coastal towns, and the new full-sized army, the Skull Breakers, was sent to take the Artrebartian capital city. 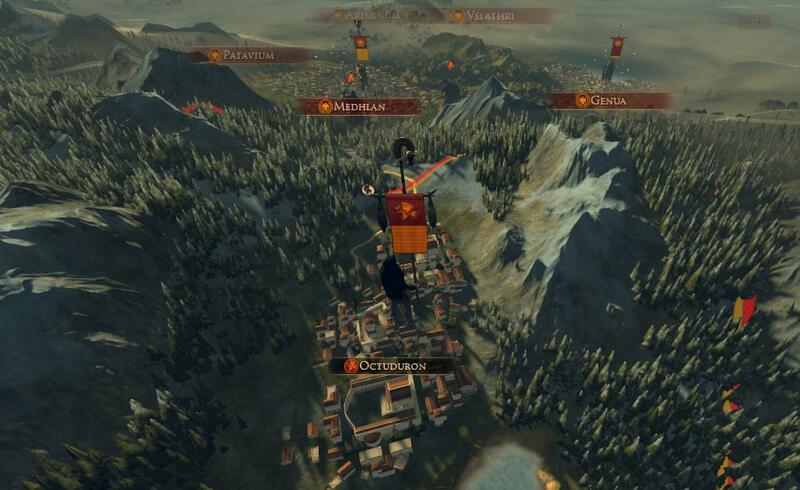 The Siracusani had taught us a few siege tactics, such as the siege tower. This was a large moving tower that could be used to take over the enemy walls. 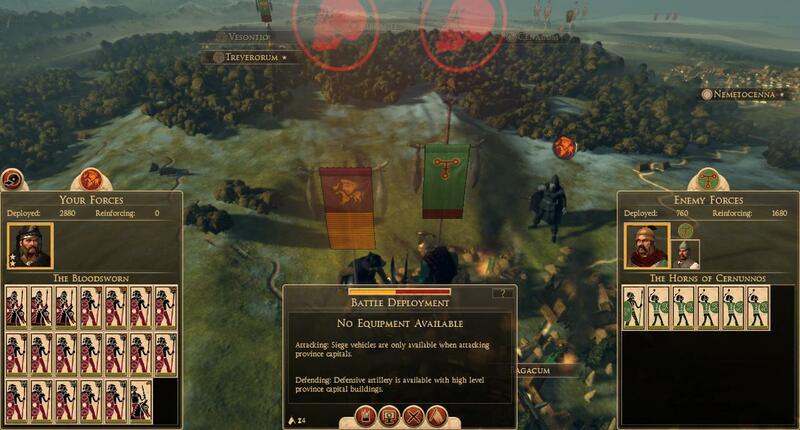 With the small enemy garrison, it seemed that this battle would be over quickly. But it quickly went south when both of our towers, one at the south gate and the other at the western gate, were set on fire very quickly. Our men who were eagerly waiting on the towers to capture the walls climbed down the ladders in a panic, desperately trying to get off before it was engulfed in flames and collapsed. 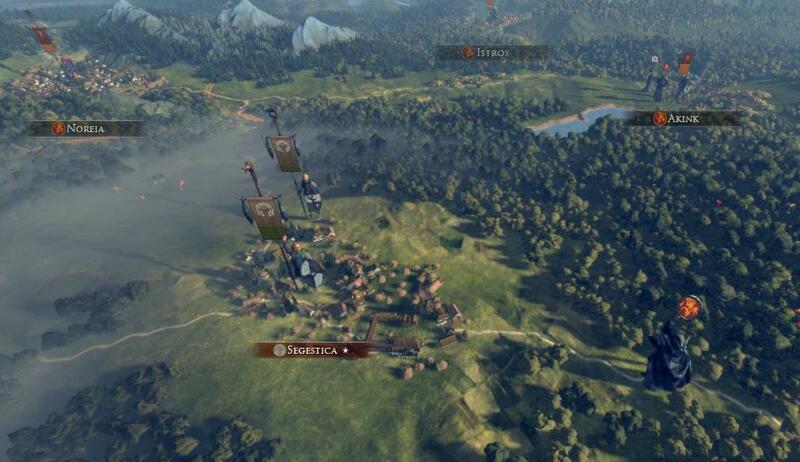 With no other siege equipment we had to send three units to throw torches at the gates, a very costly tactic. When the gates were finally burnt town, we had sustained almost 300 casualties, wiping out one unit and decimating two others. 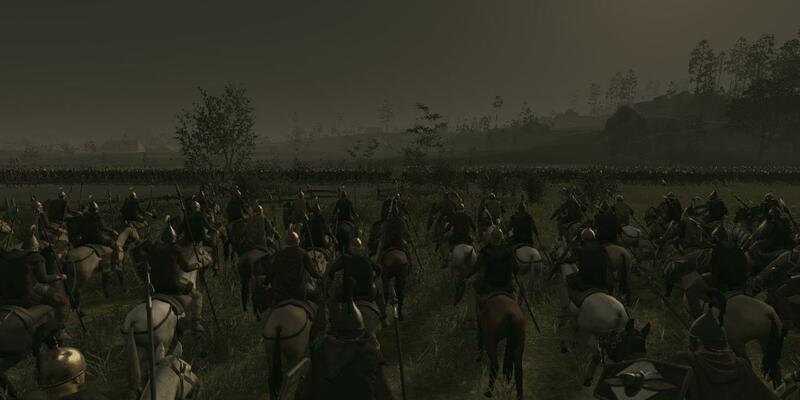 With the gate open our remaining units charged forward, eager to have their first taste of blood. 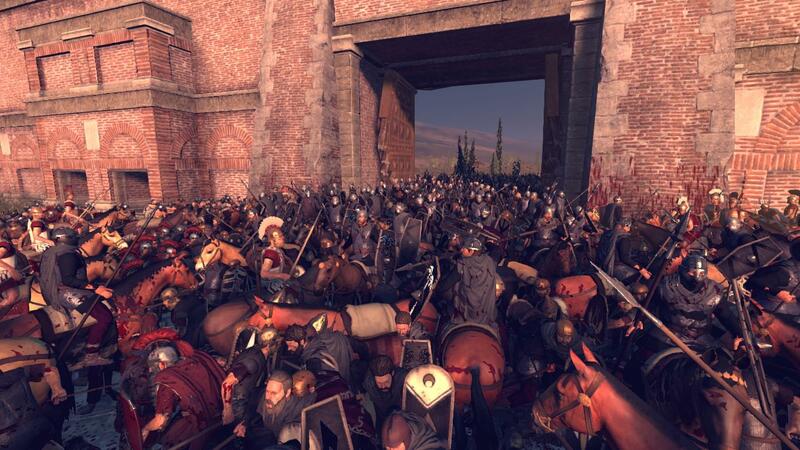 At the western gate, our units burnt down the gate with much fewer casualties, but the Artrebartian garrison had laid numerous traps within the gate, preventing anyone from getting in. 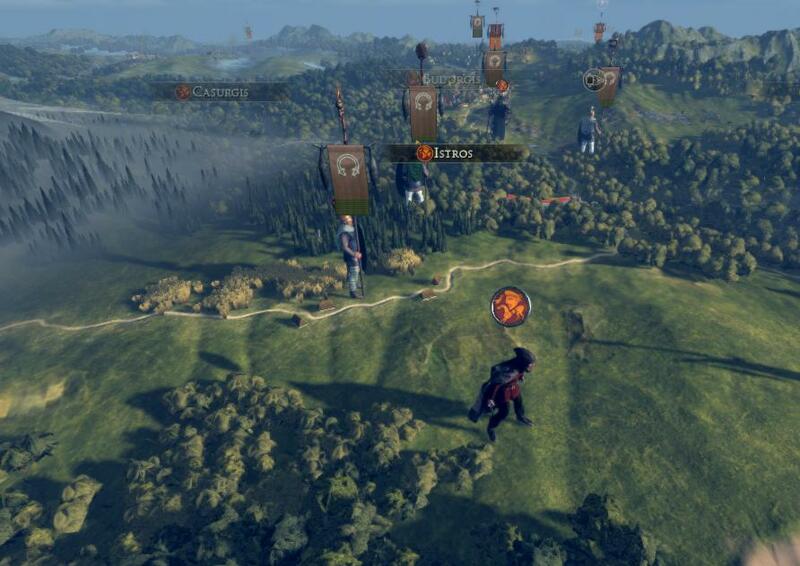 So our units went to the southern gate and joined the fray there. 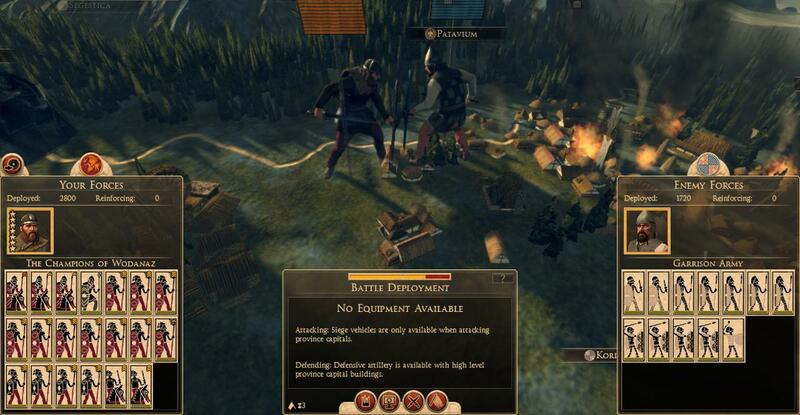 Authors note: For some reason my units refused go through the gate even though I destroyed it. Must be a bug of some kind. Our forces at the southern gate were met with fierce resistance, for the enemy had put their elite units at the front line. 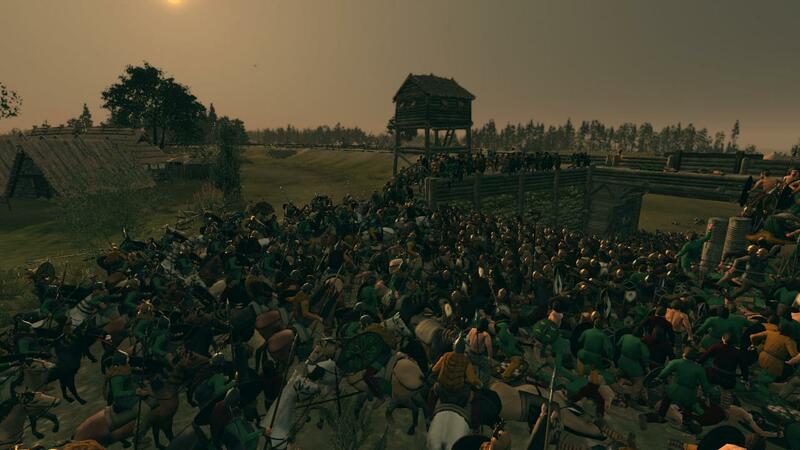 We poured men into that gate, and it seemed like it would be a stalemate, for neither side could turn the other. When one side began to waver, our generals would rally the troops to continue on. It was a bloodbath. 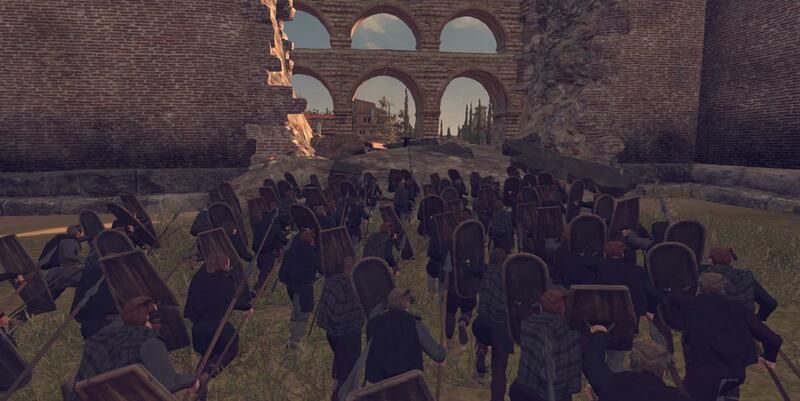 After almost an hour of a very violent melee, our units finally broke through the enemy barriers at the gate by sheer numbers, and quickly went to mop up the remaining Artrebartian units scattered around the city. Finally we were able to see exactly the carnage at the gate. 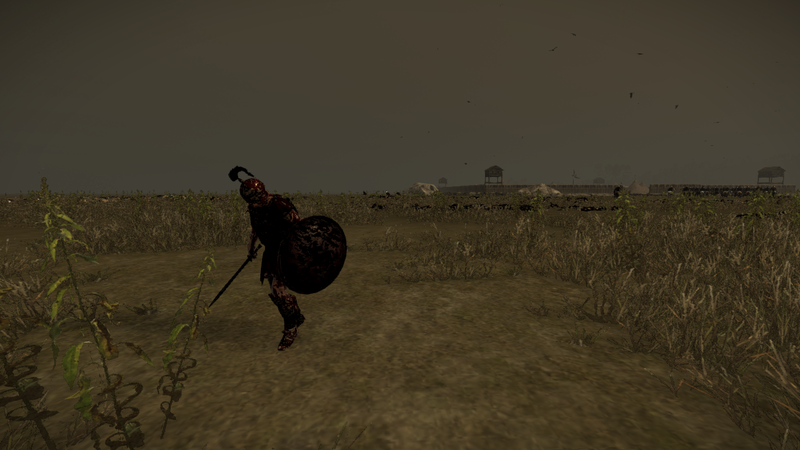 I arrived just as the battle was ending, and was able to survey the bloodbath. 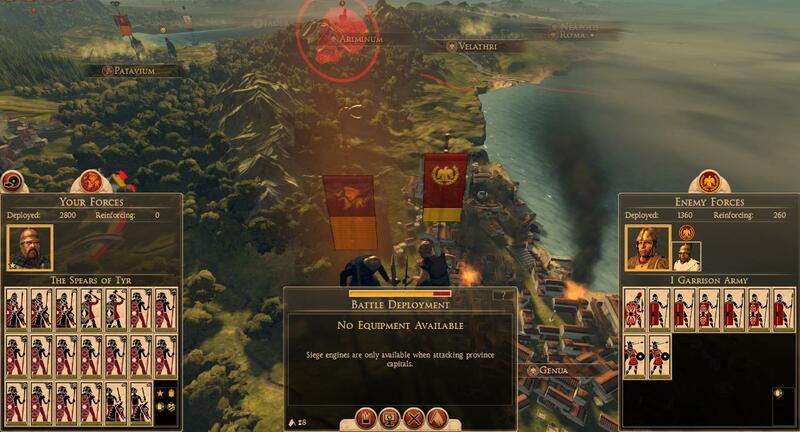 We had to either improve our siege equipment to prevent them going up in flames or we would have to starve out the garrisons. The day was won, and the Artrebartes had lost their capital city. But it was at a considerable cost. 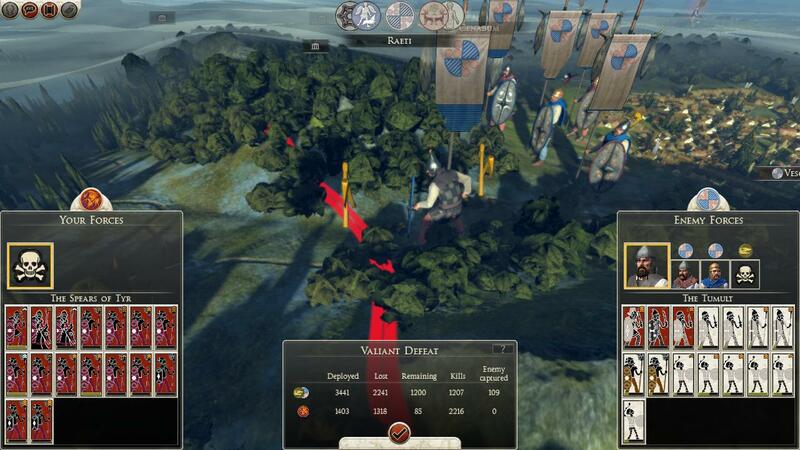 Three of our units were completely destroyed, and six others had to be merged to keep battle effectiveness. The Skull Breakers had taken quite a hit for a first battle, and they needed some time to recoup from their losses, so the Bloodsworn would be taking up the mantle for now. Hopefully this battle was just an initial bump in the road. Otherwise this could be a disastrous campaign for us. As quickly as our war with the Artrebartes had begun, it ended. 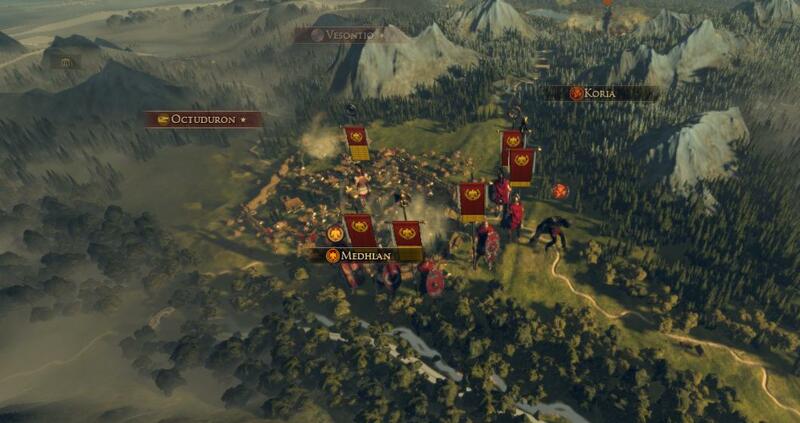 So I accepted their truce, and with that war ended, we started preparing for our invasion of Roman lands. It didn’t take very long; as most of the armies were already created, and all we had to do was bring them towards the front. 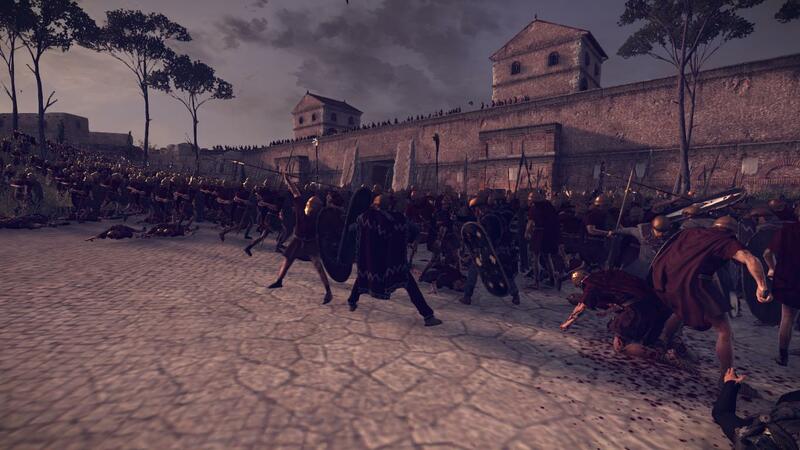 Ricfried with the Bloodsworn were to strike first, against the lightly defended Roman town of Octuduron. With the pieces on the board set, we declared war and launched our attack. 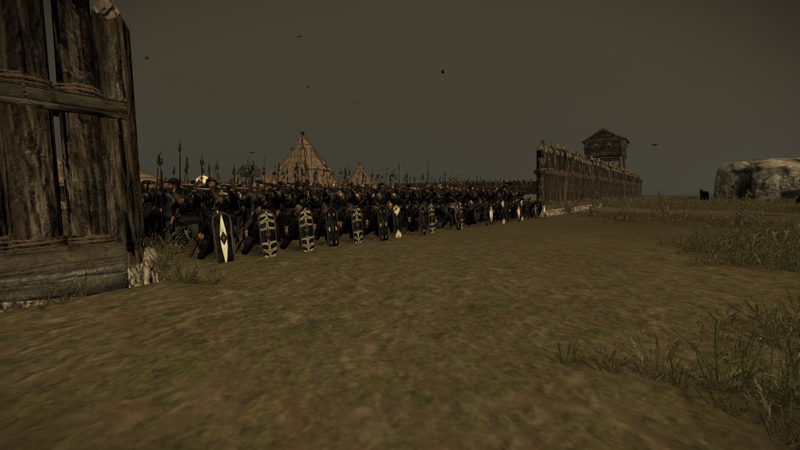 It wasn’t a very strong garrison, so Ricfried decided to bide his time and make the Roman garrison scared. People always fight worse when they are scared. 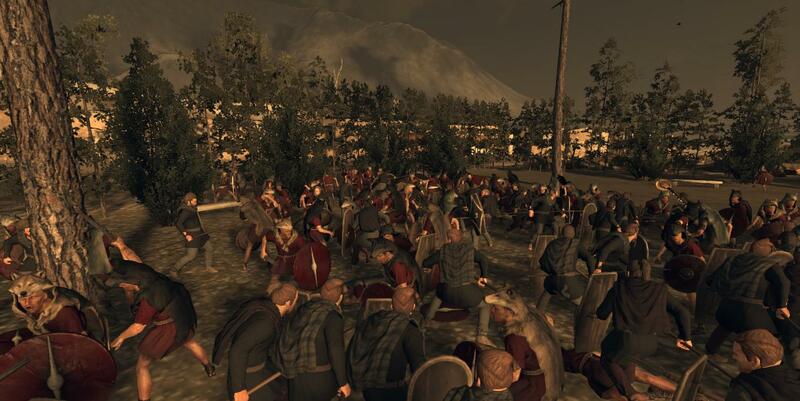 He calmly moved his men into position on either side of the town, seemingly in no rush. The Romans weren’t going anywhere, and the nearest Roman army was a week’s march away. A few hundred feet he stopped the men, in full view of the Romans. He addressed his men. And with that he gave the signal to charge. The battle did not take long. 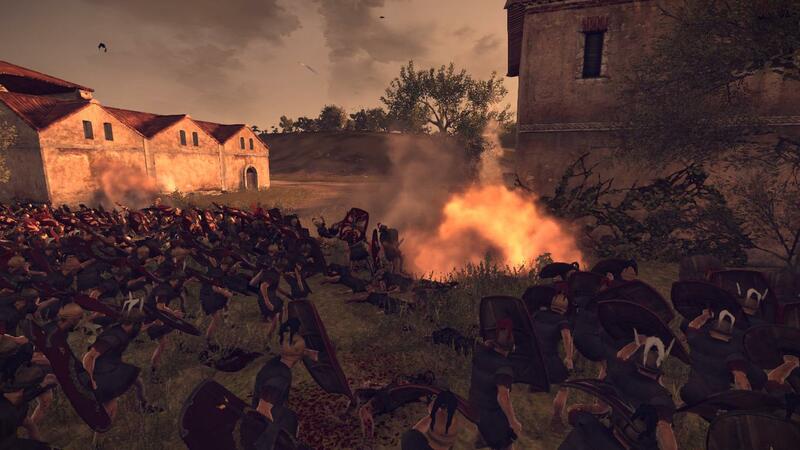 Crushed from either side, Roman resistance was short lived and futile. 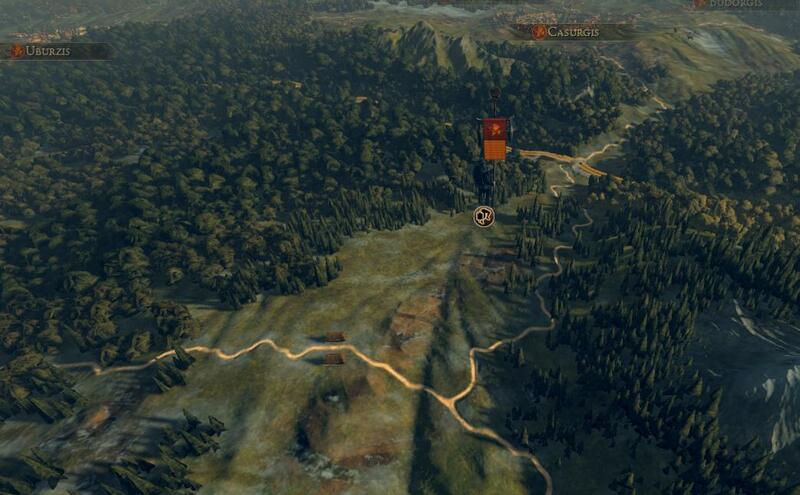 Soon the last member of the Roman garrison was either slain or had fled to the hills. It was a very clean victory. 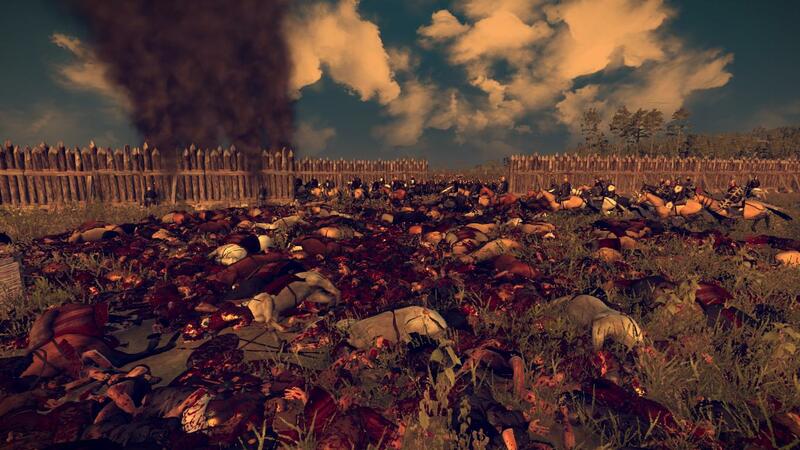 We had lost only ninety men, killing almost all of their men. Octuduron was ours, and with that victory, one of the biggest wars we were ever in had begun. 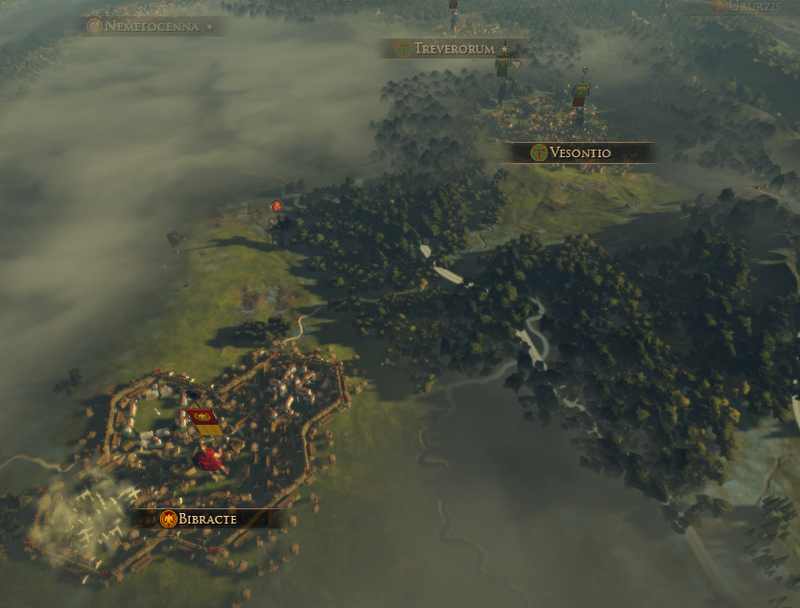 Next we would move onto the fortified city of Medhlan, for which I had a plan. I would not allow another fiasco like Nemetocenna to happen, so we would take the Roman's strongest weapon and beat them at their own game with it. Yes, I know, I forgot to take a screenshot of the results. 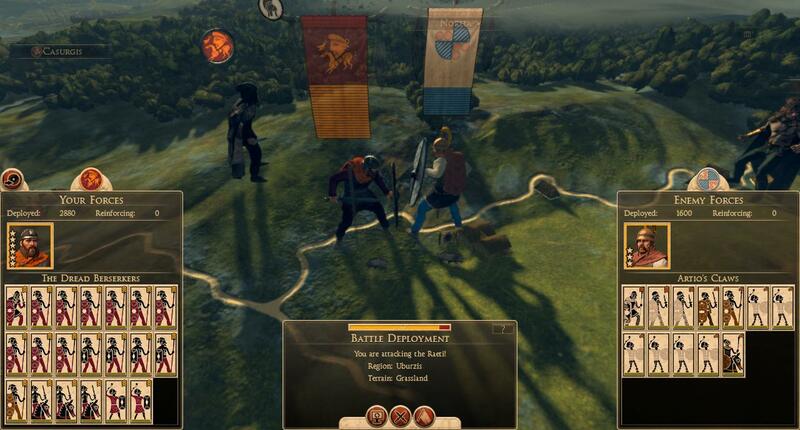 Authors note: So with patch 5 I'm using a few new mods, and had to discontinue the use of others: Other than the Radious mod, I'm using the AI Food Fix (helps prevent AI armies from starving out), loose formations for all units, faction uniform colors by Mitch, a battle zoom mod called “Zoom all the way down!! !,” and that’s it. 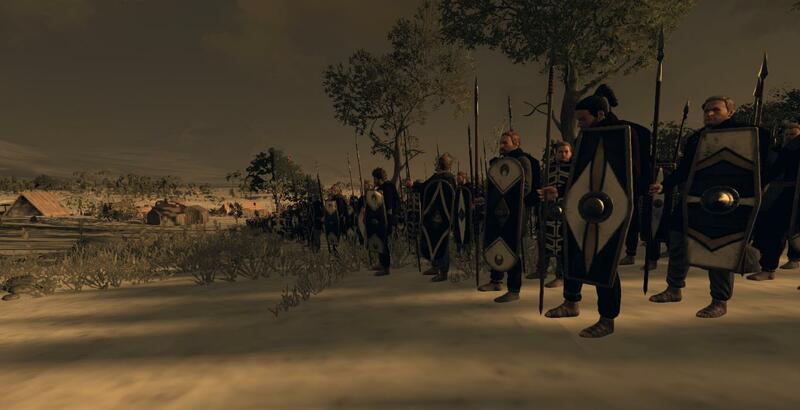 As for the mods I had to remove, I had to remove the Armored Suebi mod as the creator went AWOL and hasn’t updated it for the changes, giving me a CTD upon startup. Also, the Natural Dyes mod had to go as it was incompatible with Radious. Quickly after our victory at Octuduron, I sent Aldegar, who was leading The Host of Germania, to lay siege to Medhlan. 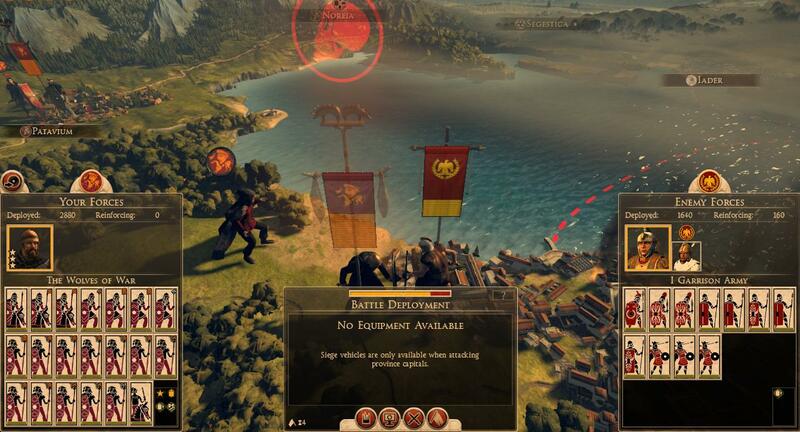 We did not want to give the Romans a chance to counter-attack. I would rather see them starve in a city than run around the countryside where they can do more harm. 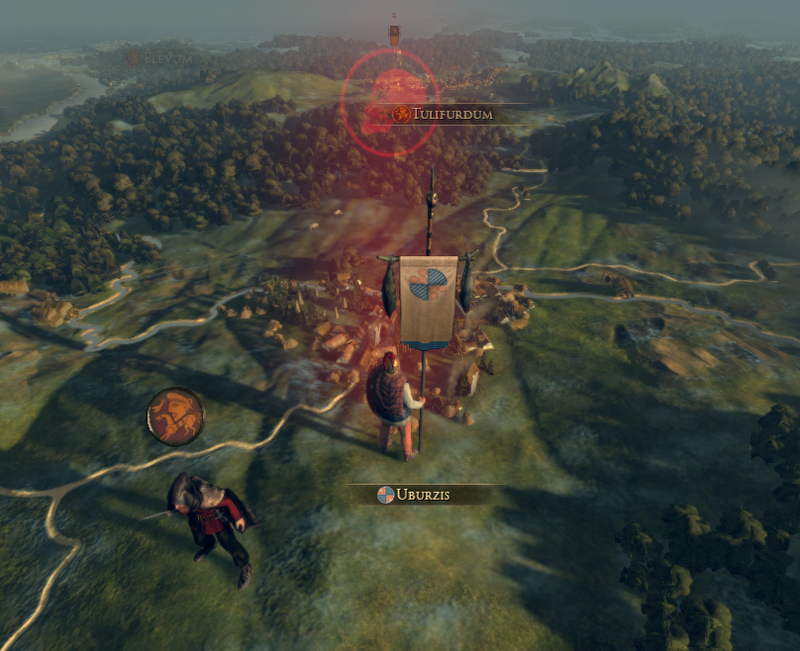 The Romans outnumbered us, so their general foolhardily decided to sally out. This is the general who CA made from the likeness of a fan. 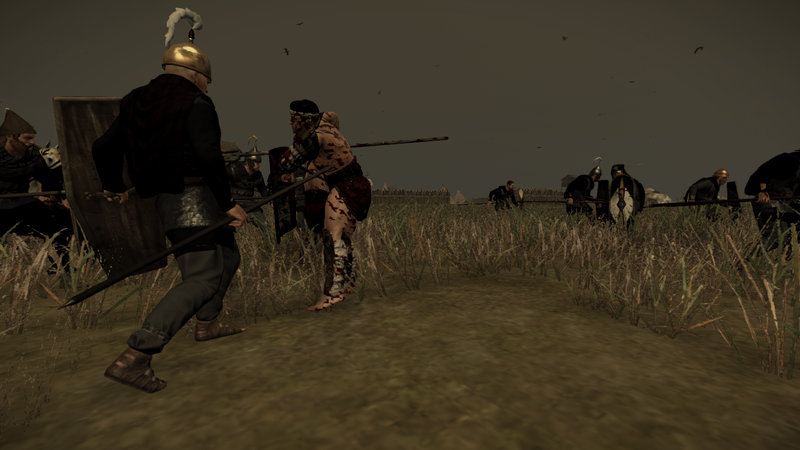 Aldegar decided to use our newest weapon, the ballistas, against the Romans as much as he could. With their help they could turn the tide of battle largely in our favor. 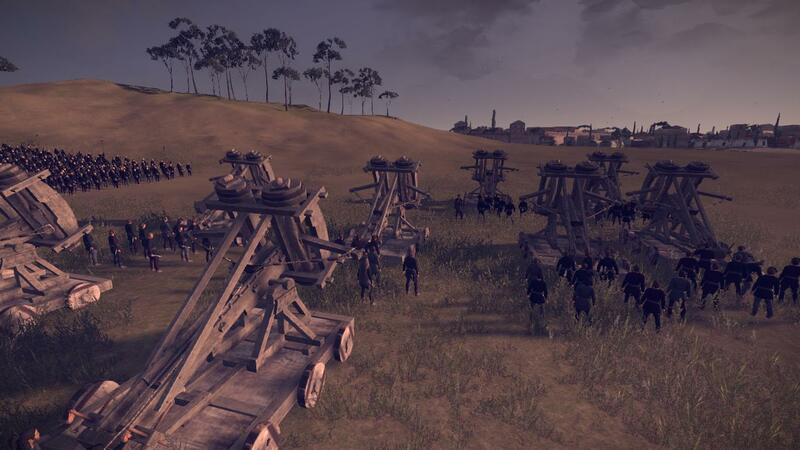 Because they were such prized machines, he decided to keep two units of our spear brothers back to protect the siege machines. 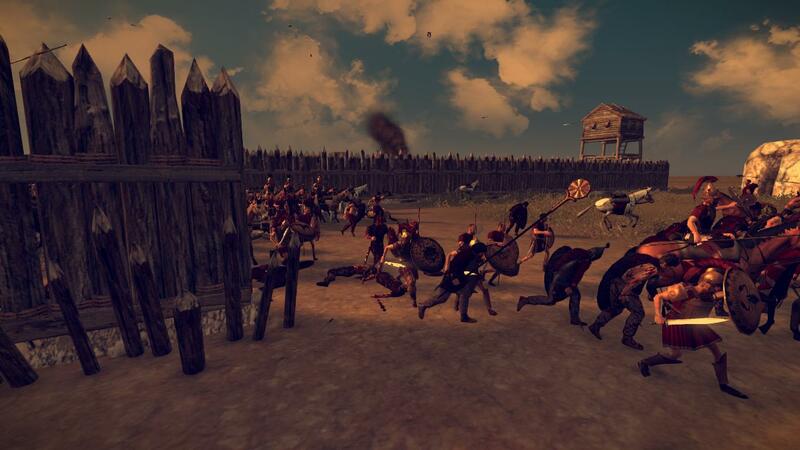 The rest of our men waited anxiously for the Romans to come close, threw a volley of javelins, and charged. 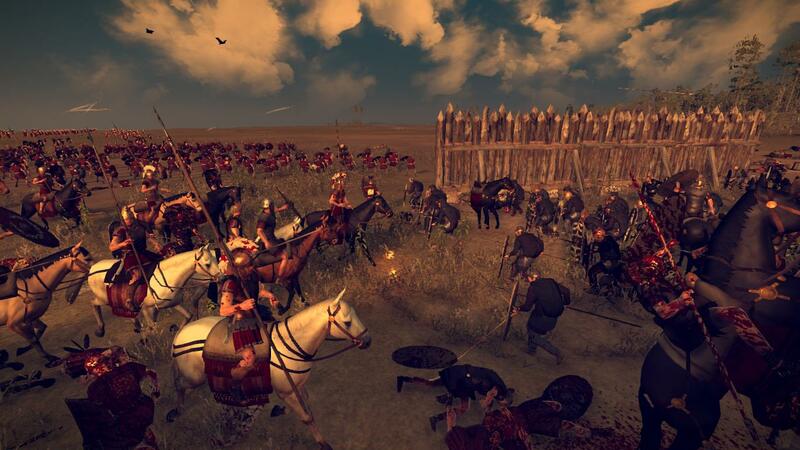 Two units of Roman heavy cavalry was trying to flank us and take out our artillery. We only had one of our units of Noble cavalry available so they heroically charged to intercept. 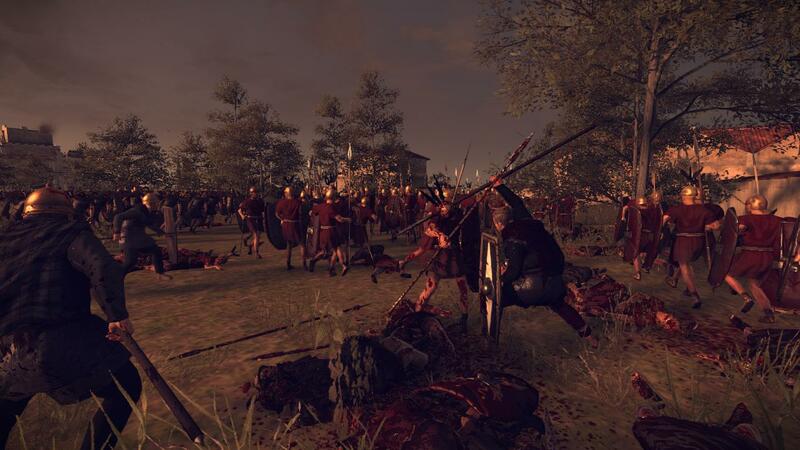 In the center of the battle, our spear brothers were going tooth and nail with a unit of Roman gladiators, men who were extremely skilled in hand to hand combat. 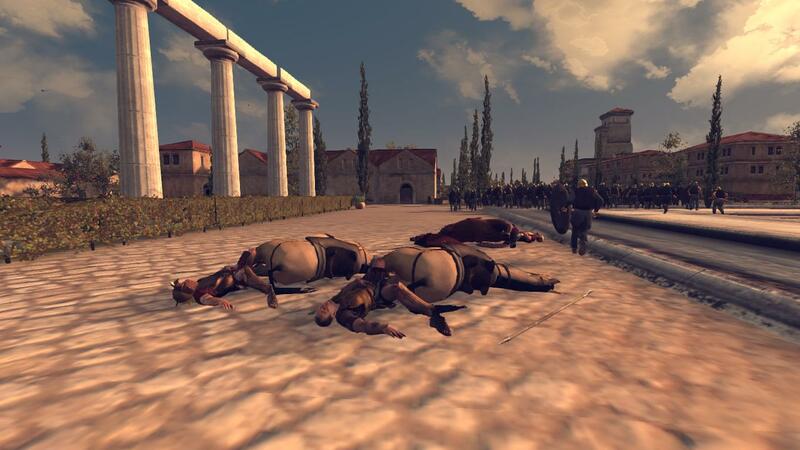 Meanwhile, our artillery rained explosive shells upon the advancing Roman reinforcements, killing dozens of them, causing many of the ill-trained Roman units to flee. 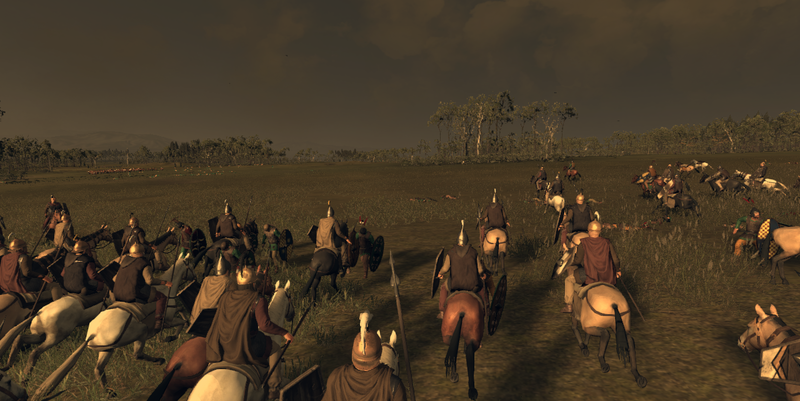 Meanwhile, our unit of Noble cavalry was struggling, so Aldegar and his bodyguard rode in to help. 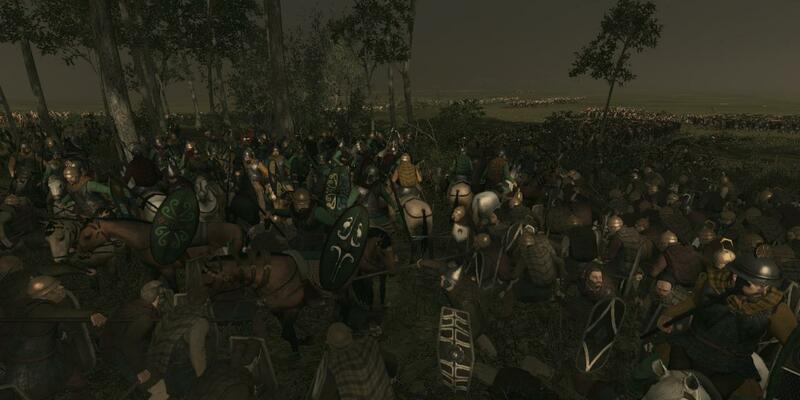 They were facing the elite of the Roman cavalry, so to charge into this melee was a courageous thing to do. 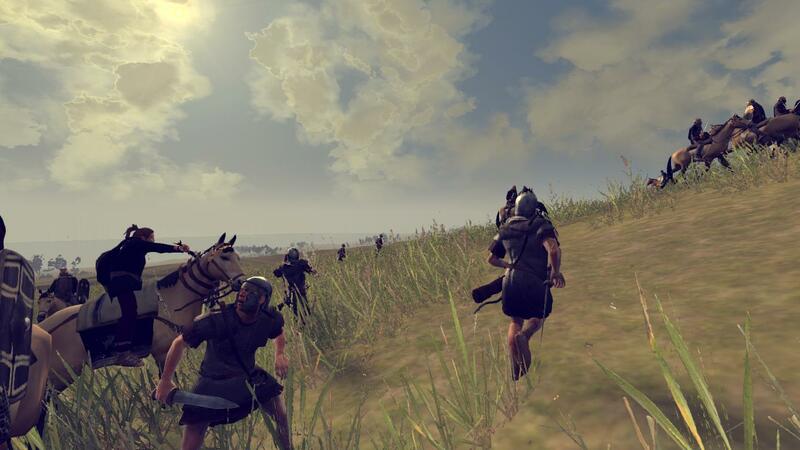 Soon the Roman heavy cavalry was on the run, and Aldegar pursued. 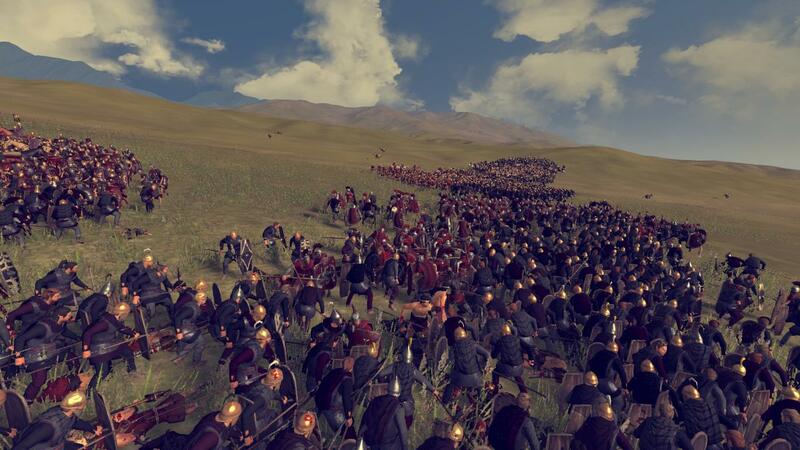 The Roman infantry began to turn, as they saw their lines crumble, especially when the rest of our infantry began to charge at their center. As they fled, our horsemen chased them down and slew them where they stood. 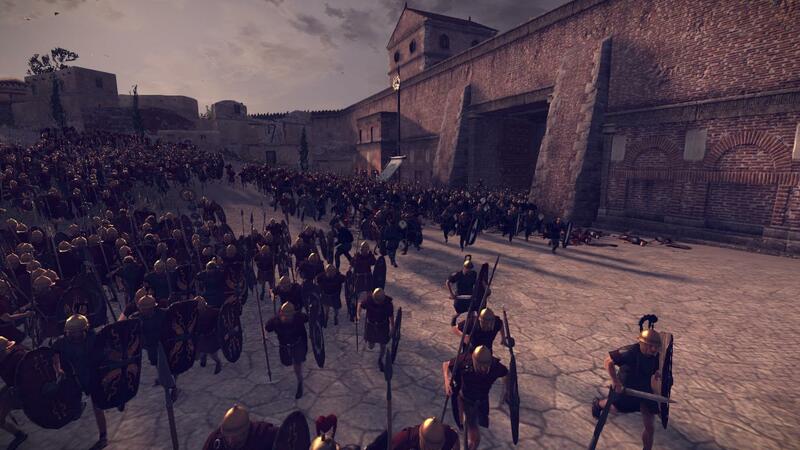 The surviving Romans, mainly city watchmen, ran back to the safety of the city. 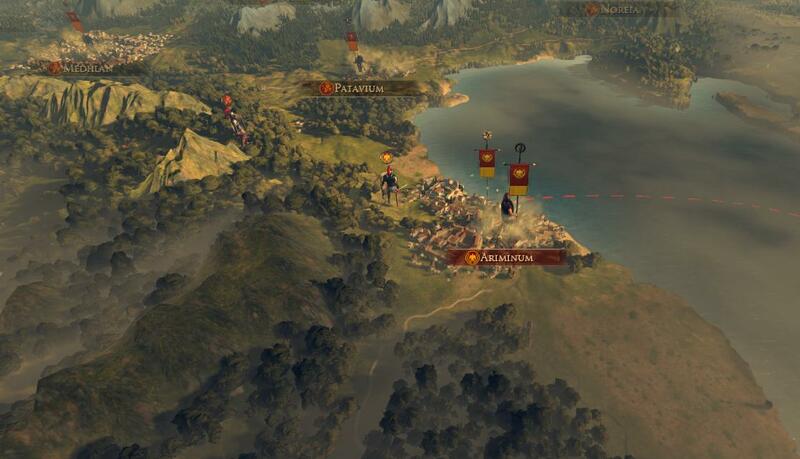 It was a great victory, and it would make our conquest of northern Italia much easier. 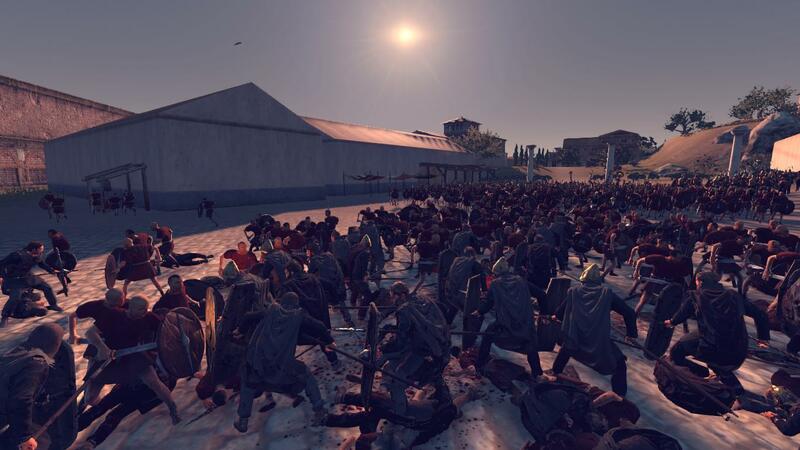 From our estimates we had wiped out any serious resistance in the city, only leaving a few skirmishers and city watchmen in what used to be the army in charge of the defense of northern Italia. 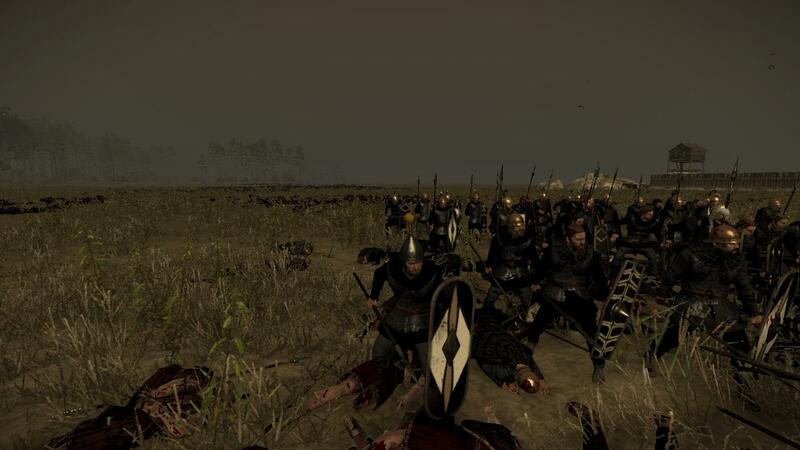 We had taken some losses as well, a number of our units had lost a good number of warriors, and Aldegar had to combine a number of units and hire some mercenaries to replace our losses. 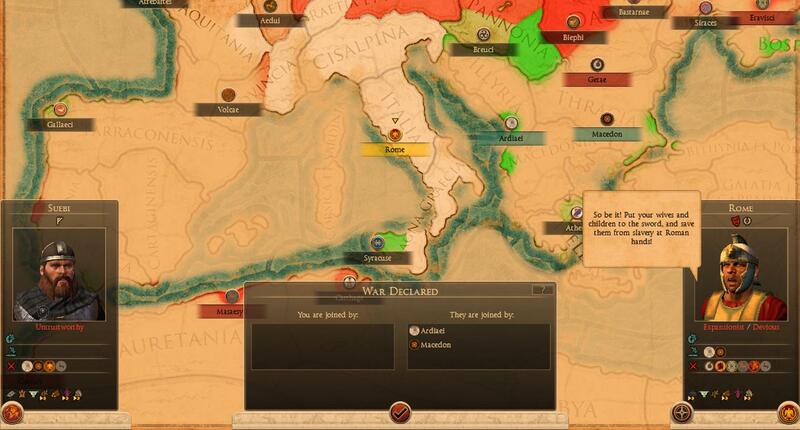 In the meantime our spies had managed to turn the top Roman spy, a great intelligence victory for us. 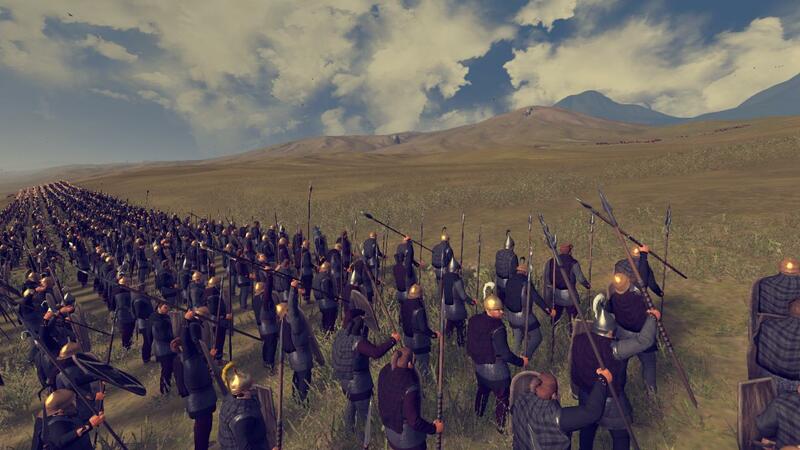 To the east, another one of our armies was advancing towards Patavium and would be there soon. 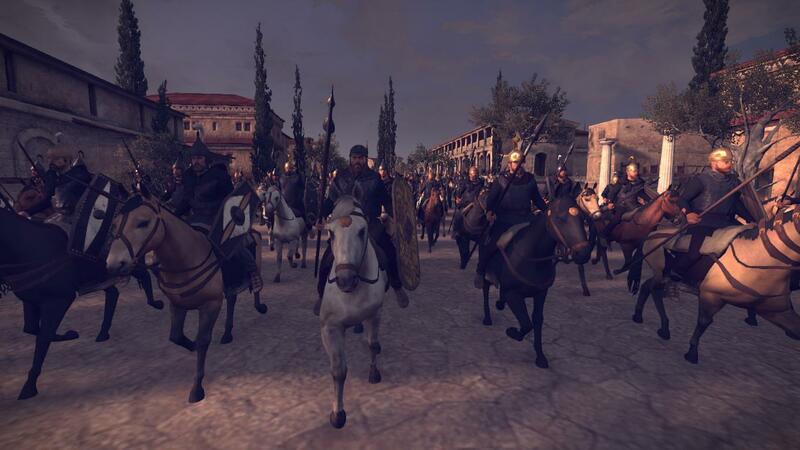 After our initial victory outside of Medhlan, it was time to press our victory and take the city. 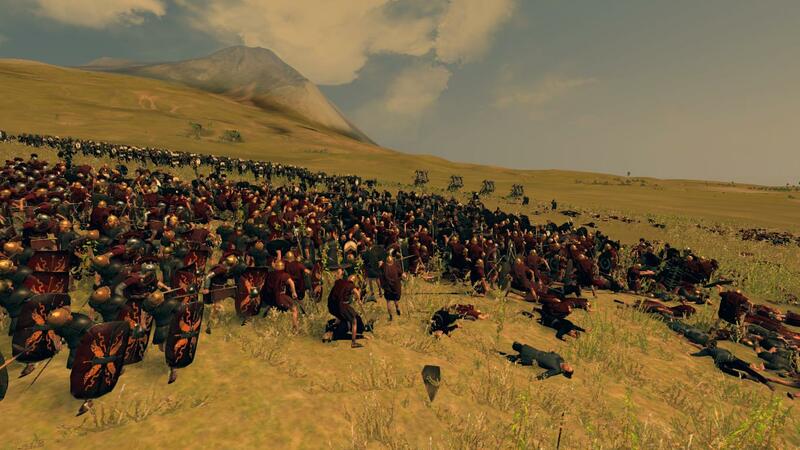 It was going to be an easy battle, as most of the Romans from the garrison and the defending army was killed in the previous battle. We had our scouts check out their defenses. They had some heavy artillery on the walls, but the eastern wall was bare from Roman defenses. 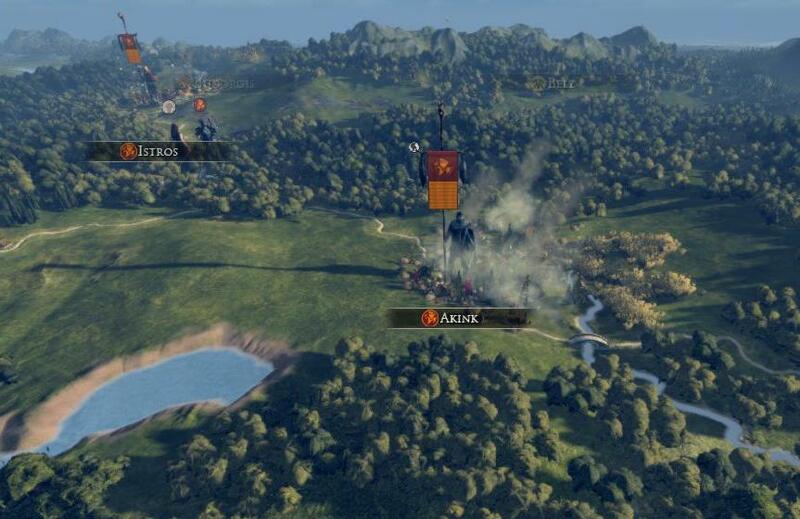 So we placed our men and artillery, and our assault began. 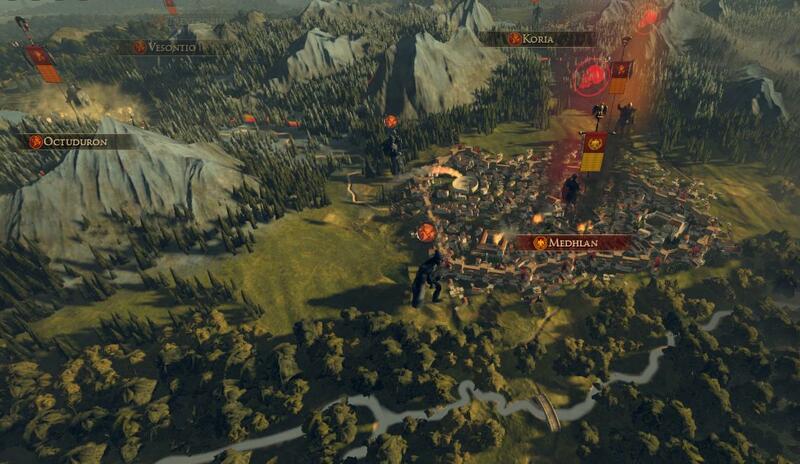 After an hour of bombardment we were able to breach the walls of Medhlan, and our men charged into the breaches. They were met with little resistance from what was left of the Roman garrison. 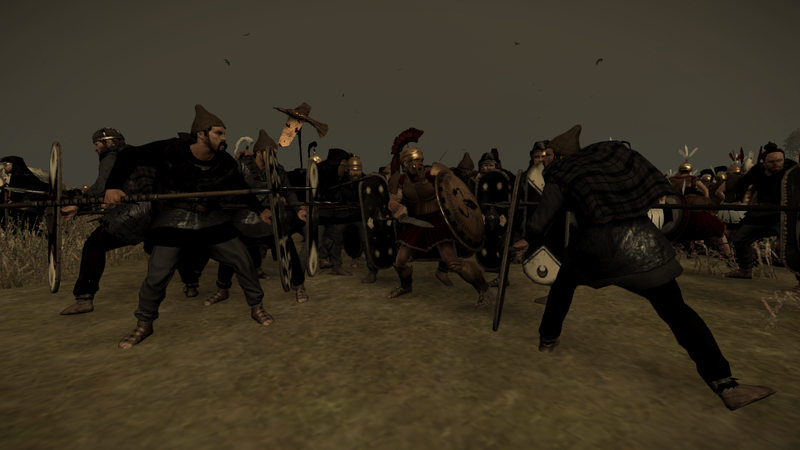 The enemy general came to try to take some of us down, but he was met by the mercenaries, who were more than happy to face off against a Roman general. 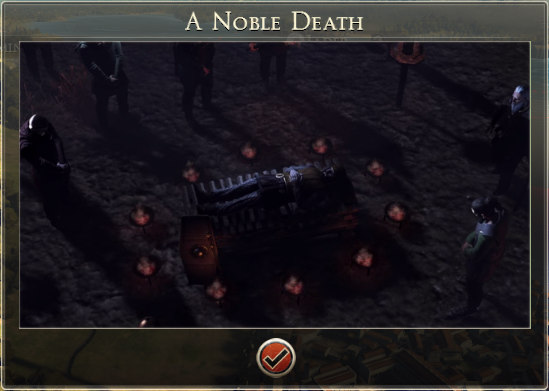 That general didn’t last long, and ended up dead in the streets like his men. The last few defenders didn’t stand a chance. 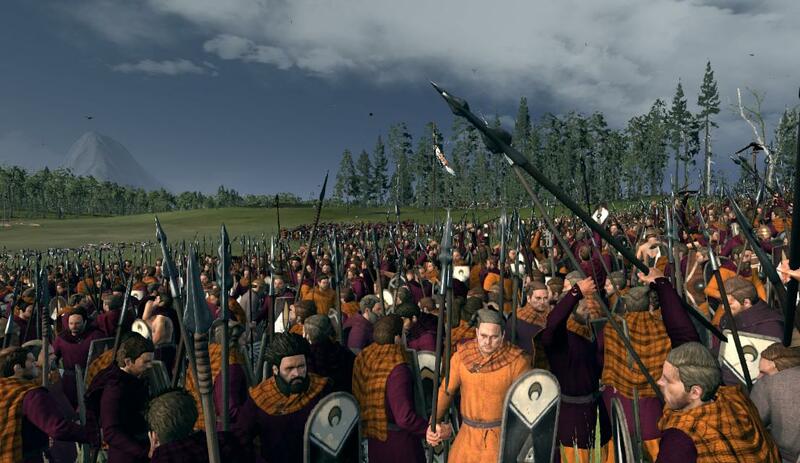 Medhlan was ours, the first major Roman city to fall to our spears, with very minimal casualties. I forgot to take a screenshot of the results. Again. My bad. With Medhlan ours, we had to clean up the enemy agents surrounding the city, and a cloak and dagger war began, which we had much success in. 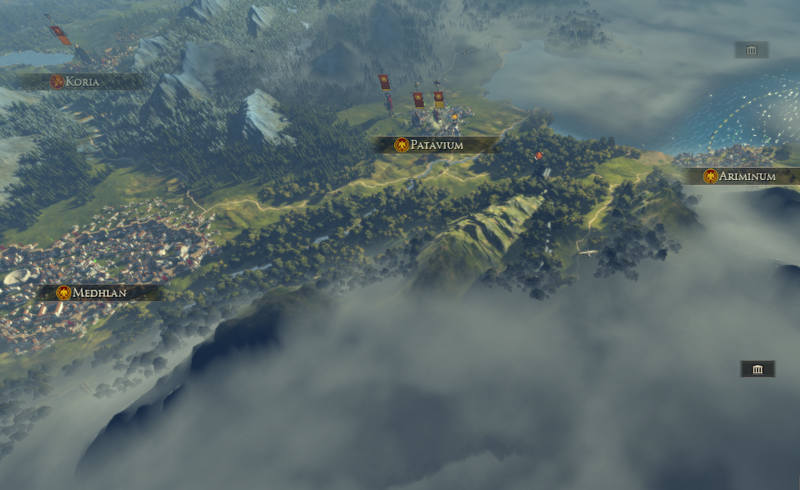 In the meantime the Wolves of War advanced on Patavium. 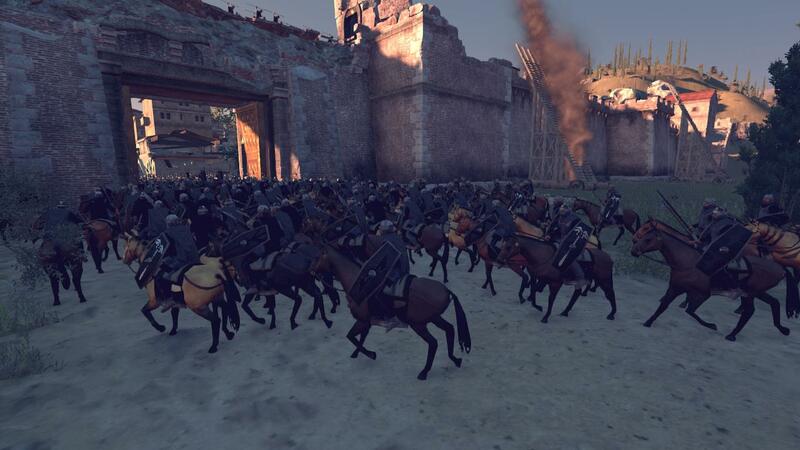 The small Roman garrison didn’t stand a chance, and were on the run before long. 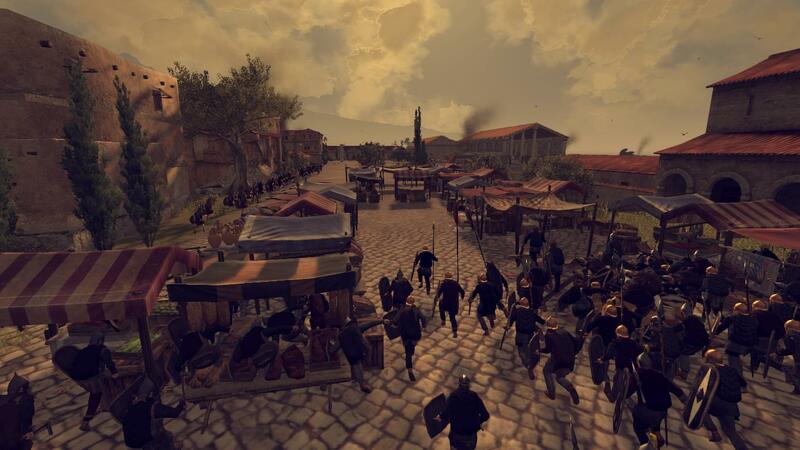 We began to bring up more armies to press our attack further as we dealt with some unrest in our newly captured cities. 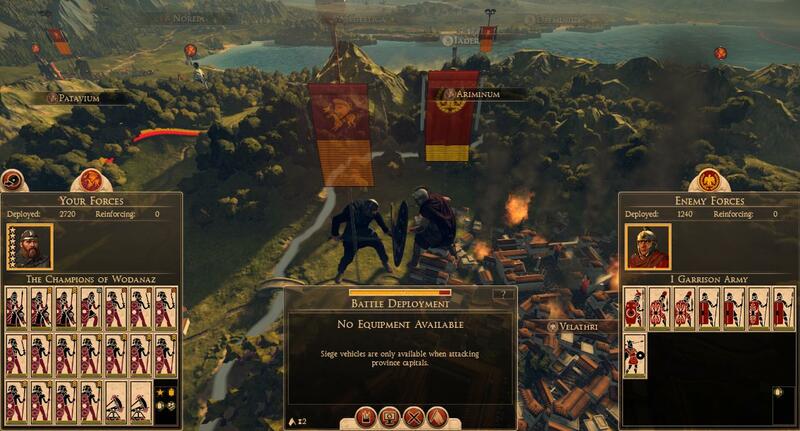 Clearly the Romans in those towns didn’t appreciate us overthrowing their fat Roman leaders. Word of our conquests were spreading like wildfire, and envoys from all over were arriving to make peace and agreements with us, for nobody wanted our wrath to come down upon them like it has on every enemy of ours before. 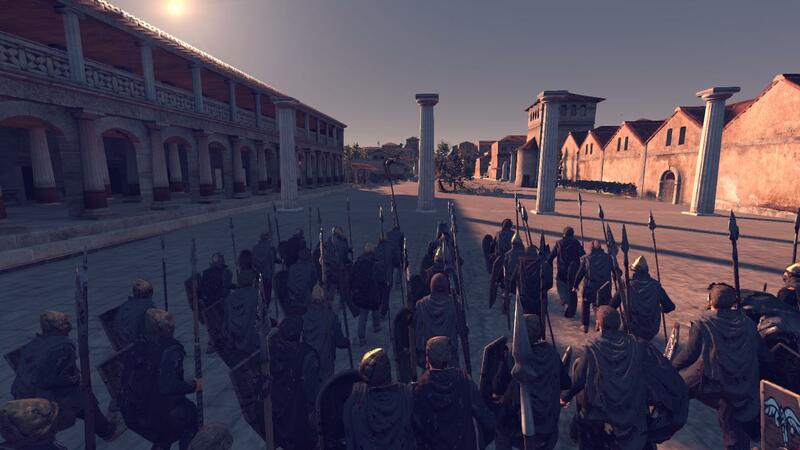 The Spears of Tyr marched on Genua, another lightly defended Roman settlement. 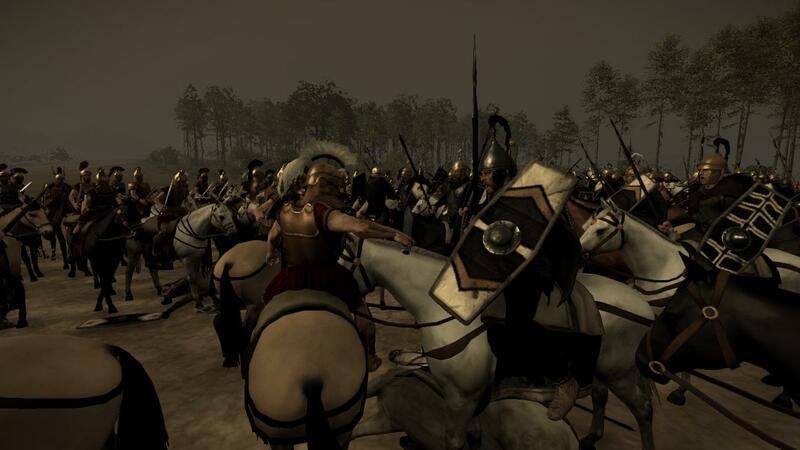 There were Bloodsworn among the soldiers, and they were just itching to have a crack at the Romans. 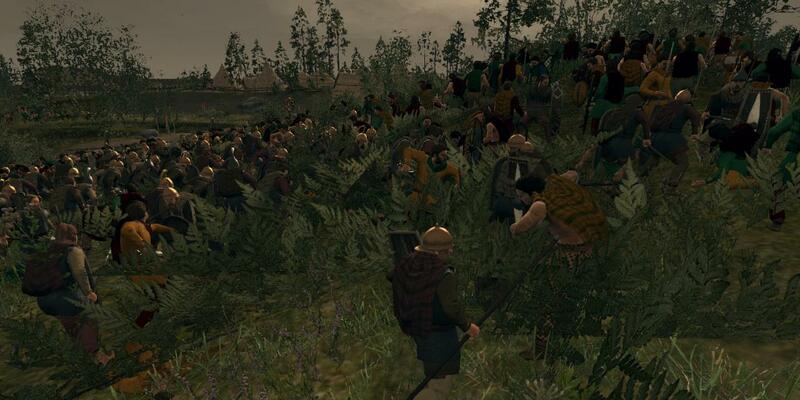 As a diversion, we placed some men on the hill overlooking the town, while the rest were put in the forest, hidden. The Romans waited uneasily, knowing that their doom drew near. 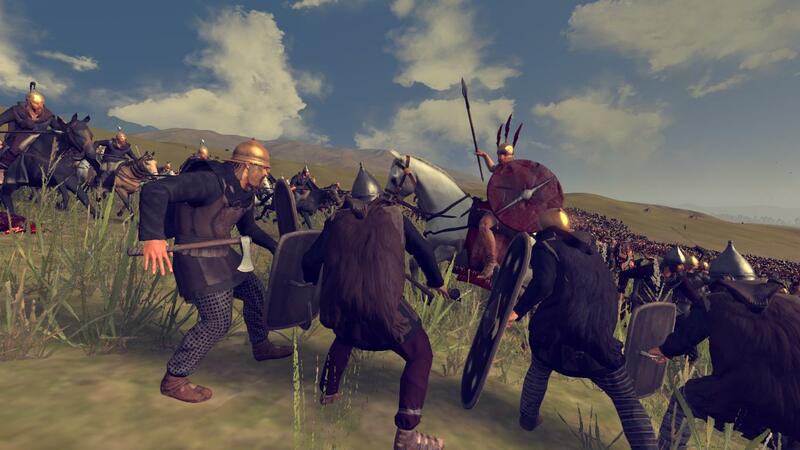 The Romans sent a unit to scout us, and were quickly shattered, as our men ploughed through their marketplace, jumping over stalls, or in some cases, just knocking them over. In the town square, the Romans put up little resistance, and didn’t take too long for them to rout, and the town was ours. After our victory, the Aedui sent an ambassador, asking us for an alliance, and in return they would join our war against the Romans. The cloak and dagger war was still going strong as well, and increasingly in our favor, although our public works projects in our new towns were being consistently undermined. 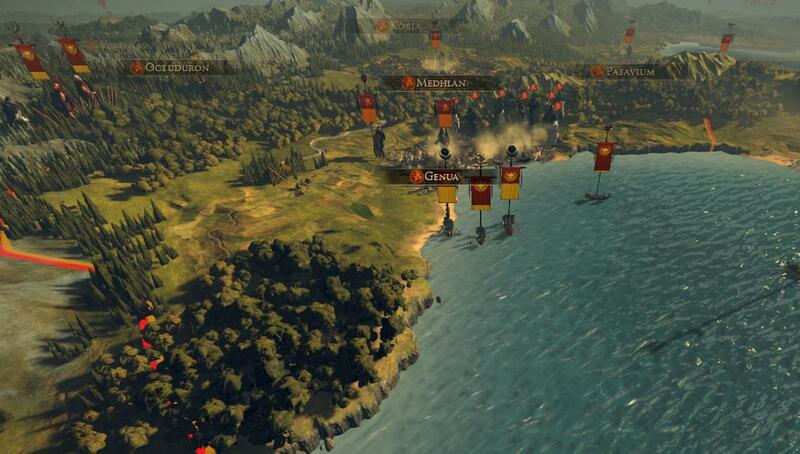 During this fight I returned to our lands to refit my army before we were to take Roma. 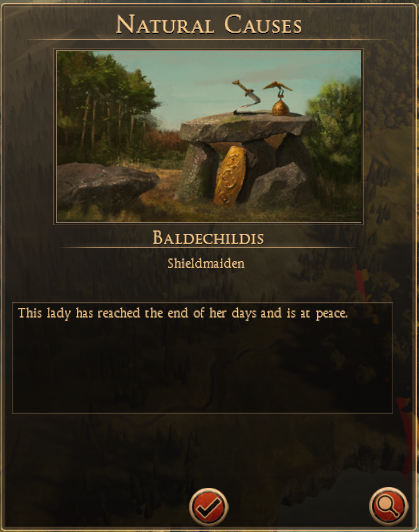 During this time I heard that the oldest Shieldmaiden we had, Baldechildis, died at the old age of 65. She had served our people well, helping train my men from the very beginnings of my reign. She would be very missed, and I ordered a memorial to her be placed in the capital. On the home front, I could tell that the other chiefs were not happy. There were murmurings of discontent and even rebellion. Some people were not happy for us going after the Romans, a people so foreign to us that some people viewed them as corrupt demons who would be our downfall. Then I got word that there was an attempt on Friduric’s life. He survived, but it was proof that there was another storm brewing, not from the south, but from within. 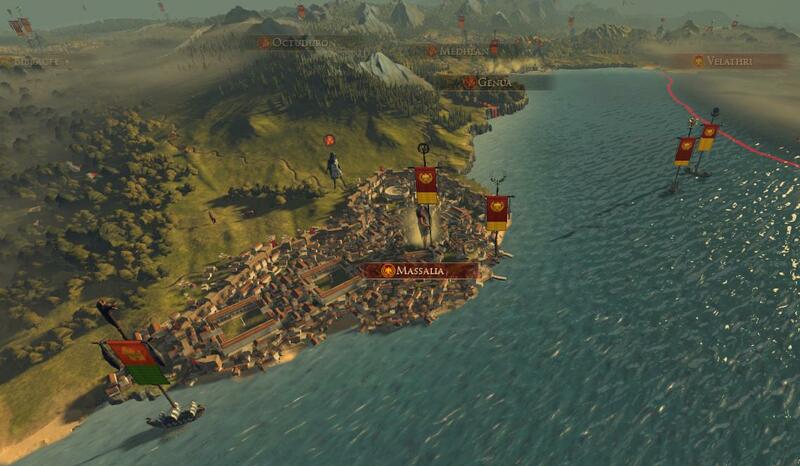 On the horizon there was the Roman fortified town of Massalia, considered the jewel of Iberia. The Spears of Tyr were going to take it once Friduric recovered. 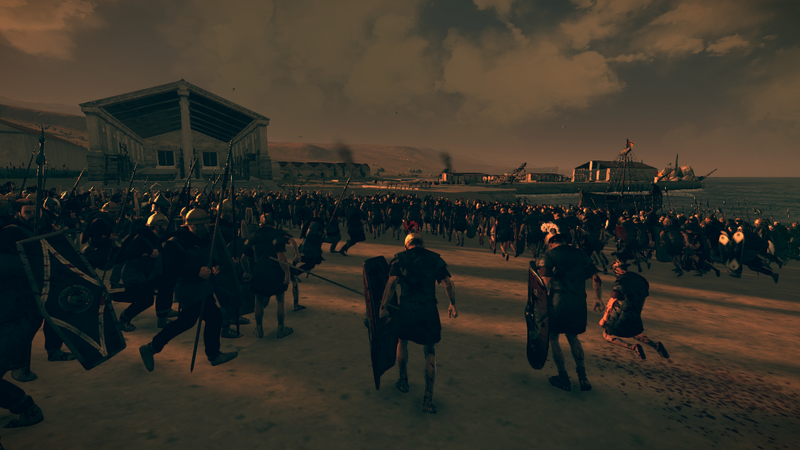 It was going to be a tough fight, and there were numerous Roman armies out there to challenge us, but I have confidence in our arms. 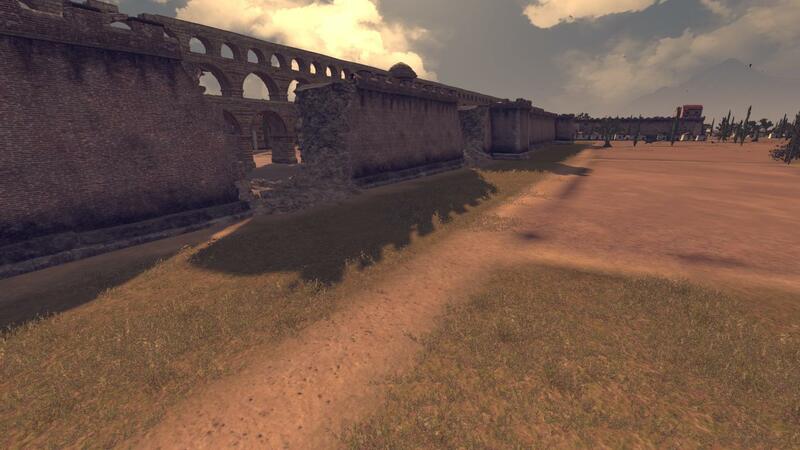 Also on the horizon is the town of Ariminum, with another two full sized Roman armies defending it. 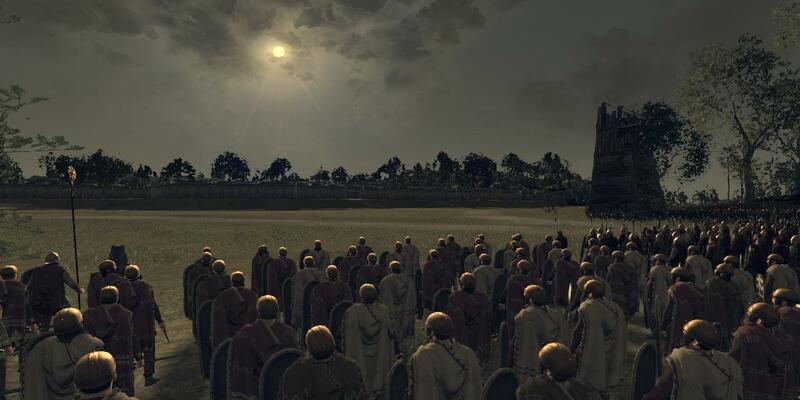 There were a number of Aedui forces hanging around the border between them and the Romans, so Ricfried, considering Octuduron to be safe from Roman attack, took his Bloodsworn and began to march towards Massalia. 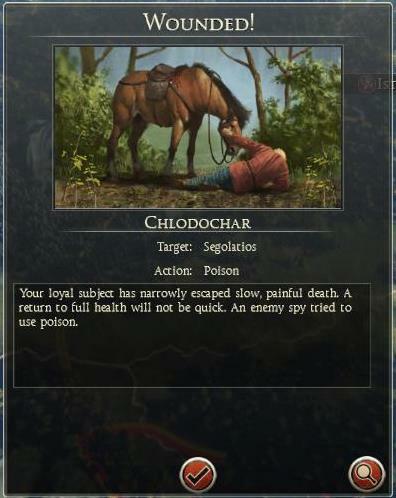 Unfortunately a Roman spy managed to poison the wells while the Bloodsworn were in camp, sickening many of his men. 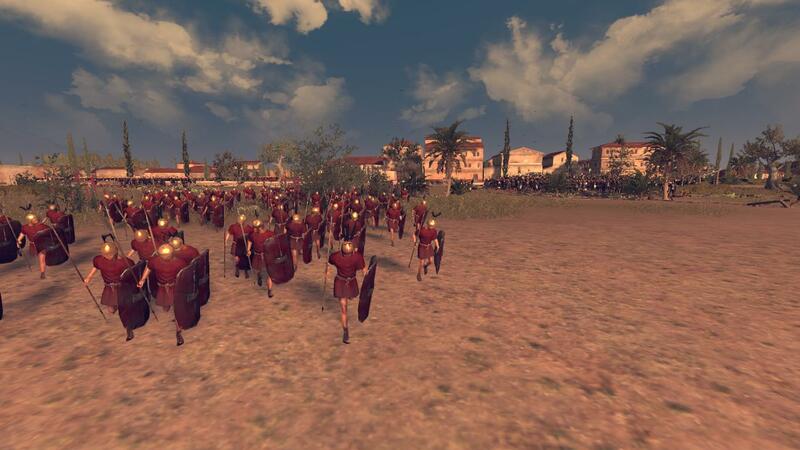 To make things worse, our scouts reported a number of Roman armies approaching, one of them large. 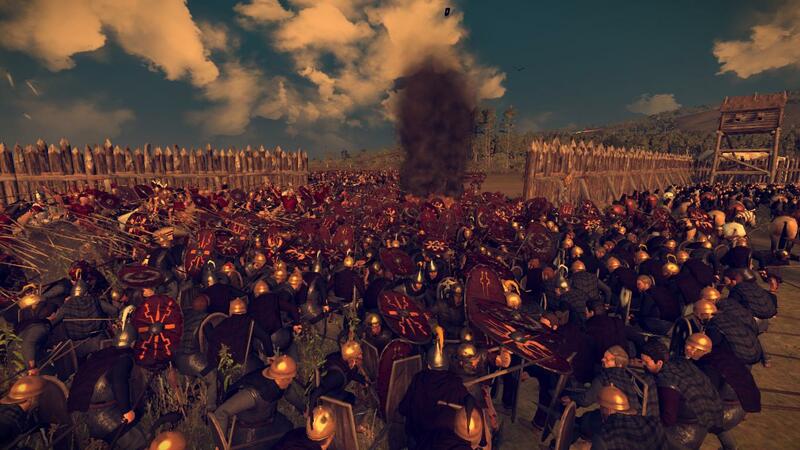 Our spies tried everything they could do to hinder their advance, but it looked like the Bloodsworn would be attacked by overwhelming Roman forces. 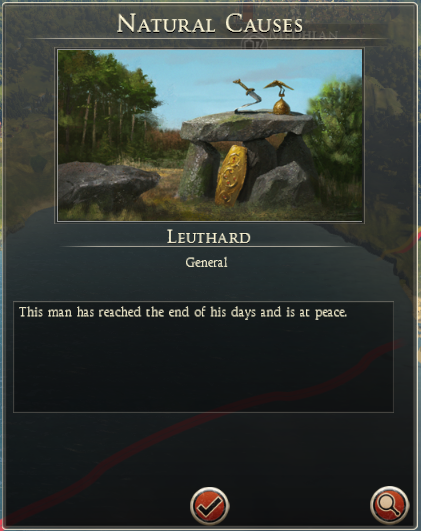 During this time my army finished refitting and was returning back to the front lines when I heard that a family member, Leuthard, had died from old age, reminding me of my advancing age. 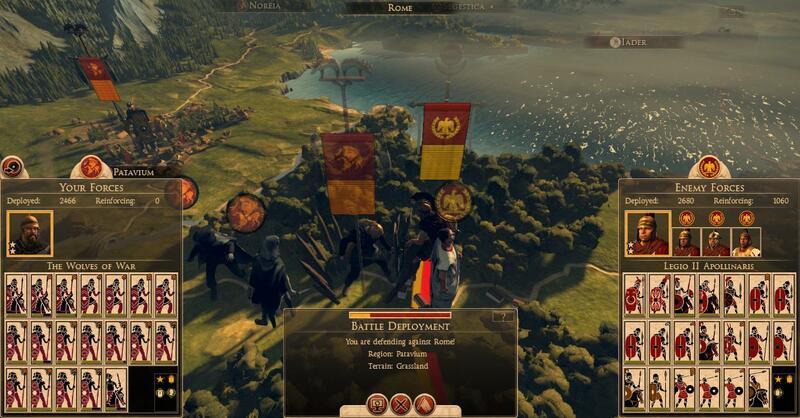 Hopefully I will live to see the day that our army marches victorious into Roma. 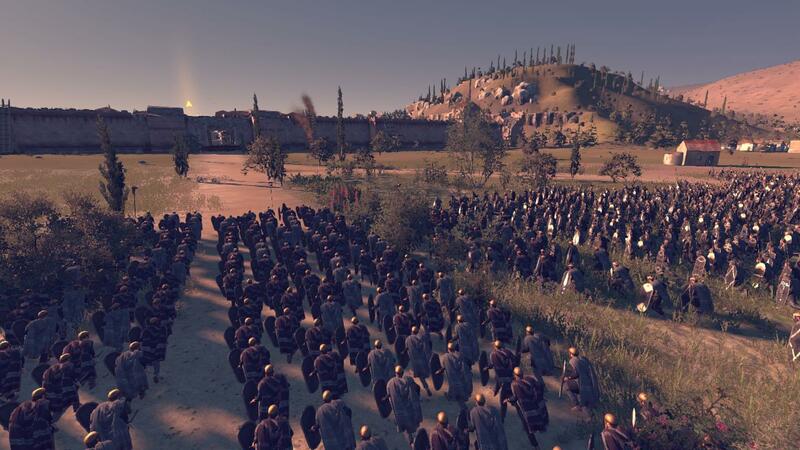 Then we got word that the larger Roman army, Legio XV Alpina, had advanced towards Genua and had made camp merely a two days march from the town. Perhaps they did not know that we had captured the town? Whatever the reason, they seemed unaware of our presence. Ricfried’s army was too far away to attack, so it was up to the Spears of Tyr to defeat that army, with a little help from our agents who were secretly poisoning their wells. The day of battle was a sunny one. It was the kind of day I would bring my family to sit outside, bring some food, and enjoy the weather. But today there was killing to do. 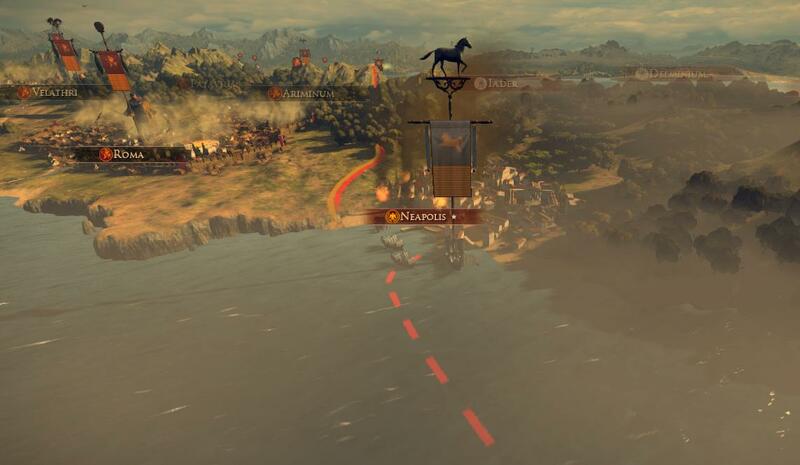 As we formed up we could see the Roman dogs in the distance, maneuvering into the best formation they think will stop our juggernaut. Our warriors closed the distance. 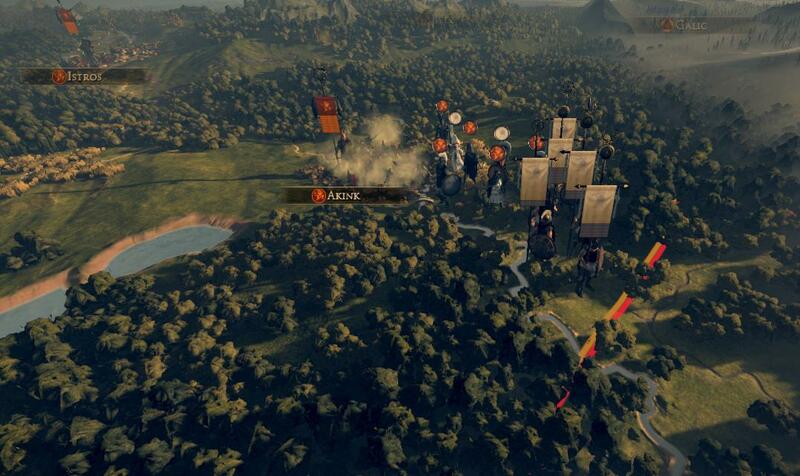 Under fire from Roman ranged units, we charged into battle. 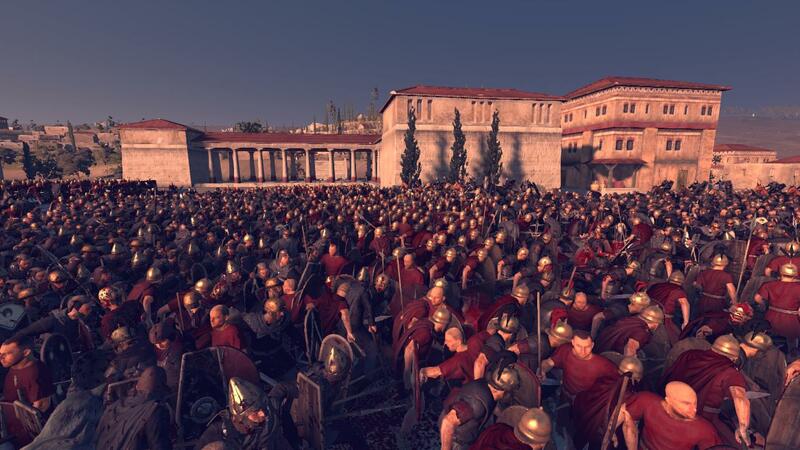 The Roman front line was units of Roman city guards conscripted to march with the main army. Why they did this seems unwise, as they were mercilessly slaughtered by our experienced warriors. On the right flank our combined cavalry and infantry clashed with their heavy cavalry. 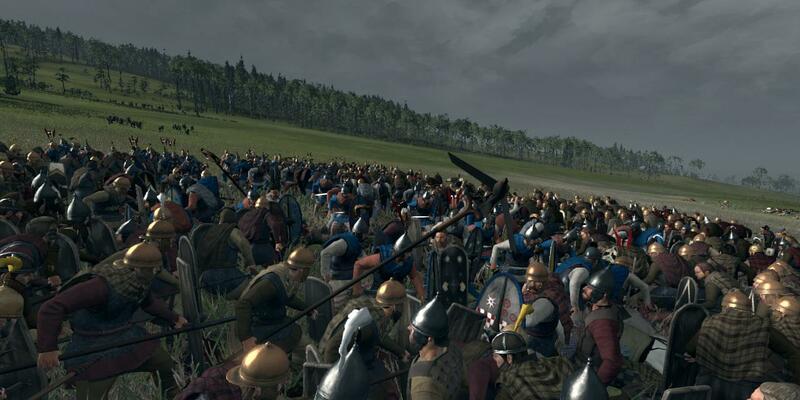 On the left flank we squared off against heavy Roman cavalry, who didn’t stand a chance due to our sheer numbers. The center was a different story. 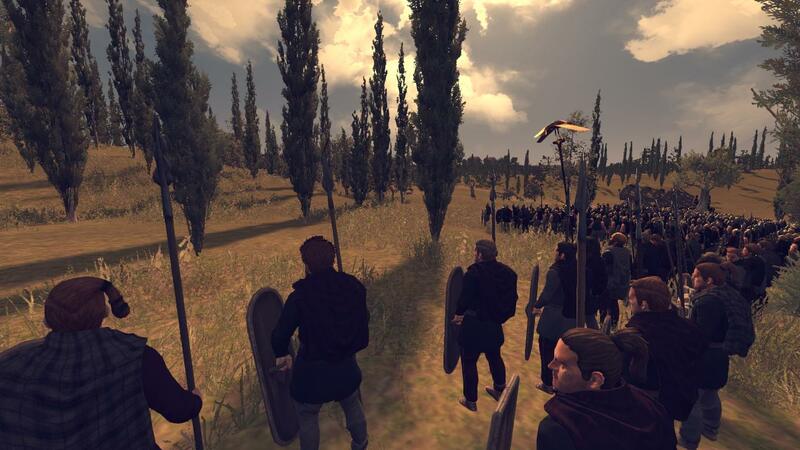 We were facing off against the heavily armored Roman legionaries, some of the finest professional soldiers in the world. We were evenly matched in that melee, with neither side giving an inch. But all resistance came to an end when our noble cavalry managed to ride around to the back of the Roman formation and charge. 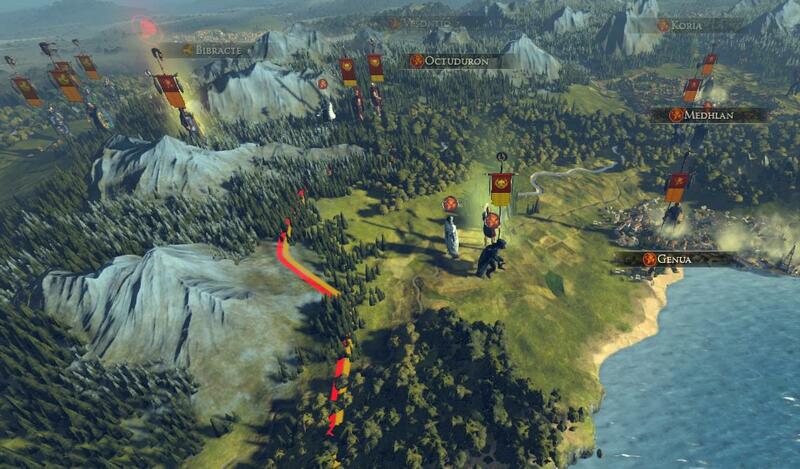 Soon the Romans were fleeing in a panic, as their lines crumbled and their leadership was lost. Our cavalry hunted them down mercilessly. We were determined to leave nobody alive. 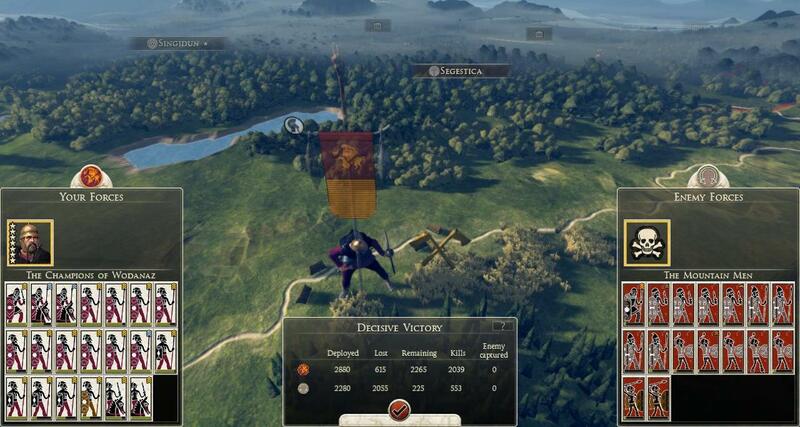 It was a bloody day, but we had won yet another crushing victory against the Romans. The enemy army was completely wiped out. By our count there were only eighty survivors, who scattered into the countryside. 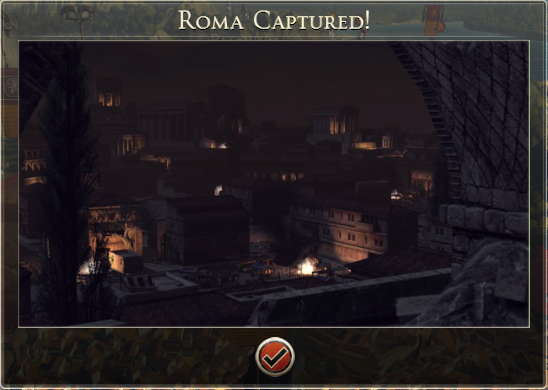 We also captured over two-hundred Romans. We executed them and sent their heads on a ship to Roma. We do not take prisoners. But there were more Roman armies on the horizon. 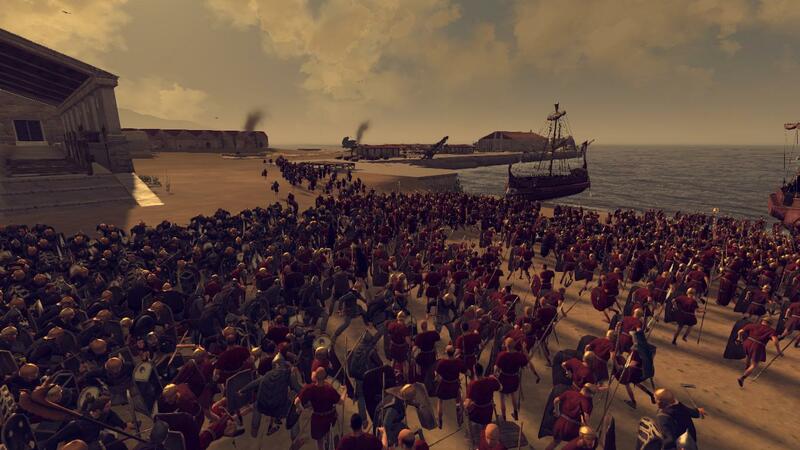 Our spies report that there are numerous very large Roman armies at sea, waiting for the opportune moment to land and wreak havoc. 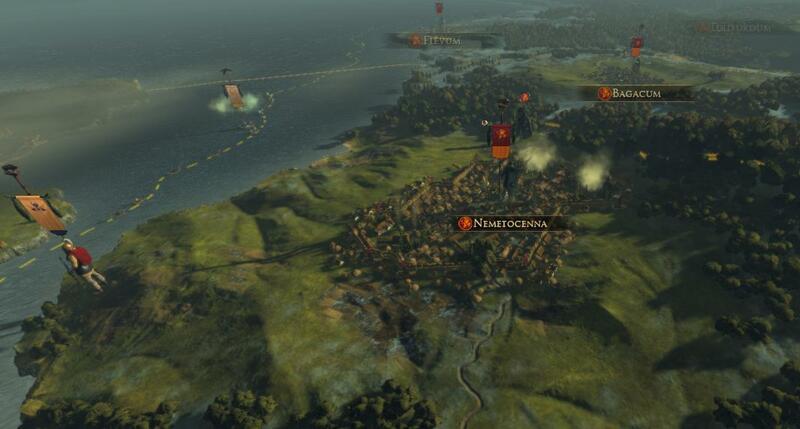 Meanwhile the Aedui armies had taken the Roman town of Nemossos and were now advancing towards Massalia. Or Genua. Hopefully Massalia. We do not need an ally backstabbing us now. Our progress towards Roma had slowed to a halt. 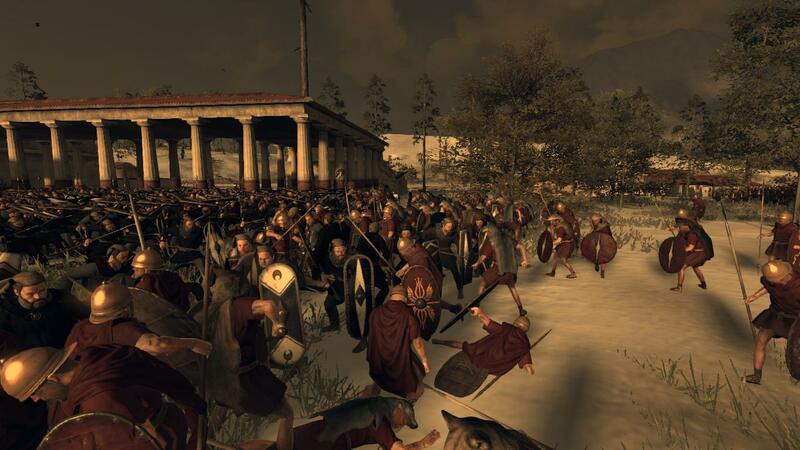 We would have to resume our progress quickly; otherwise we might face much stronger Roman armies. The Romans were clearly regrouping and counter-attacking. We had to regain our momentum, and I had just the plan to do so. 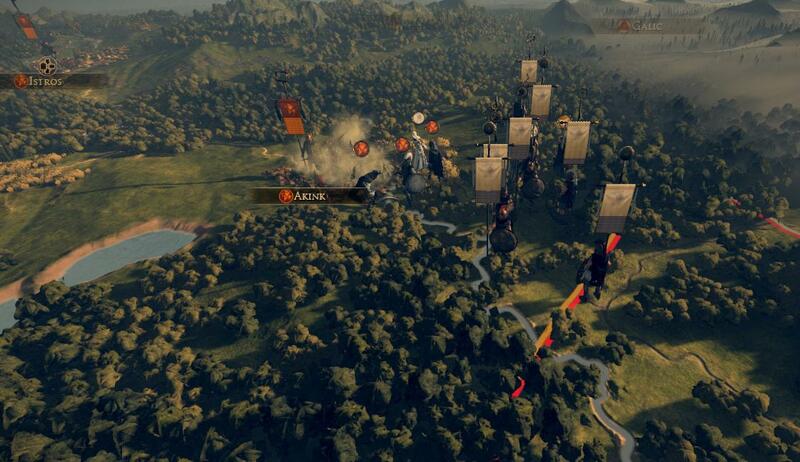 In order to regain our initial momentum, we would have to overwhelm their defenses like we did at the start, hit them multiple times in quick succession and they will be thrown off guard. My plan, which I called the Leuthard Plan after the recently deceased Leuthard, involves at least two armies on the attack. 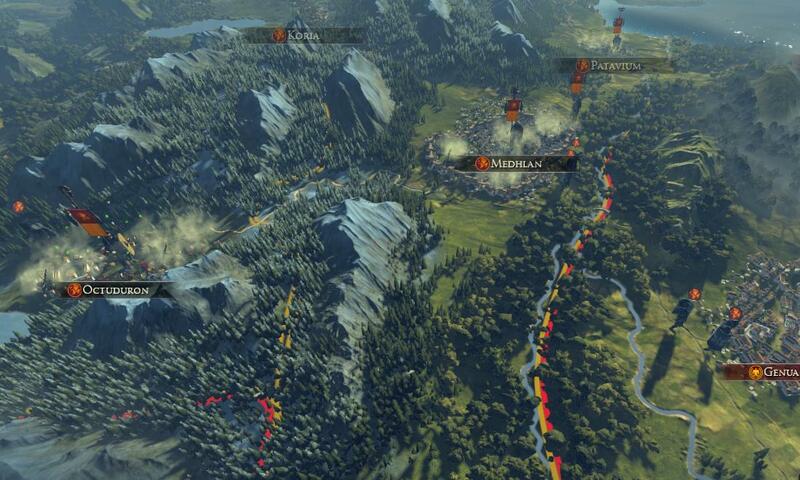 One of the armies would by my army, the Champions of Wōdanaz, and the Wolves of War would be the frontline armies. 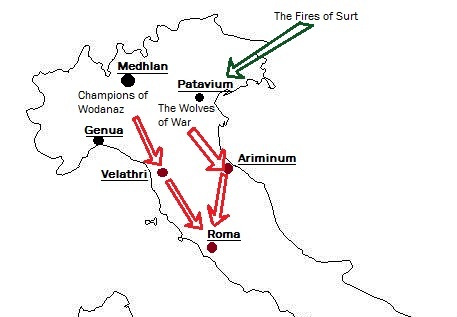 Meanwhile, the Fires of Surt would be sent town to defend Patavium. 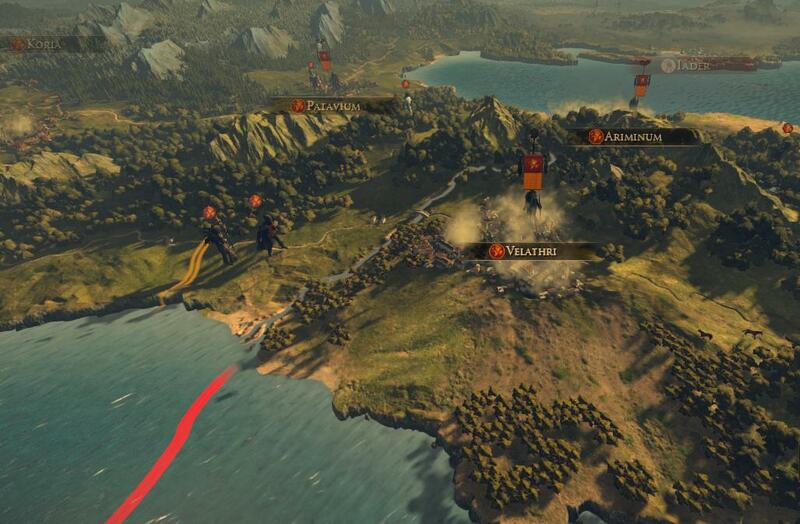 I would first take the town of Velathri while the Wolves of War would take Ariminum. 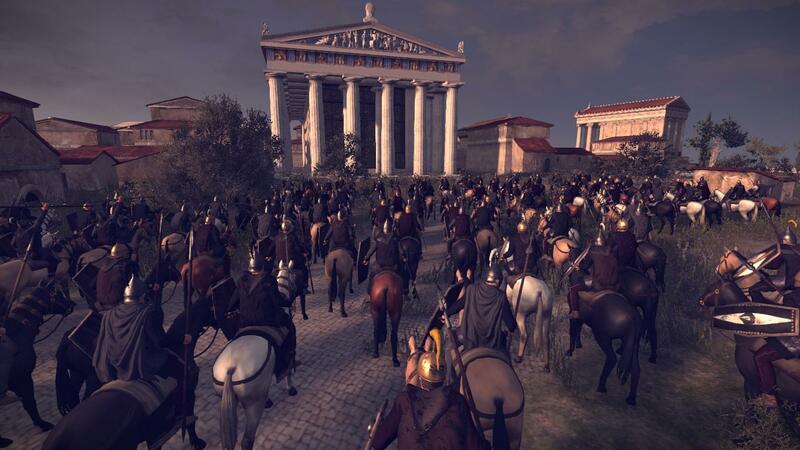 After each town was taken we would converge on Roma and take the city. But as the saying goes, man makes plans and the gods laugh. 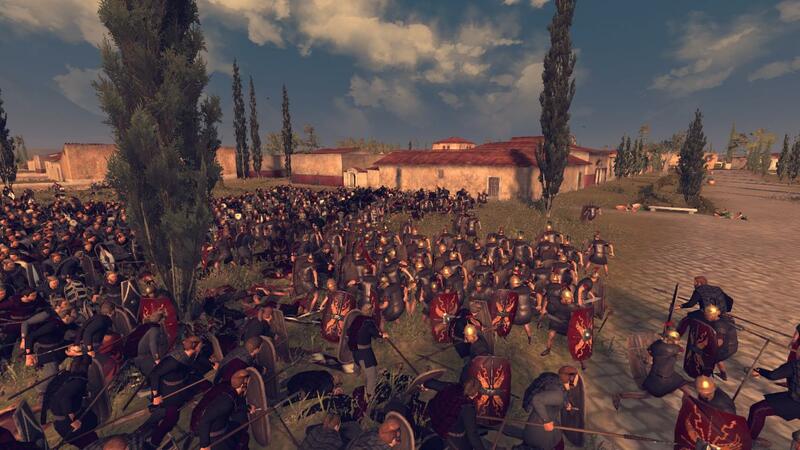 Initially our scouts reported that there was an increased Roman military presence around Velathri and Ariminum, but it would be nothing that our armies couldn’t handle. 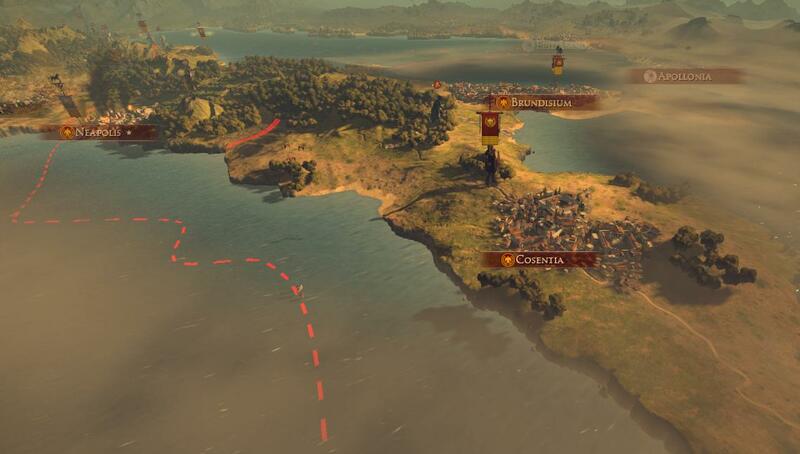 Though it was the Roman naval forces were the ones that concerned me, I was confident that the Spears of Tyr could handle it, though to be safe I moved my men closer to Genua. 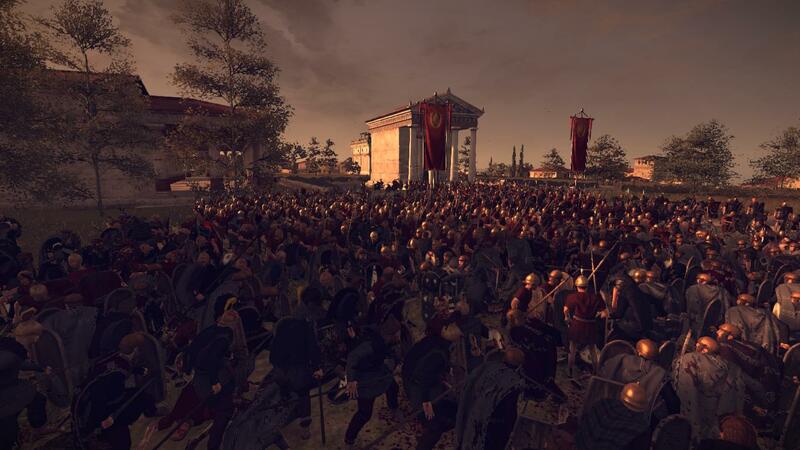 The Wolves of War, who had made camp on the border waiting for my go-ahead for the attack, were suddenly attacked by a very large Roman force. 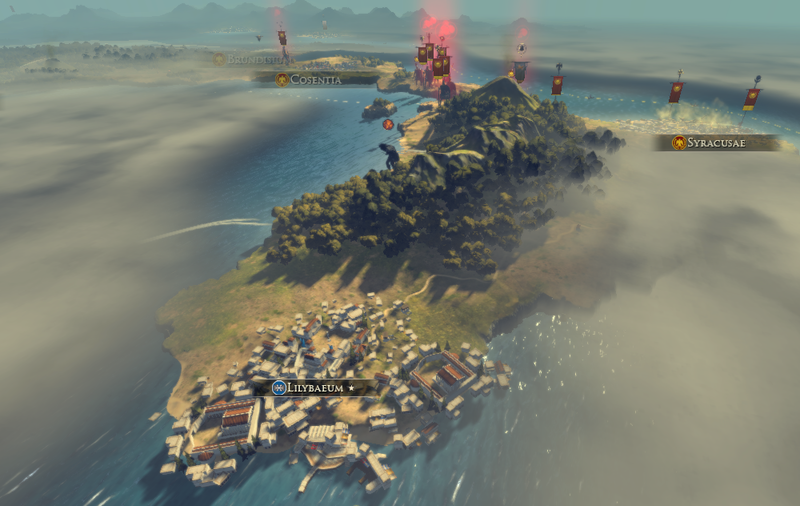 Due to some tactical feints, the Romans made us believe they were coming from the north, when in fact, shrouded by the heavy fog, they came from the east. So while they were forming up for attack, we were forming up on the wrong side of our camp! 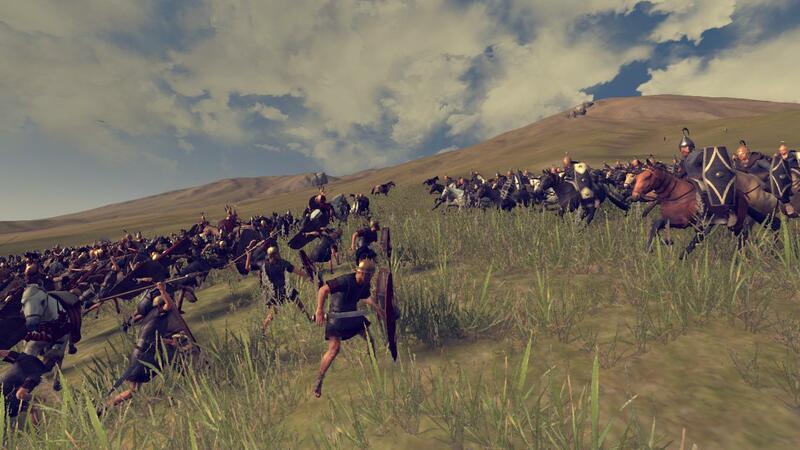 When we noticed our mistake, our men had to sprint to meet the Romans for combat. 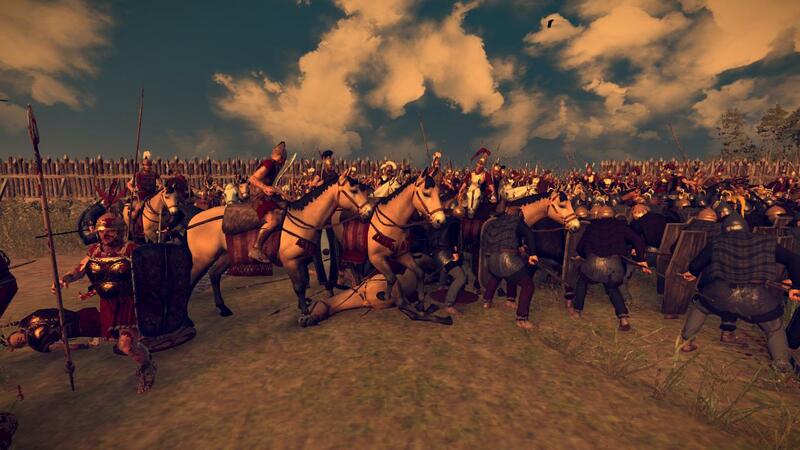 Being on horses, our cavalry got there first, in time to intercept Roman heavy cavalry. 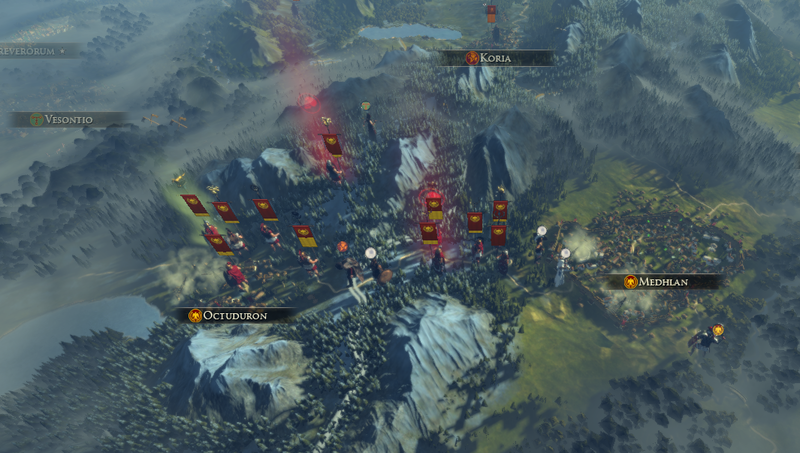 As our main lines clashed, we realized that Roman reinforcements were coming in from the north. 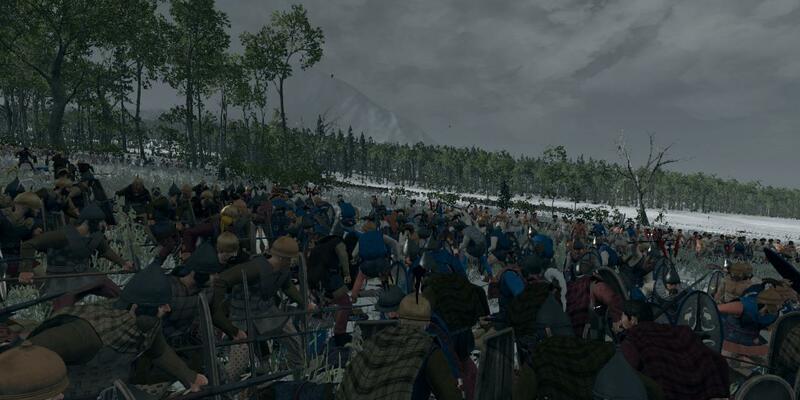 We had to reposition our lines quickly or we would soon find ourselves surrounded. 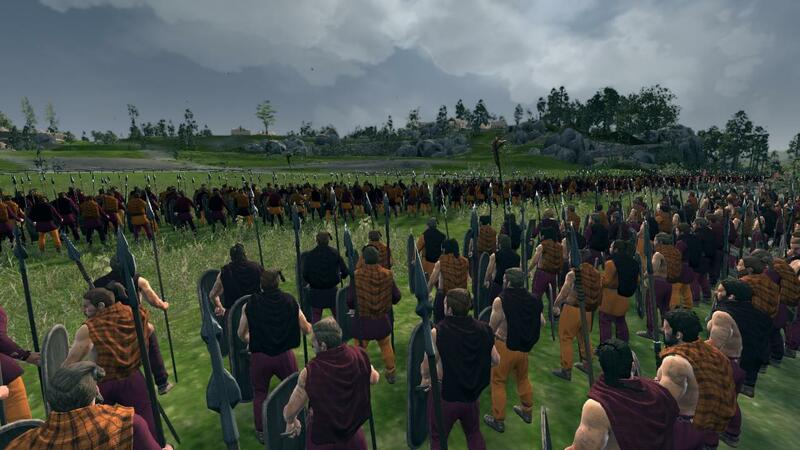 To mitigate the chance of being surrounded, we sent a unit of elite spearmen to guard the northern gate of the camp. 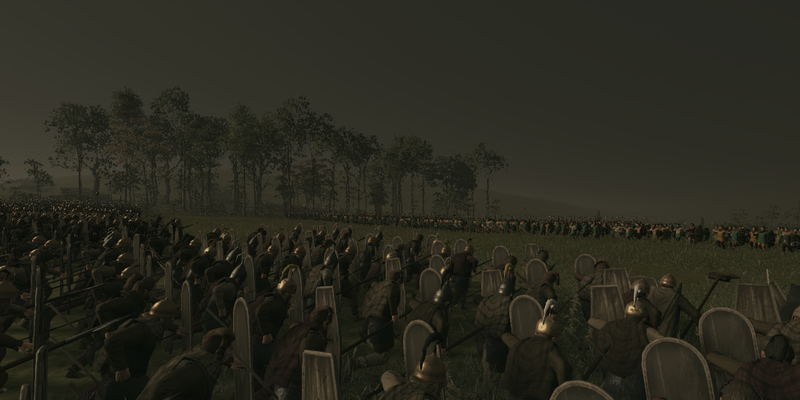 While we were trying to reposition our forces, a unit of Roman legionaries broke through our lines and charged straight for the vulnerable camp. Our units were able to chase them down and defeat them before they got there but it showed we had major holes in our defenses. It was a tough battle, but it seemed like the worst was over. 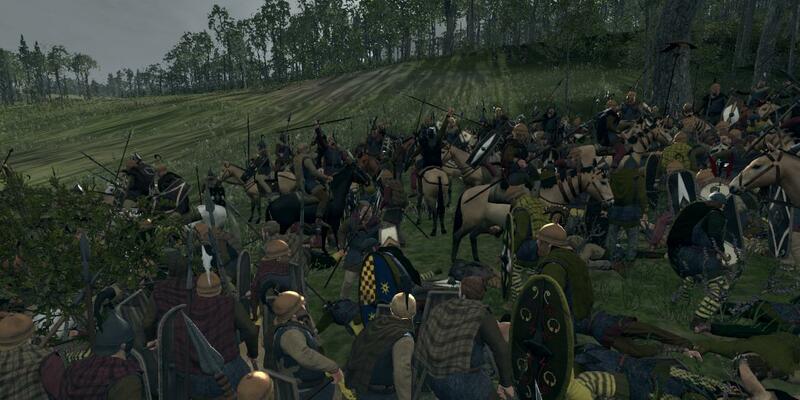 As our men repositioned to meet the threat from the north, we could see how much carnage was wrought. 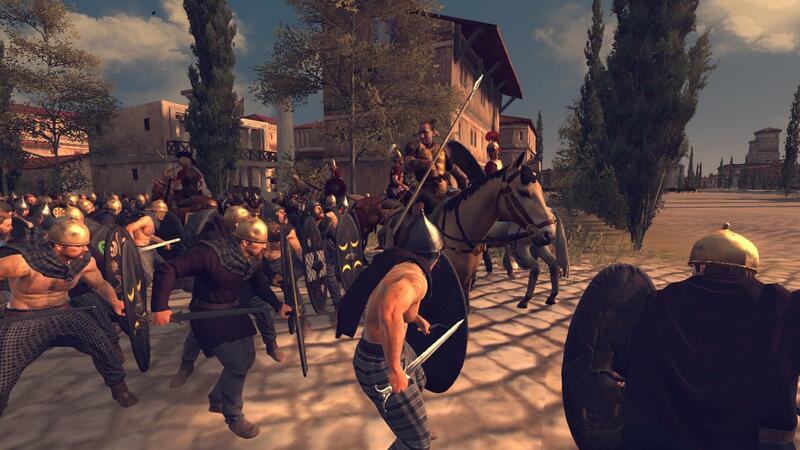 The new Roman reinforcements consisted mainly of elite Roman infantry and a unit of elite Roman gladiators. The initial unit of spear brothers which were sent to counter them were soon overwhelmed and had to withdraw. They were soon backed up by the rest of our forces who had just arrived. 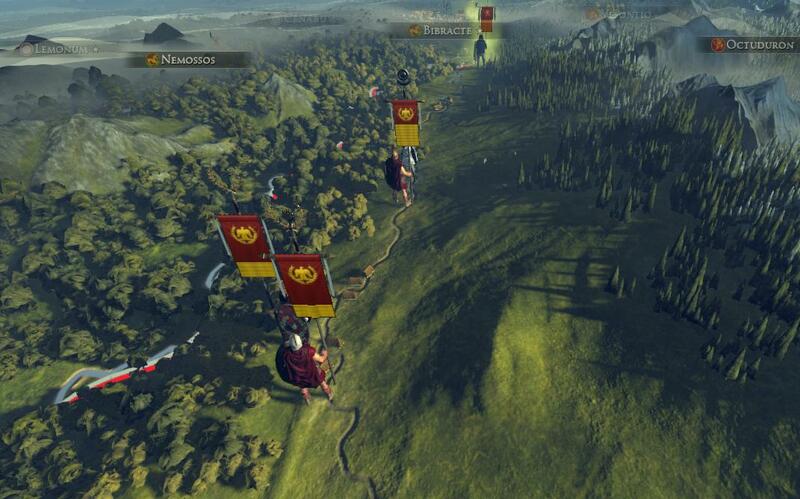 One Roman unit broke away and made a mad dash for the camp, apparently trying to kill our general, but a unit of spear brothers caught them before they could achieve their goal. 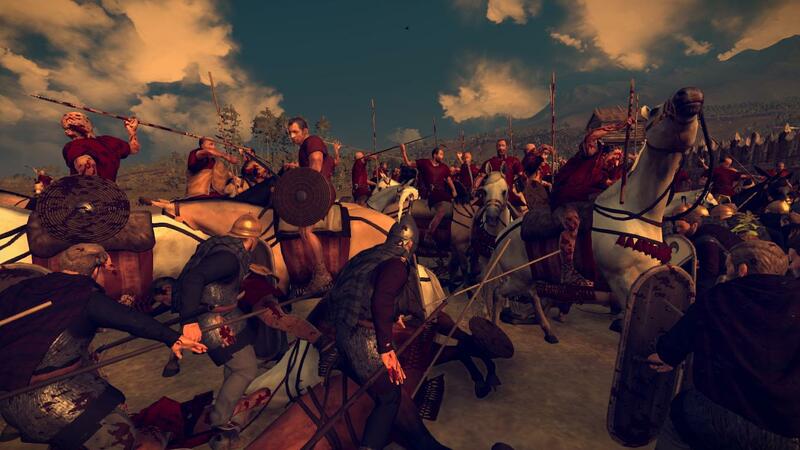 The Romans began to break, and our men ruthlessly rode them down. We had won the battle, but at serious cost. One of our units of light cavalry was completely annihilated. 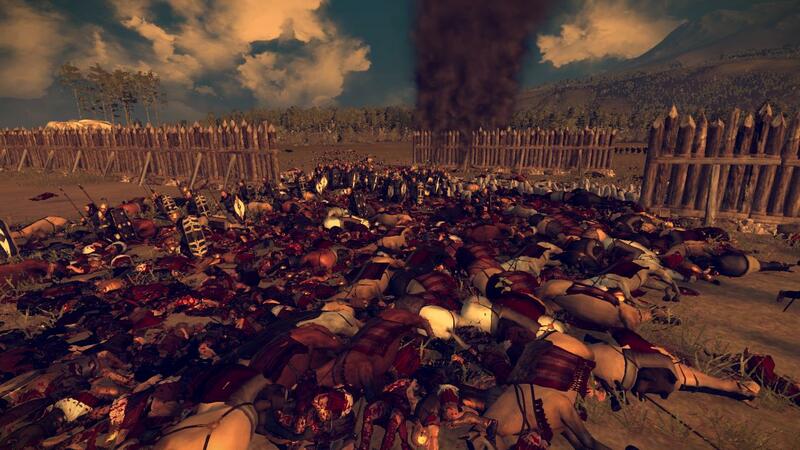 They fought bravely, killing as many Romans as they could before they fell to the more heavily armored Romans, but they were entirely wiped out. 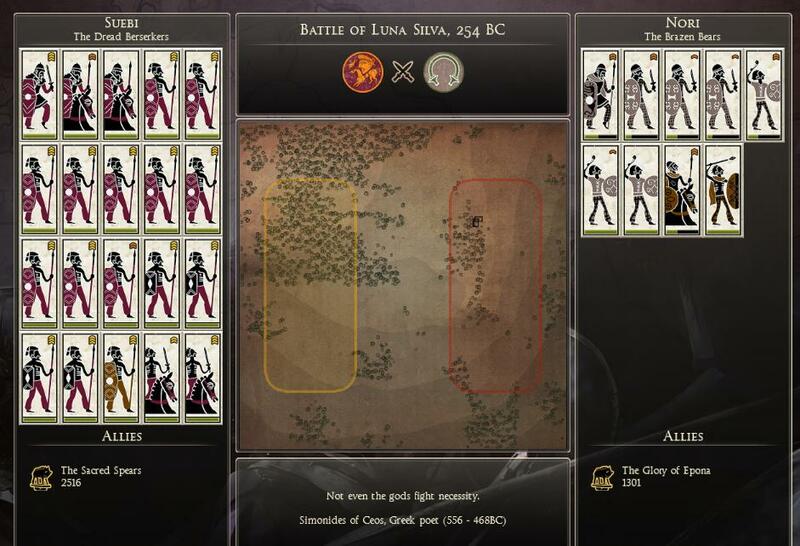 A number of our units of spear brothers were decimated, although not totally destroyed, so that is the silver lining I suppose. 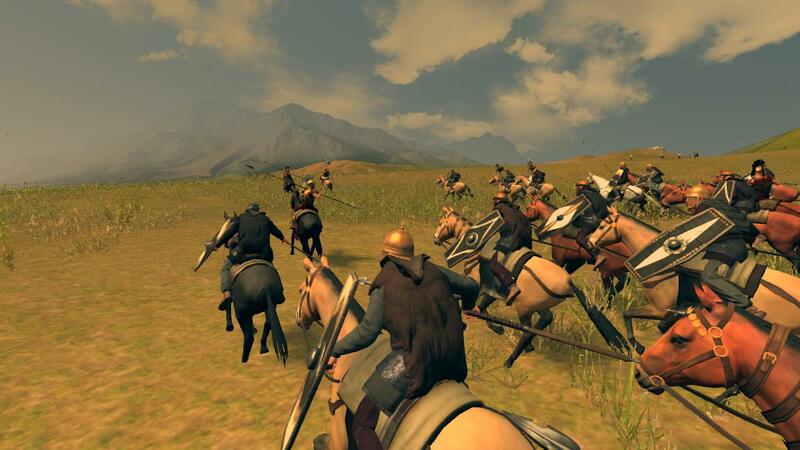 But in the end, we had come out victorious and the Romans were on the run again. But with good news always comes bad news. 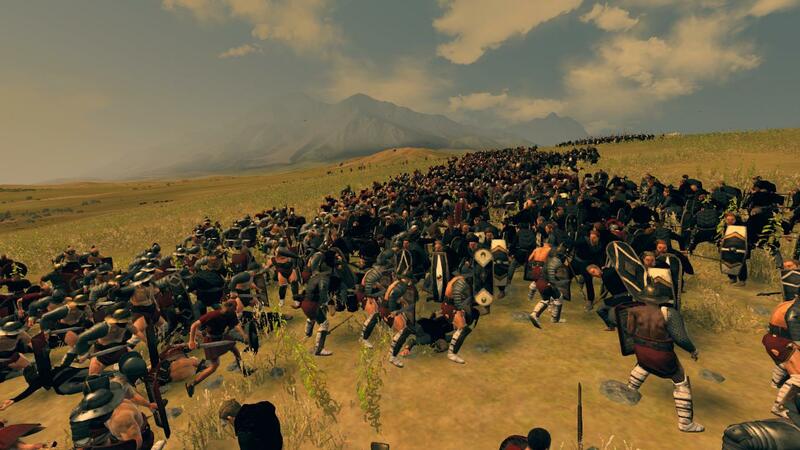 Scouts reported that near Akink was a massive horde of Ardiaei soldiers. Our estimates are in the tens of thousands. 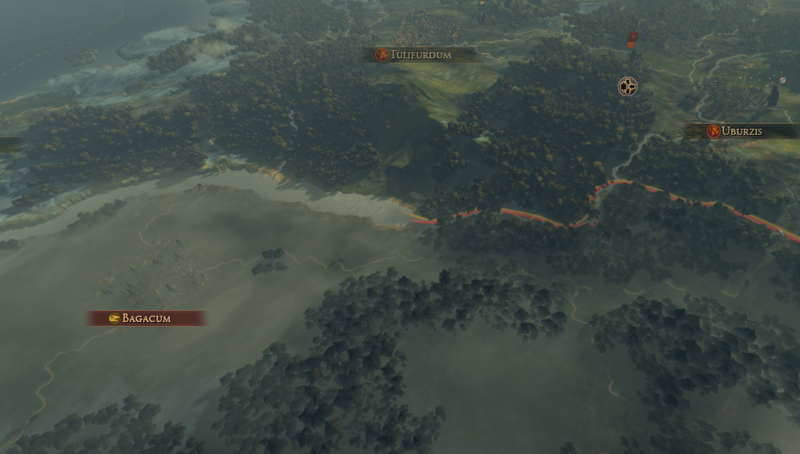 I fear greatly for the garrisons in the area. 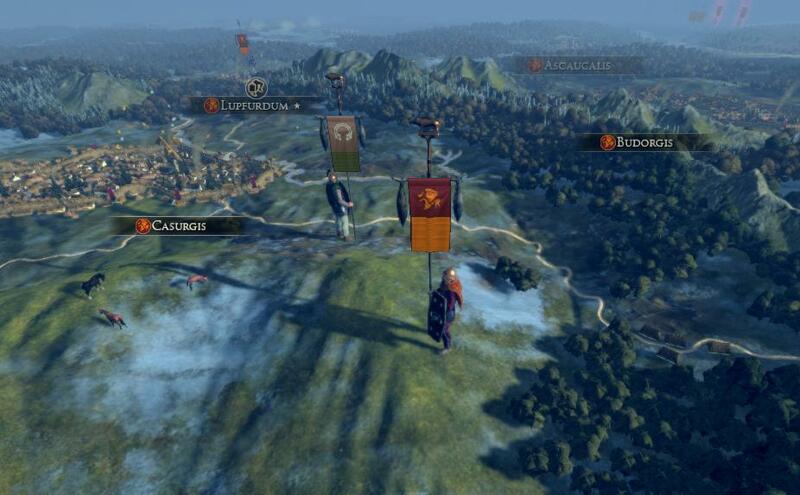 We do not know what their intentions are, but since they are allied with Rome and enemies of ours, it cannot be good for us. 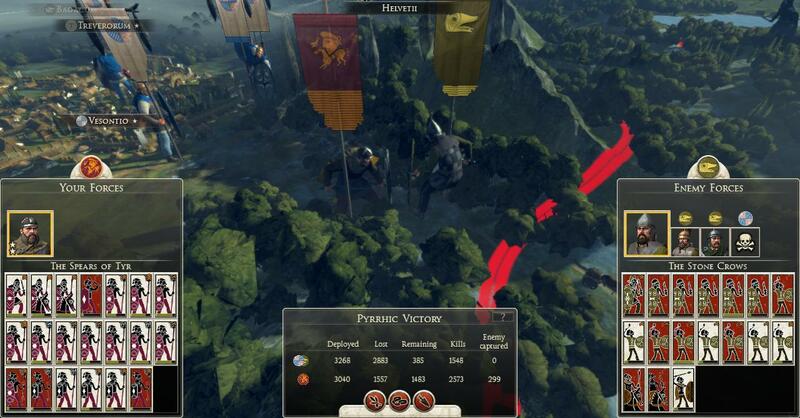 Less than a week after the first attack, the Wolves of War were attacked again by another numerically superior force. After what happened last time, we had put up barriers and traps on the entrances, and our Spear Masters were braced for impact. 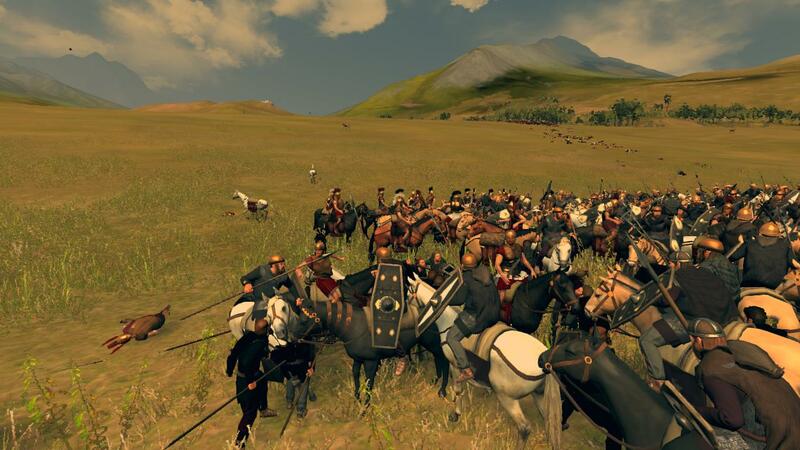 Due to the close quarters our Noble cavalrymen decided to dismount to be most effective. The Romans came from the west first, which was where our defenses were weakest; the other entrances had spikes guarding them. The western entrance, on the other hand, only had a flimsy wooden barrier. 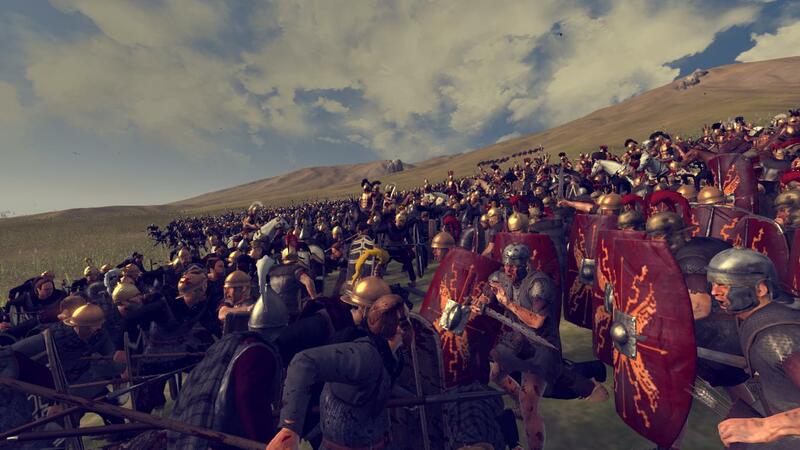 The barriers didn’t hold for very long against the over two thousand Roman troops pushing their way in. We threw more men into the fray, hoping to turn them back. 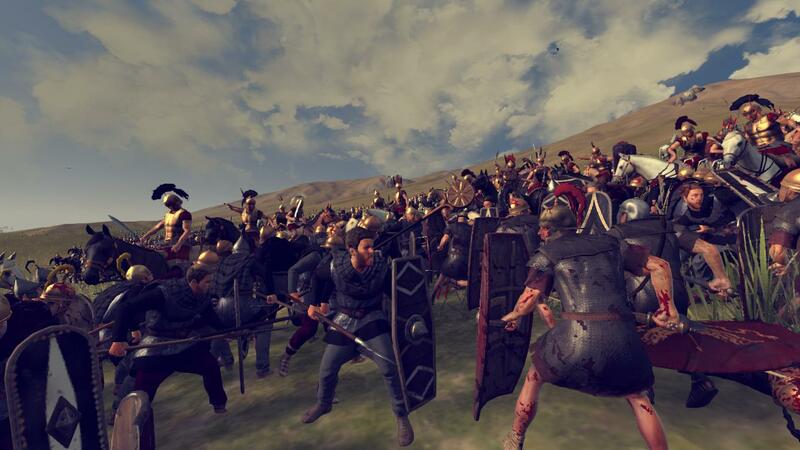 Our warriors tried their hardest to push back the horde of Romans but they could not hold back everyone. It was as if they were trying to hold back a tidal wave with a couple of rocks. For a while it seemed as if the Romans would push through and all would be lost. 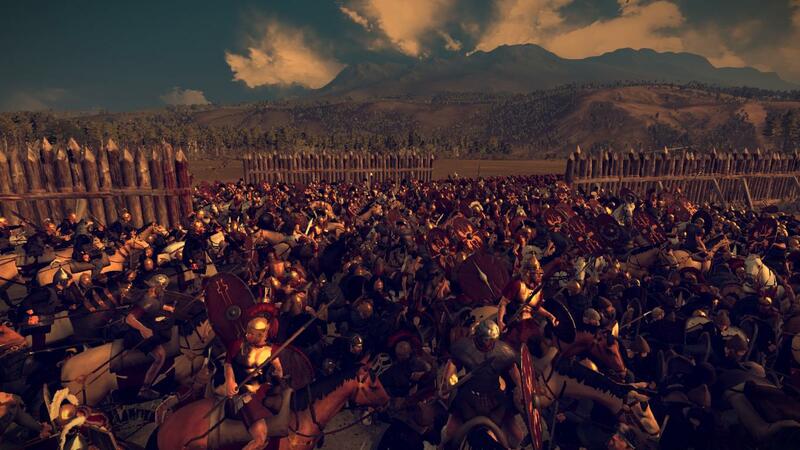 But finally after throwing enough men into the fray, the tide turned, and the Romans began to fall back. It was a vicious fight; blood was covering the ground and even the palisades of the fort and the entrance was clogged with bodies. 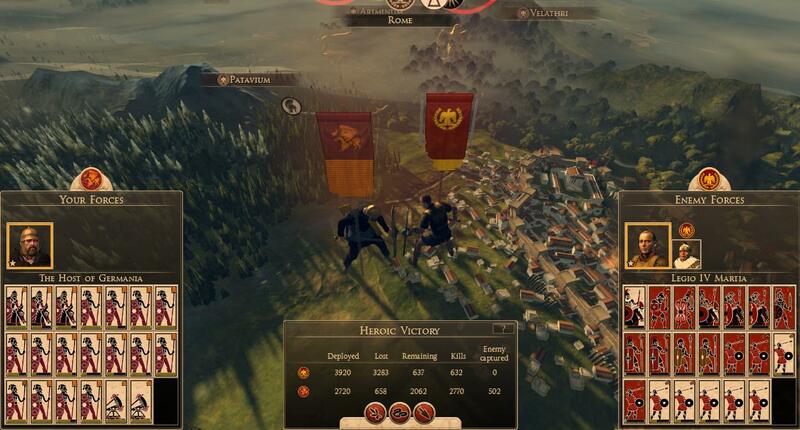 The Romans tried to counter attack with the survivors of the first wave, but they were easily beaten back. Then came the second wave, coming from the south. 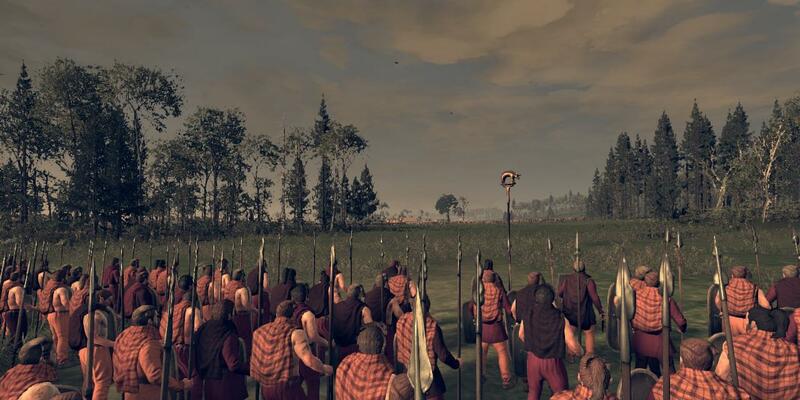 Celtic mercenaries came first, and they were torn to ribbons whilst throwing themselves against the spike defenses and our spears. Holding back the second wave was not as difficult as the first time, though some Roman cavalry did manage to get through, and they were swiftly cut down. Back on the western side, the remainders of the first wave had regrouped, and our men charged out to meet them in the friendliest of fashion. 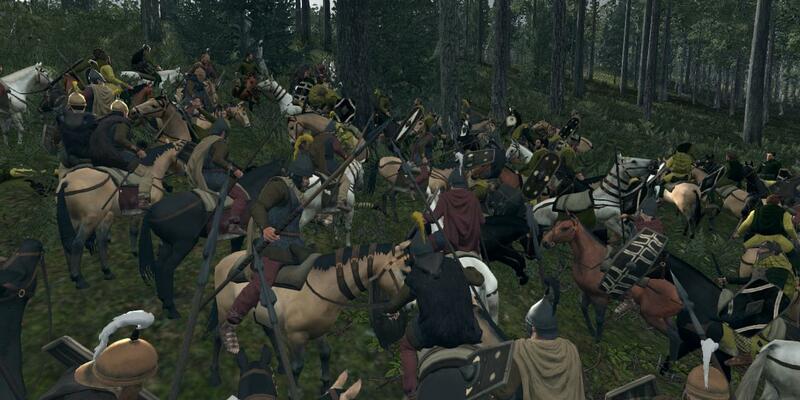 At the southern entrance our Noble cavalry had re-mounted and charged into the fray. 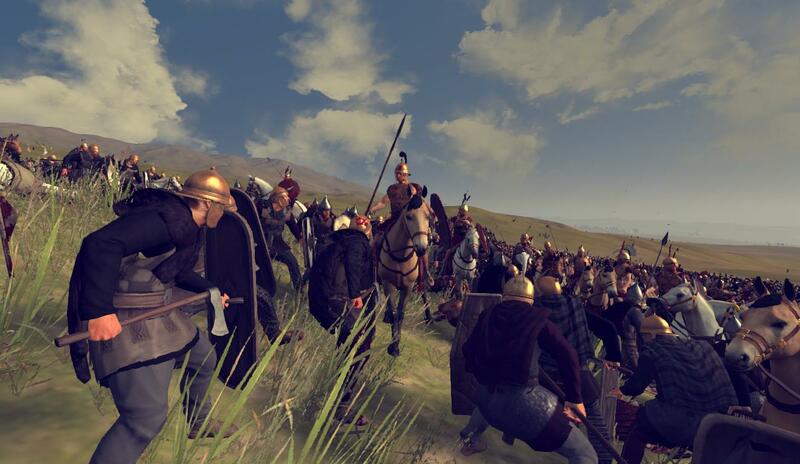 It wasn’t long until the Romans started to rout, which soon turned into a general retreat. It was carnage everywhere, even worse than the battle before. Our men chased down whoever they could catch up to, killing those who resisted, and killing those who surrendered. We would show no quarter in this war, and we expected none. 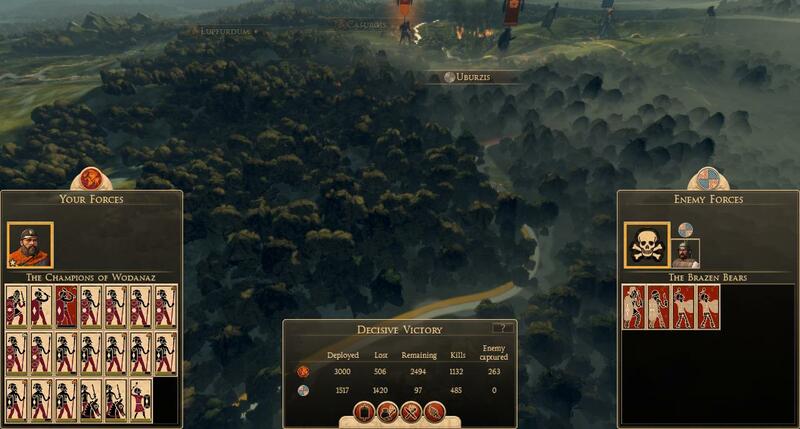 It was a great victory, considering that our men were low on supplies and manpower. In the grand scheme of things, I had fully recovered from the assassination attempt, and I set out for Velathri. My plan would go ahead as planned. En route to Velathri, I received devastating news. Baldovin, one of my top generals and more importantly, one of my closest friends, died from a long bout of winter sickness. I will surely miss him, and it merely reminded me of my advancing age. It has been a long and rough road for us. 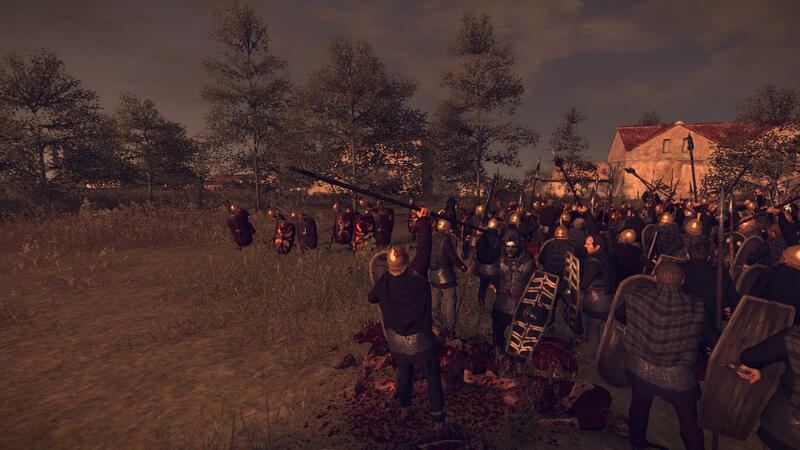 From a seemingly unending war with small Gallic tribes to a siege assault almost ending in disaster, the end was in sight. 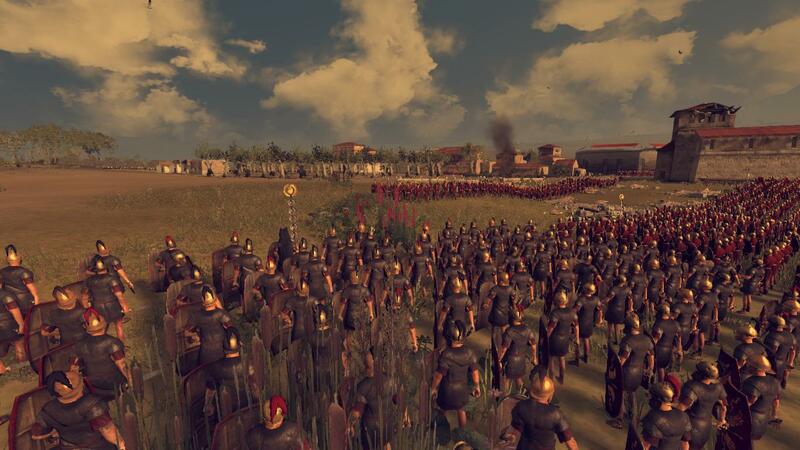 We had defeated all of the Roman armies standing in our way to Roma. 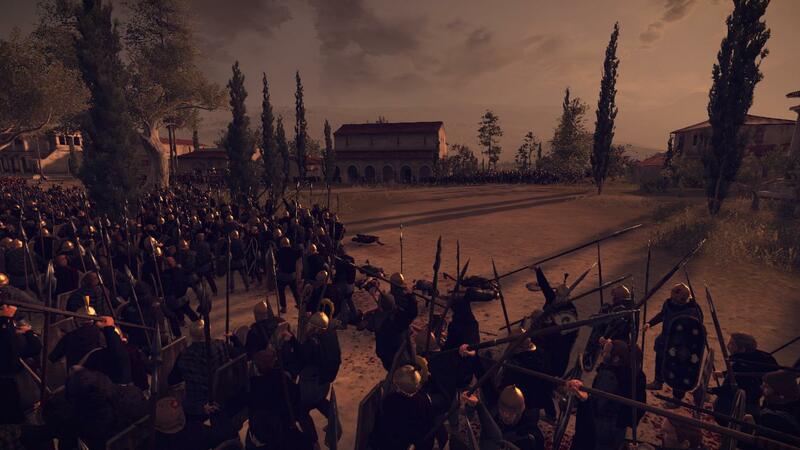 We can finally proceed with the Leuthard Plan and wreak vengeance for all of our dead who have fallen to Roman swords along this bloody path to the streets of gold. 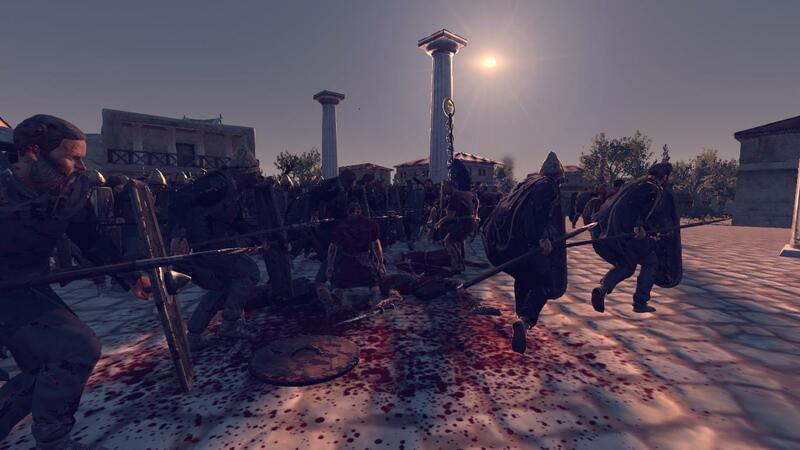 The Wolves of War, fresh from their victory over the last Roman army to oppose them, descended upon Ariminum with a blood thirst that could only be cured by spilling more Roman blood. They would certainly satiate that thirst in the coming battle. 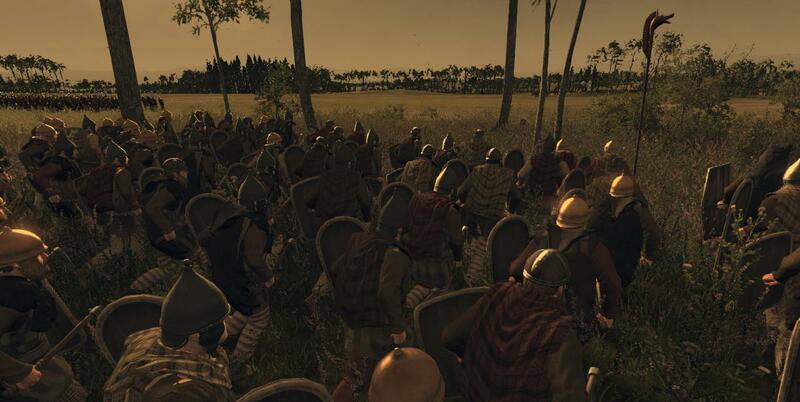 The majority of our men were deployed behind a hill, luring the Romans into a false sense of security, with a few of them posted in full view, hoping that the Roman garrison would be enticed out of the relative safety of their streets. They did not take the bait, and we ordered a full assault. It was a merciless slaughter. The Romans did not have a chance in Hel of survival. 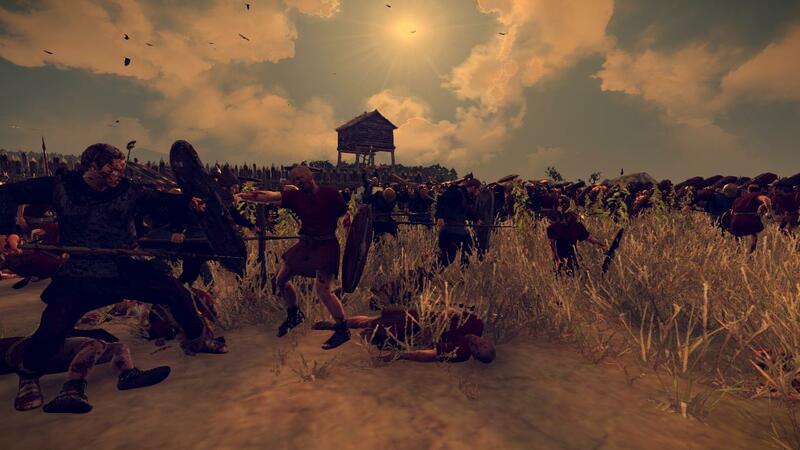 The Wolves of War chased down the fleeing Romans with a fury that I could only describe as fearsome. Everyone in that army had lost friends, and they were eager to avenge them that day. Then it was time to take Velathri. 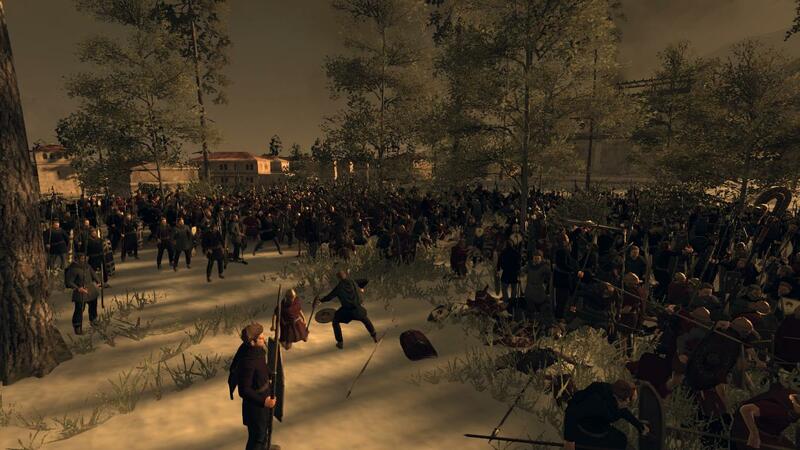 This was the first combat my men had seen since taking the town of Vesontio and after well over a year of stagnating in a city, some said that we had gotten soft. My men were eager to prove the naysayers wrong. We had built new ballistas, and I was keen to try them out before we took a crack at one of the largest cities in the world. 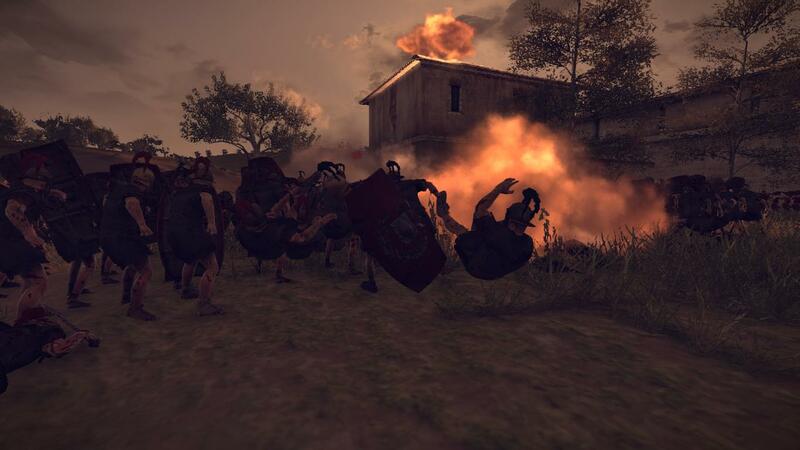 I will not lie to you; it was certainly enjoyable to see our explosive ammunition wreak mayhem among the tightly packed Roman units in the town. 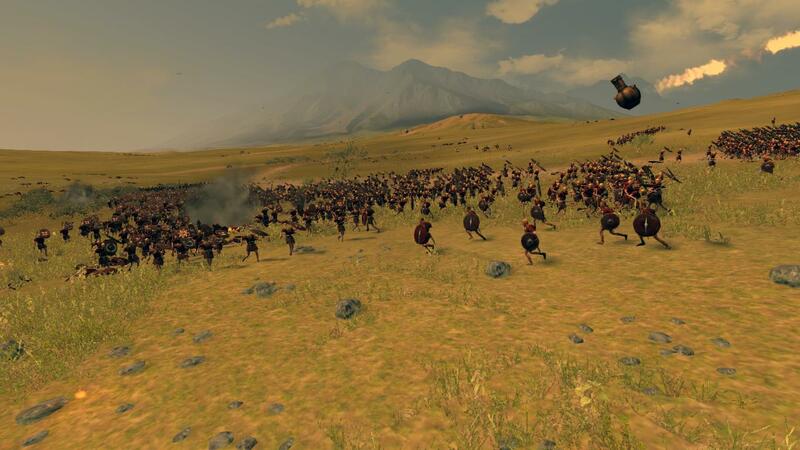 But eventually we ran out of ammunition and I sent in the men, who were frothing at the mouth to get their chance to kill some Romans. They got their wish. I rode in close to the melee so I could observe better, but I let the younger men do the fighting for now. Their bloodlust was greater than mine was, and I let them satiate their thirst before I would partake. 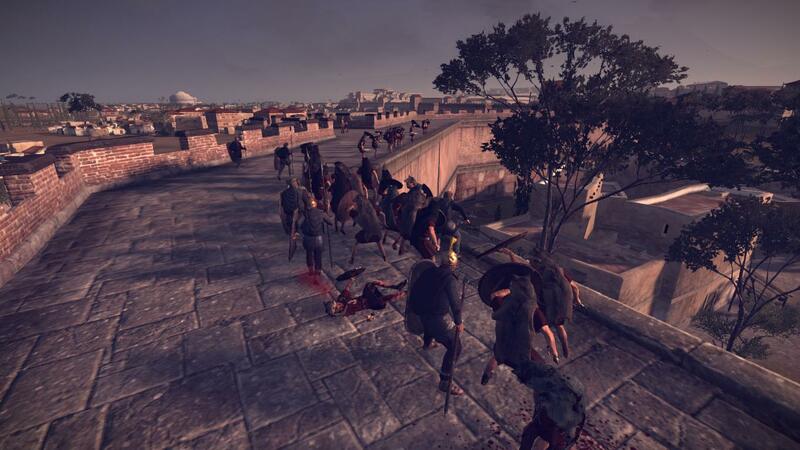 Even from where I was I could see it was a bloodbath. 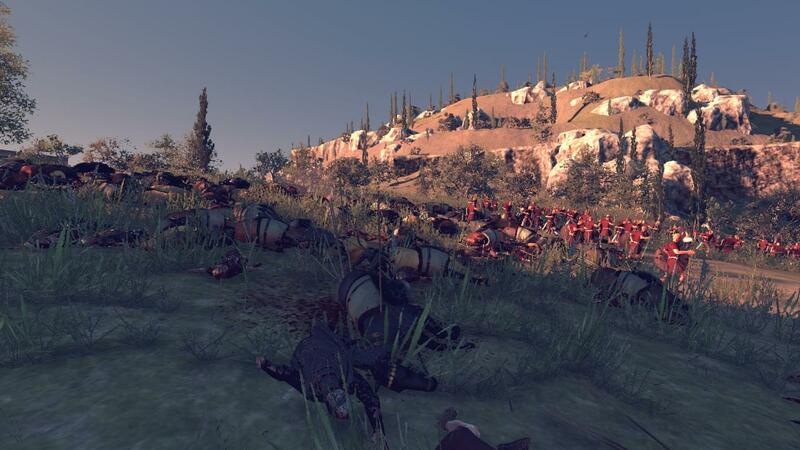 I could see that my men were dismembering Romans left and right. Blood had stopped being soaked into the dirt roads and turned it to mud under their feet. The remaining few Romans tried to flee but we did not let them. We hunted them down, whether they ran towards the surrounding hills or if they tried to hide in their houses. Those who resisted were slaughtered immediately without quarter. Those who fled were captured then hung on stakes around the town as a warning to the others. Was it brutal? Sure, but this is warfare. 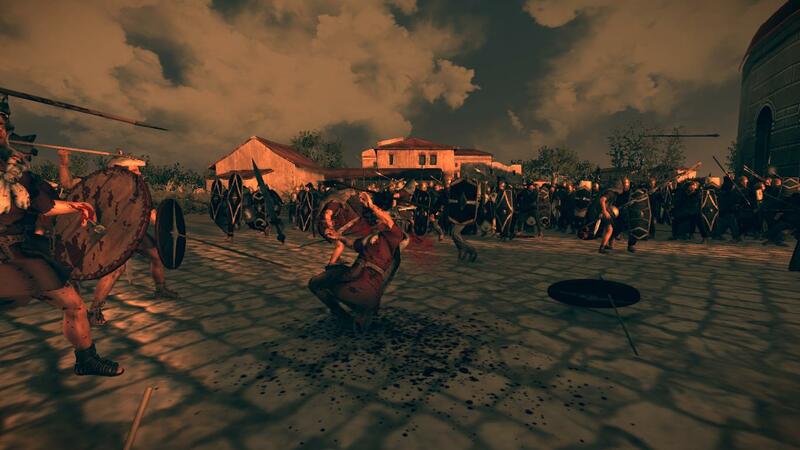 The inhabitants of friendly towns who had been visited by the Romans before the war told us that the Romans were just as brutal when dealing with “barbarian” locals. The Romans called us barbarians, but as they say in their own tongue, “Quisque est barbarus alio”- everyone is a barbarian to someone. Just as we were barbarians to them, they were just as barbaric to us. With the successful conquest of Velathri the first phase of my plan had been completed and we would soon move onto our final goal. 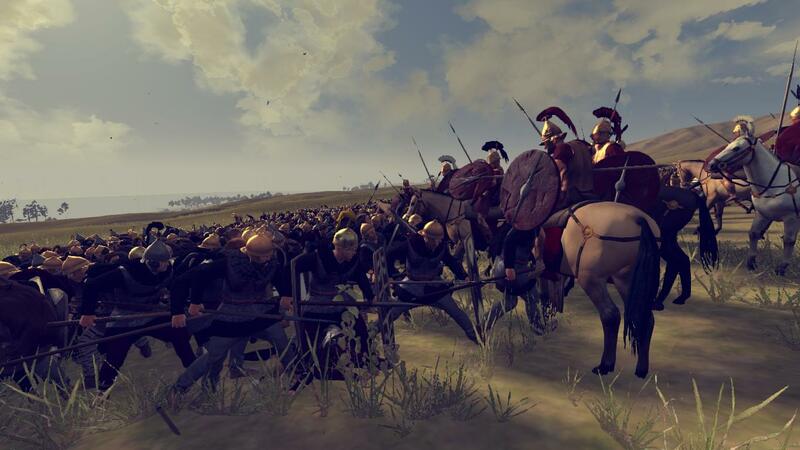 Meanwhile, near Akink, most the Ardiaei armies seem to have left. I, along with my commanders, am puzzled by this development. Maybe they see the coming defeat of the Romans and are deciding to pull back? I do not know; we do not know enough about them to see whether this was just a feint or them deciding a war with us was not in their best interests. Which it is not, for once we defeat the Romans, we are coming after them. As I rested in Velathri, surveying the carnage that covered the town and planning our next moves, I could hear the voice again. It had risen to a crescendo now, occupying most of my thoughts. The only time it was quiet was when I was leading my army in battle. 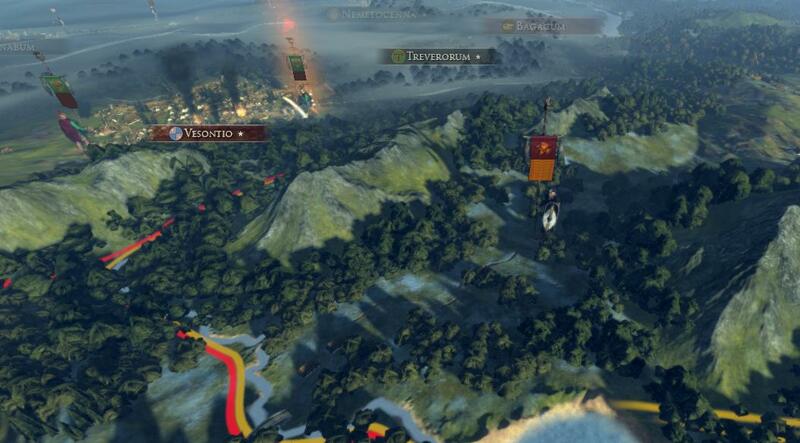 It was almost yelling at me to keep my momentum, march on Roma, kill those who opposed me. I have decided to give into the voice, to Wōdanaz. 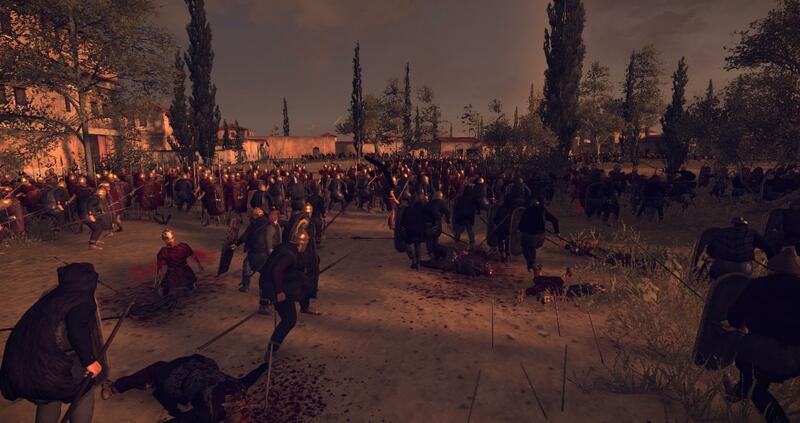 The path to Roma was already a bloody one, and I was about to make it bloodier. 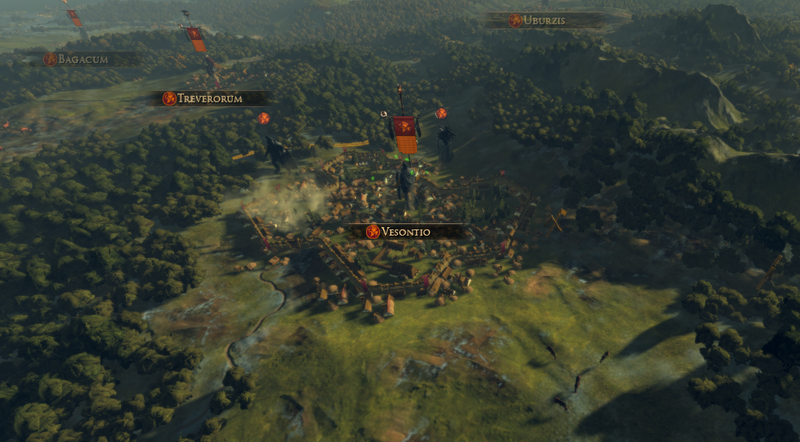 After I captured Velathri I decided it was best we moved quickly to take Roma. 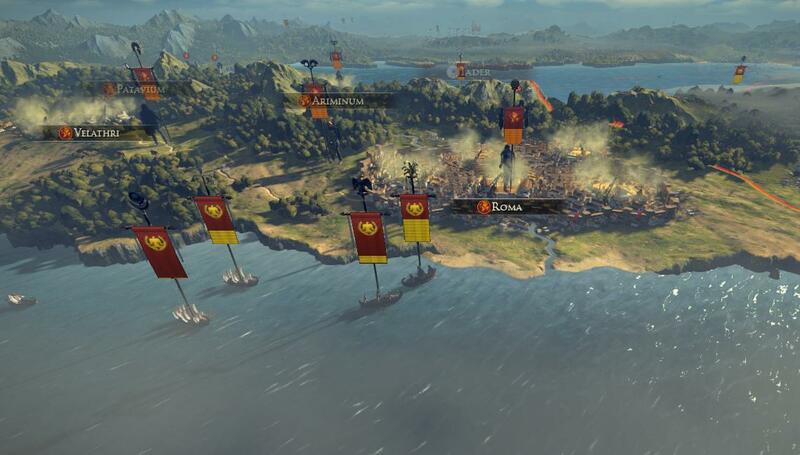 The Romans had a number of fleets at sea with enough soldiers to cause some problems for us so I wanted to take Roma before they were able to land and reinforce the garrison. 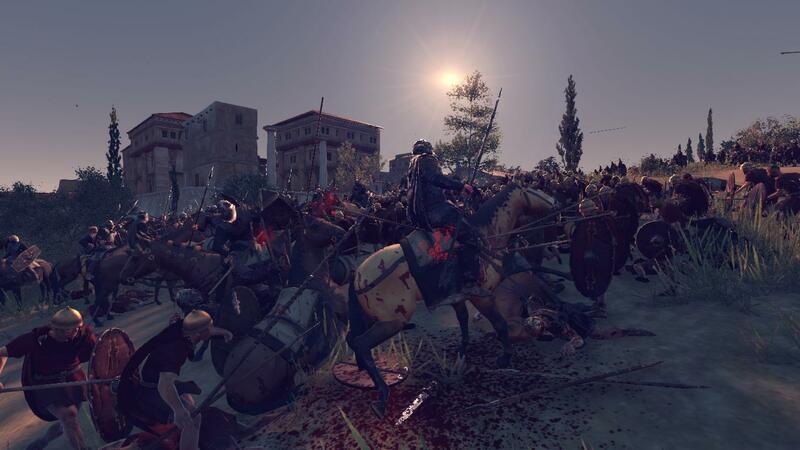 Because they might counter-attack with a substantial force, The Wolves of War and the Bloodsworn arrived to reinforce my army, and with our combined force we assaulted the city. 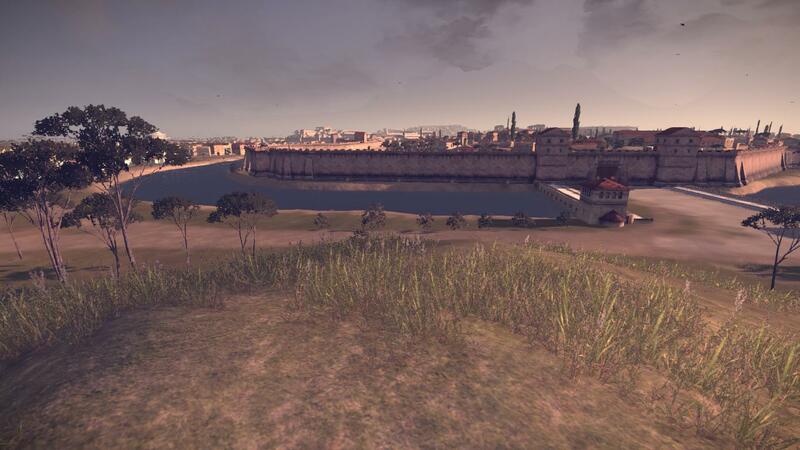 As I stood on the hill overlooking the city I could tell that it was a beautiful. It had a radiance to it like no other city which I have seen before. The marble buildings with their pillars shone in the early evening sun, even from afar. Maybe this city was really made out of gold and silver. I have never known stone to shine like that, only metals of the more valuable nature. And polished iron, I suppose. Regardless, I was determined to leave as much of Roma intact as I could. 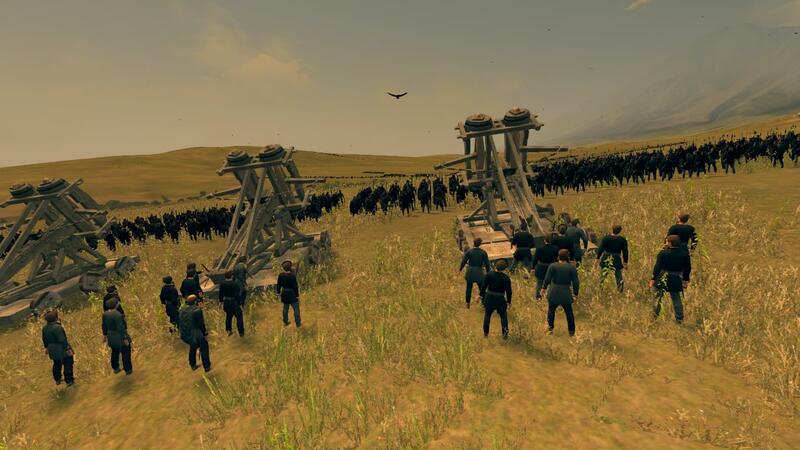 I set up the ballistas right next to a hill which concealed us from the formidable Roman defenses. 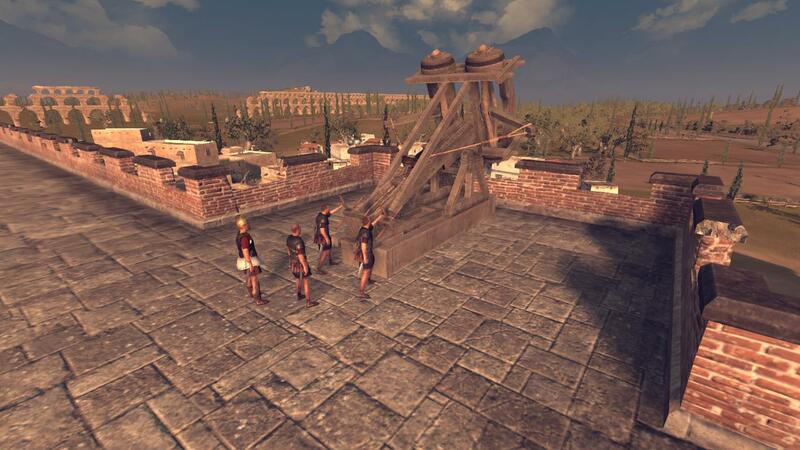 They had catapults and heavy ballistas all along the wall, which would have destroyed any attacking army. But they neglected to deploy them in one place: the southern gate, which is where we would use our ballistas to breach the walls. 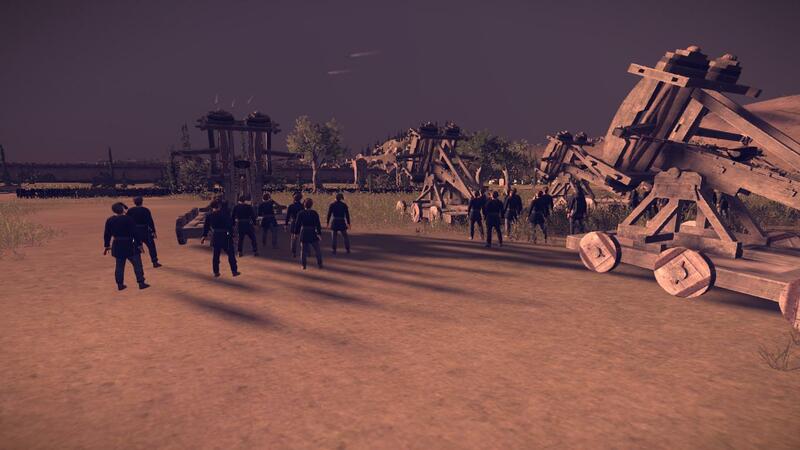 After a half-hour of bombardment, the southern gatehouse was destroyed and the gates were smashed open for us to storm. I gave the signal, and our men charged forward toward the gate, eager to take over one of the most famous cities in the world. 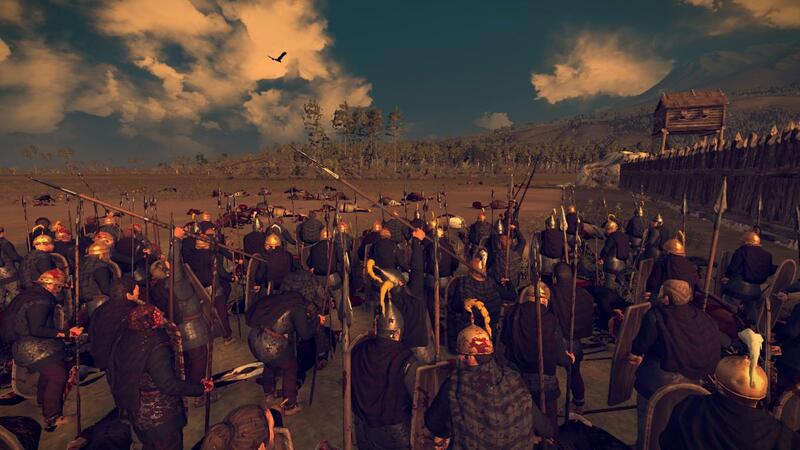 Roman skirmishers were on the walls, preparing to rain javelins upon us, while Roman “scorpions” shot heavy bolts into the massive horde of Suebi warrior that meant their doom. Those scorpions took a heavy toll on our men; almost nine hundred of our warriors fell to those heavy bolts during the battle. 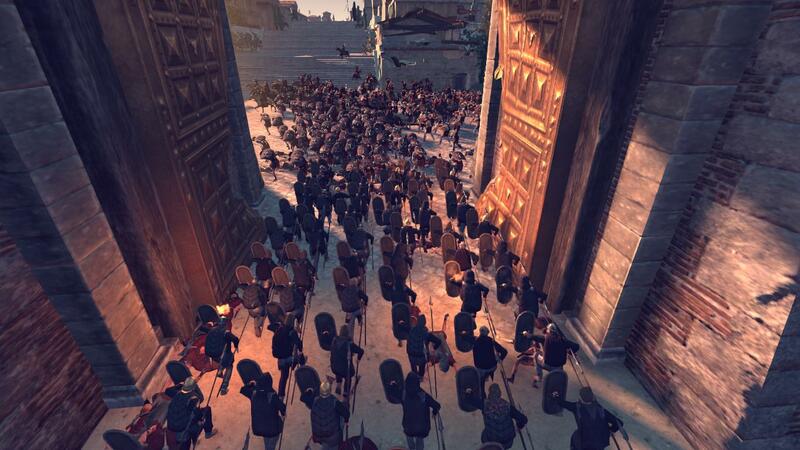 The sheer number of our warriors storming the gate shattered the first of the Roman units that were guarding the gate. 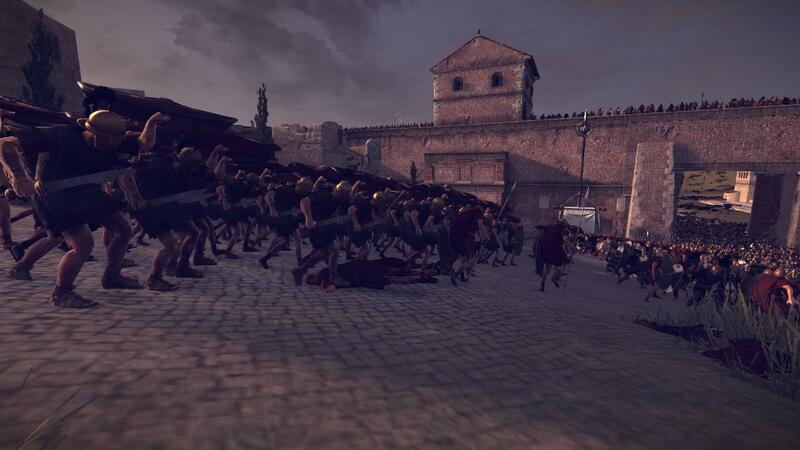 But the Roman garrison rallied and charged our men as we were forming up to take the rest of the city. But they were simply city watchmen, feeble twigs compared to our experienced warriors. They fell quickly to our swords and spears. 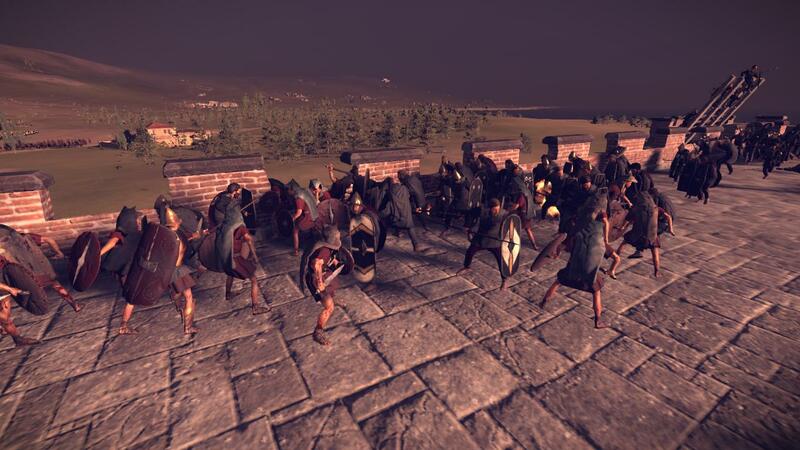 Finally the more experienced Roman soldiers arrived, forming a roof with their shields to protect them from our javelins. But that didn’t help, and we cut them down just like we did the rest. 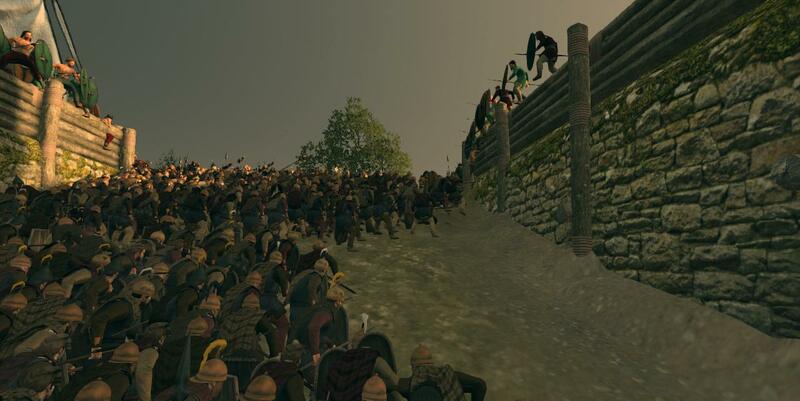 While most of our men were chasing down the remainder of the garrison in the streets, I sent men to the walls to slaughter the Roman skirmishers who were harassing us. The city had fallen; it belonged to us now. I, on my white horse Sleipnir, (named after Wōdanaz’s horse) trotted through the streets in triumph, along with my staff. As I rode Sleipnir through the city, I took in the sights of the (former) capital of one of the (formerly) most powerful nations in the world. It was a beautiful city— from afar, that is. Looks are deceiving. Up close, it was rather bland. Our cities were much more pleasant than this. The streets were far from being paved with gold and silver. The streets were paved with small rocks, not the gold that my dreams said they would be. 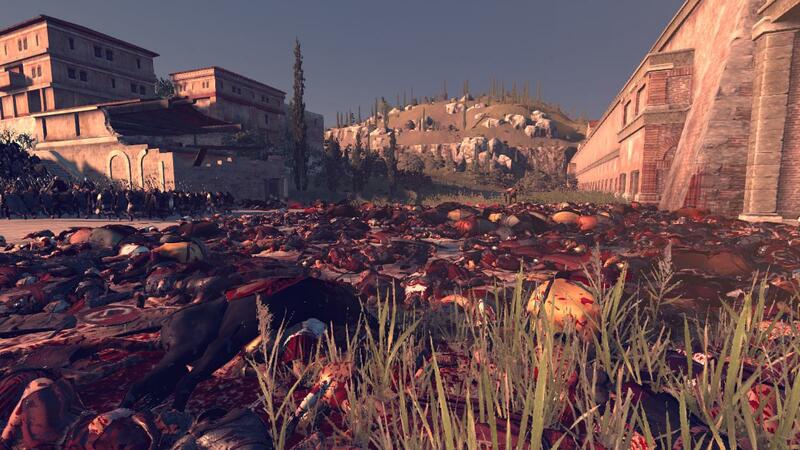 Aside from the smell of blood, which radiated from the general direction of the southern gate, I could smell the stench of feces and garbage in the less-wealthy areas of the city. Parts of the Roma were run-down and in disrepair, evident of a government that was strained for money from our war with them. Nothing was shining with gold, silver, or even bronze. Except the homes of the Roman elite, that is. They, along with the government buildings, were shining in the setting sunlight from the brilliant white marble they were made of. But this was far from being made of gold and silver. This was not what I had dreamed of. The dreams lied to me. The stories lied to me. I had lied to myself. I walked through the governor’s palace and the other government buildings. There was gold and silver there, but not much. Most of it had seemingly been removed before we arrived, taken by fleeing wealthy Romans who could afford to escape the city before we laid siege to it. Anger, the likes of which I had never experienced before, rose in me. The voice, which had stayed silent from the time we laid siege to the city, spoke to me again, telling me what I must do. My men cheered, and Roma burned. As I watched the fires from our encampment, the voice in my head was silent, though I was still livid. So many lives of my countrymen have been lost for this, and for what? A city of garbage and corruption? Until this moment I did not hate the Romans; in fact I respected them for their many achievements. But not anymore. Hate consumes me now. 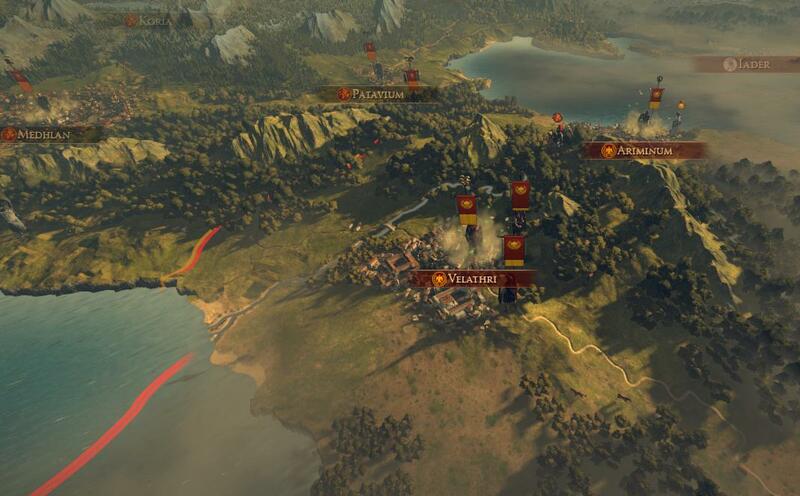 I will spend the rest of my life on this world removing what is left of the Romans! 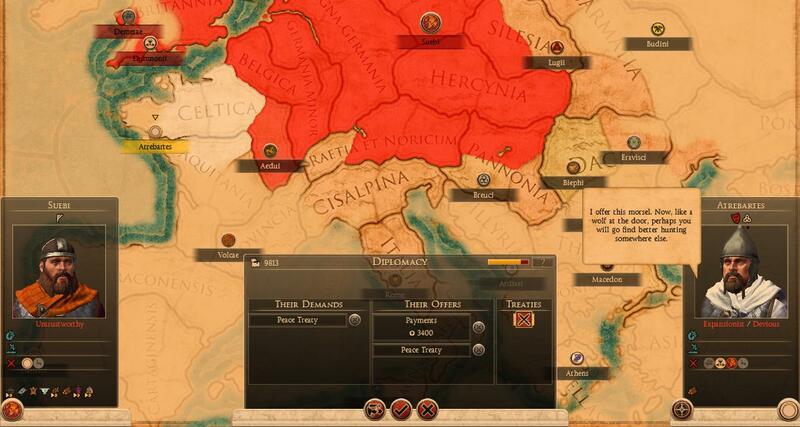 There can be no peace, no peace with Romans, men of stone, and iron, and lies! There can be only war! Roma burned through the night. It burned all the next day, and far into the following night as well. I could hear the screams of the people of the city as we pillaged and burned the city that they loved so much. I didn't care. In fact, I loved hearing them scream for their worthless lives. But even as Roma burned, I was drawing plans for a new Roma. It would stand testament to our achievements and how far we have come as a people. It would stand long after I am dead and have gone to Walhalla, and long after my people are gone as well. My captains and chief builders asked me what to do with the ruins of the city. Were we going to clear them out to build the new city or start anew in a different location? And it did. Looking at the smoldering ruins of a once great city gave me an inexplicable calm that nothing else has given to me since I began this journey all those years ago. But I cannot stay here forever, there is a war to fight! 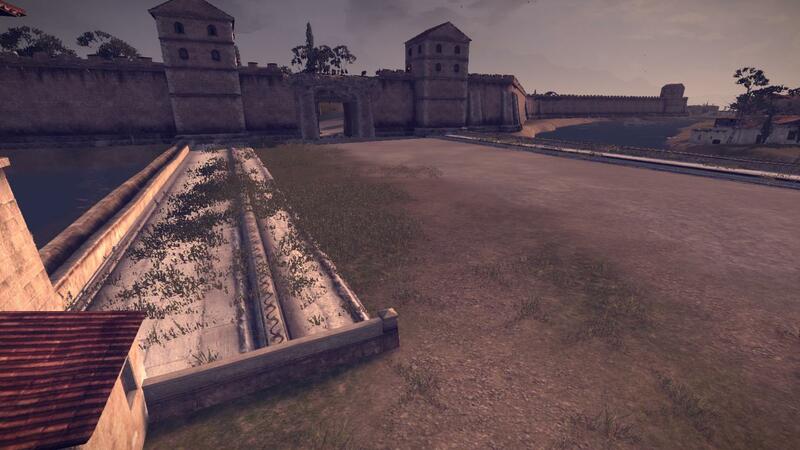 Our scouts around Akink reported that the Ardiaei had left the area completely, besides a few of their agents. It seemed as if Akink, for the time being, was safe, which allows us to focus our energy completely on the Romans. 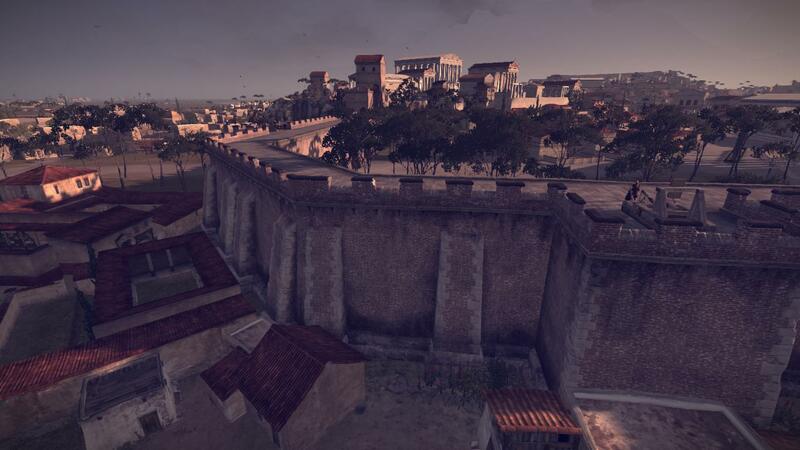 While I was sending final orders to the defending garrison at Akink, I received word that a foreign fleet had blockaded the new Roman capital, Neapolis. Who these people were we did not know, but they did not look Germanic, Gallic, or even Roman or Greek. These people were from a place we did not know of, but whatever it was, they were enemies of Rome, and that was good enough for us. 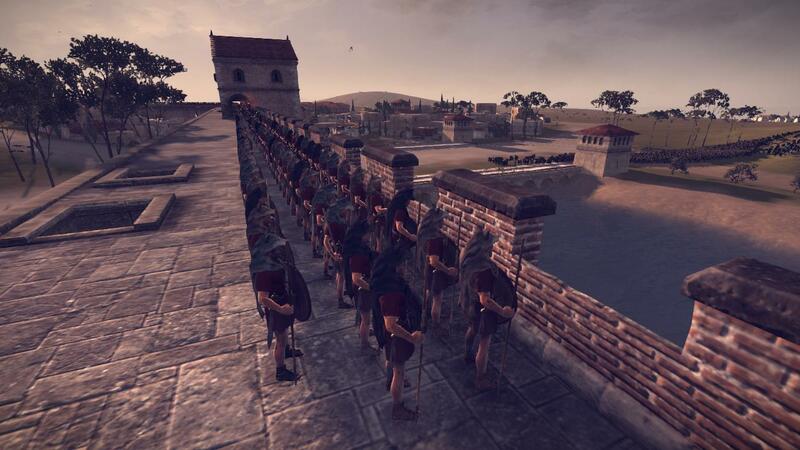 Our scouts also reported that new Roman armies were being formed at the southern cities in Italia. 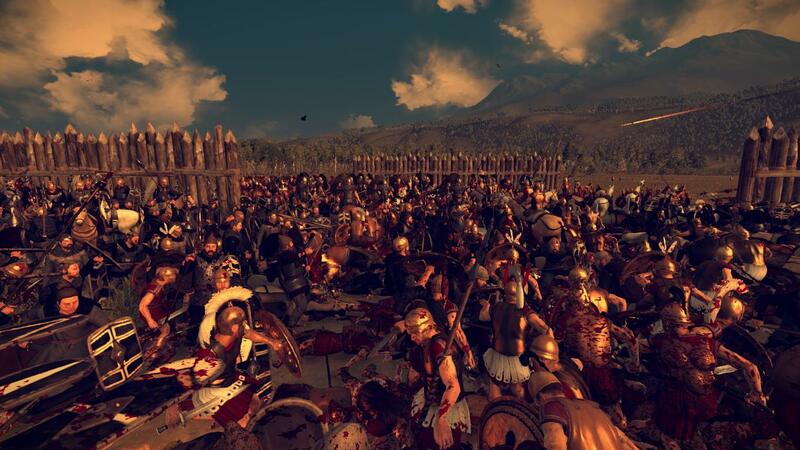 I froth at the mouth thinking that there will be new chances to slaughter some more Romans! 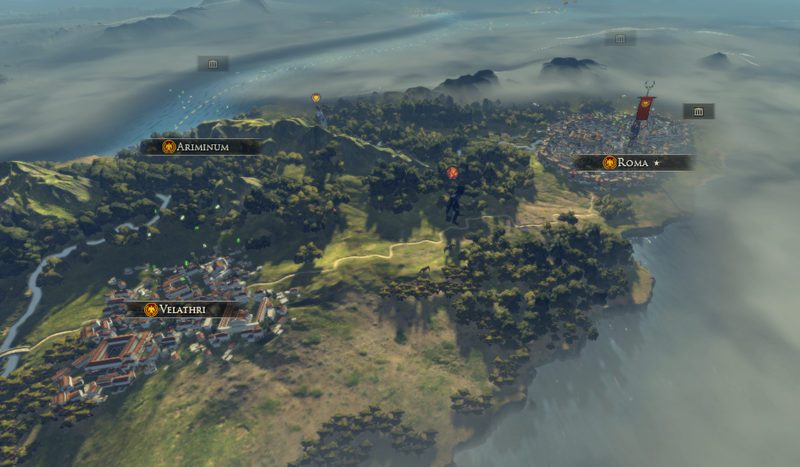 But for some reason the foreign fleet fled, and I seized this chance to take the next Roman capital. 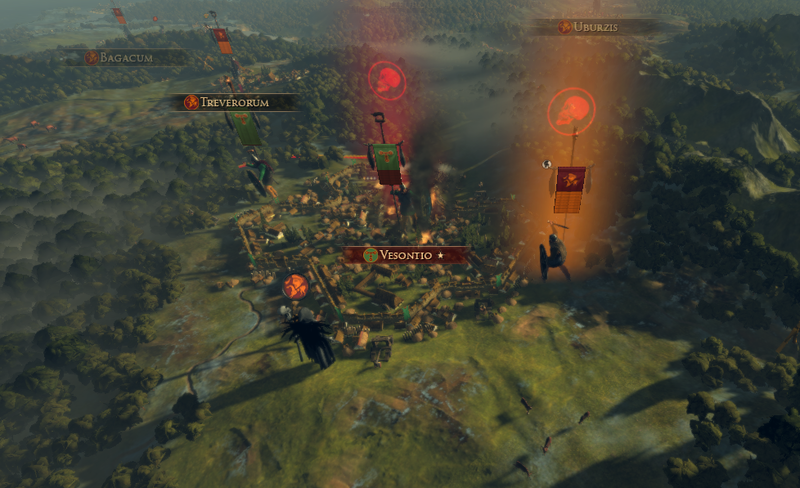 Because I had some loose ends to tie up in the new Roma, I sent the Wolves of War to take the town. 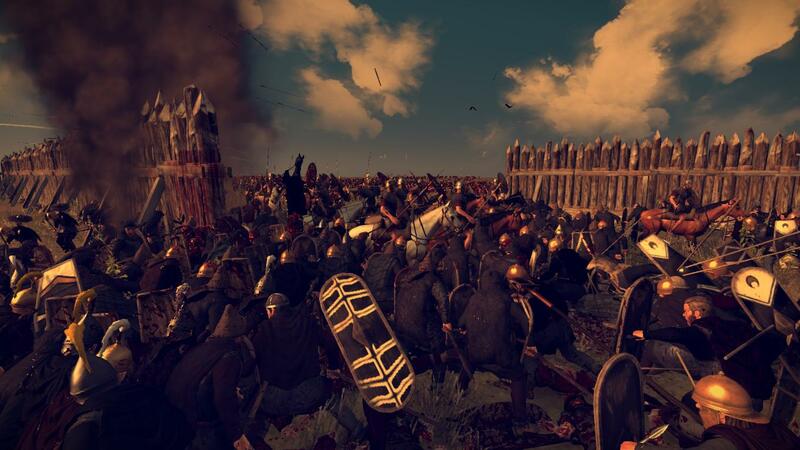 The Roman defenders knew what we do with Romans who resist too much, so after a few javelins the front line for the Roman defenses began to flee. 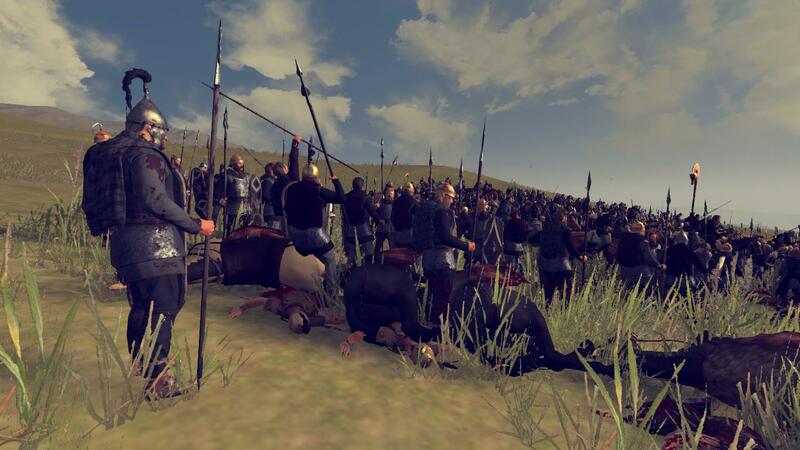 But not before our spearmen were able to skewer a number of Romans on the tip of their spears! 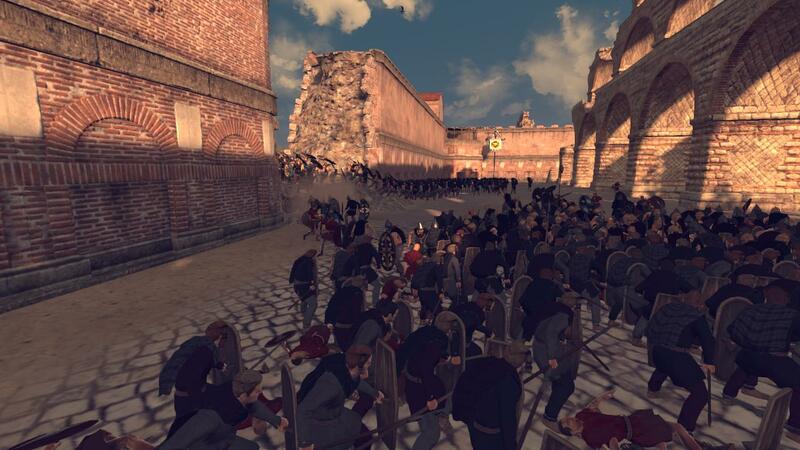 Then the main body of the Roman defenses attacked. 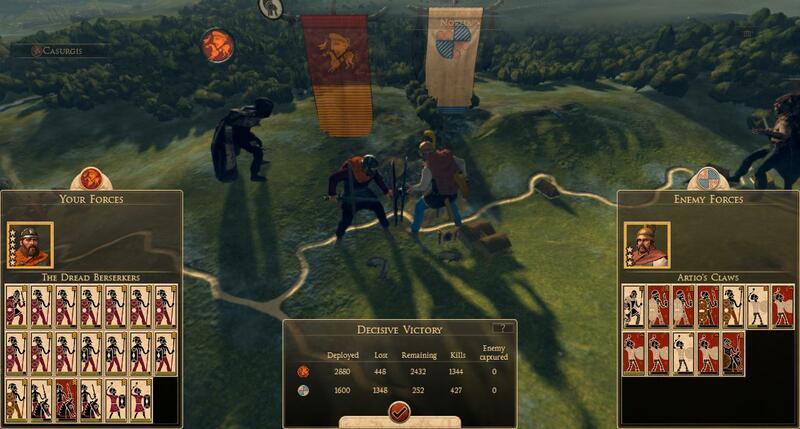 They put up a decent fight for our warriors, but in the end our strength and numbers were too much for them. On the other side of the town, a few of the units we had sent to flank the enemy finally made contact with the enemy. 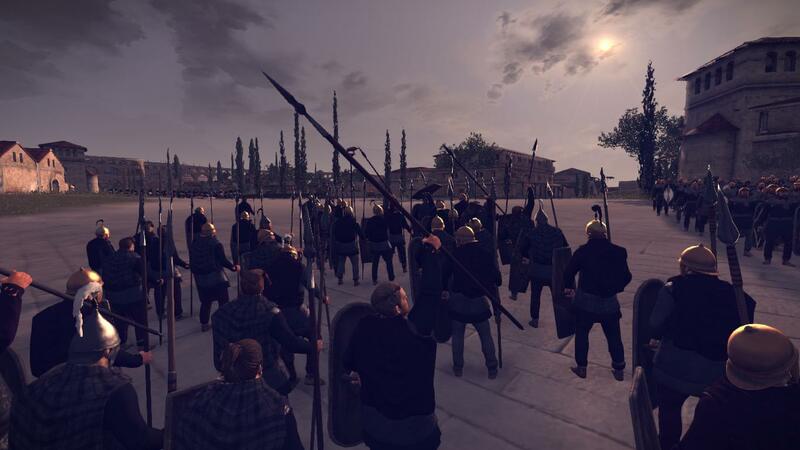 The fighting progressed to the center of the town, where the remnants of the Roman garrison put up a good fight trying to keep their town from falling into our hands. I could hear the death knell of the Roman nation coming. Their destruction could not be far off. It was only a matter of time before they would become a footnote in history, and we would be the ones to usher them to that destiny. As I sat in my tent, overseeing the construction of the new Roma while drinking some liberated Roman wine, I heard the voice again. What could that mean? I have aged sixty-six winters, but I was by no means too old to fight, and this war with the Romans was coming to a close. 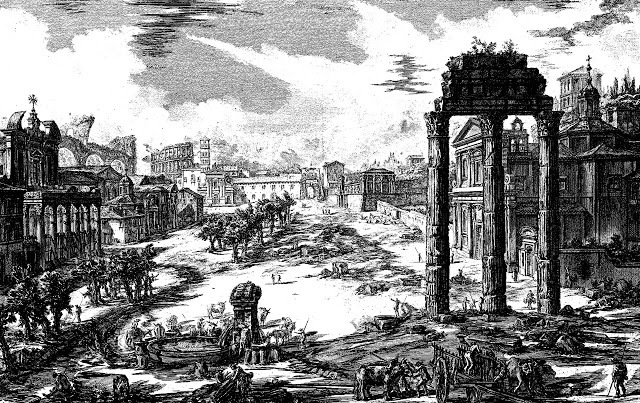 There were only a few Roman settlements left, and they could not last long before they would fall. Was my death coming? I did not know, and I chose to forget about this voice. I tried to keep ignoring it, but every time it would come back, a bit louder than before. What did it mean? Did Wōdanaz want me? Was it time for me to join the ranks of the Einherjar, who lived and fought in the halls of Walhalla? 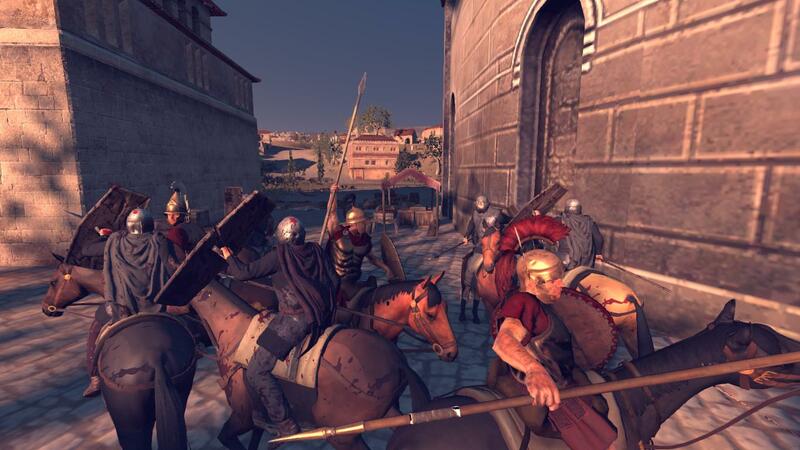 Scouts revealed that a very large Roman army was in the Roman city of Brundisium. It was calling me. I knew that taking this city was my destiny, for better or for worse. I would find my ultimate calling here, whether that is victory, or the Valkyries carrying me away. I girded my men in only the best of armor, including metal facemasks for some of them, which would frighten the enemy as we would bear down on them. Our ballistas smashed their gates, just as they did with the gates of Roma. 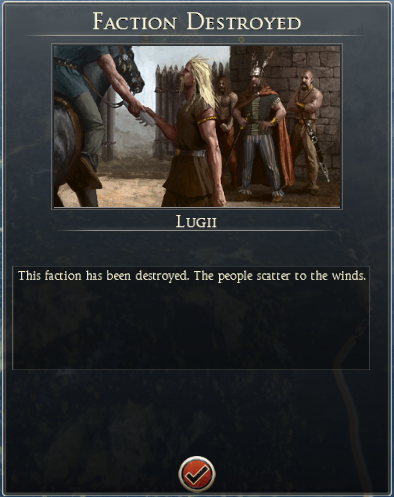 I had hired some Northern Italian Mercenaries, who wanted to fight the Romans, who had enslaved their homeland so many years ago. They were eager to fight, so I let them scale the walls first. It was a dark day, with clouds making it appear that the city was full of smoke. A most peculiar effect, especially since the sun shone through the clouds, like a lighthouse’s beacon through a heavy fog, guiding ships away from the rocks and towards safe waters. Our artillery smashed the enemy towers while the Italian mercenaries scaled the walls. 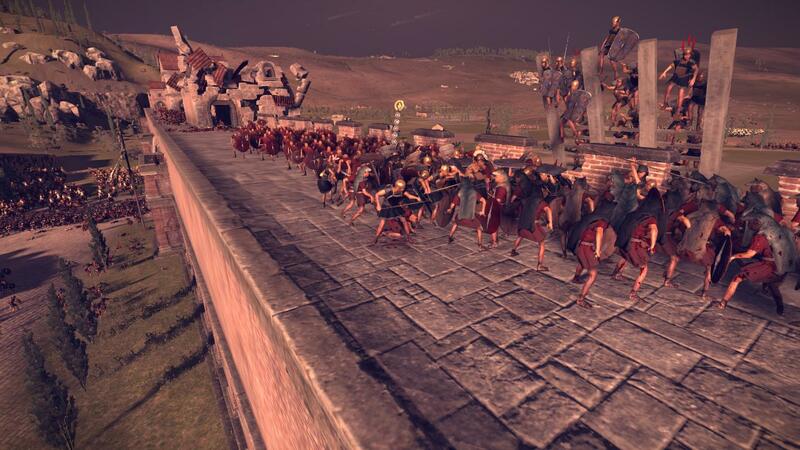 A unit of our Spear Brothers also scaled the walls, and began to fight the Romans on the walls. The gates were smashed open, and I sent a unit of Spear Masters to go in first, who would be followed by the rest of us. Then it came again, stronger than ever. I had to go. I spoke to my bodyguards, seventy-nine in total, just as the sky began to clear up. “Men! Today we ride! We do not stand back and let others do our fighting, not then, not now, and not tomorrow! We are the leaders of our people, the best fighters and the best riders! Today is the day that we prove it, and I, your kunungaz, will lead you to that proving! So we charged into the fray. It was like nothing I have ever experienced before. 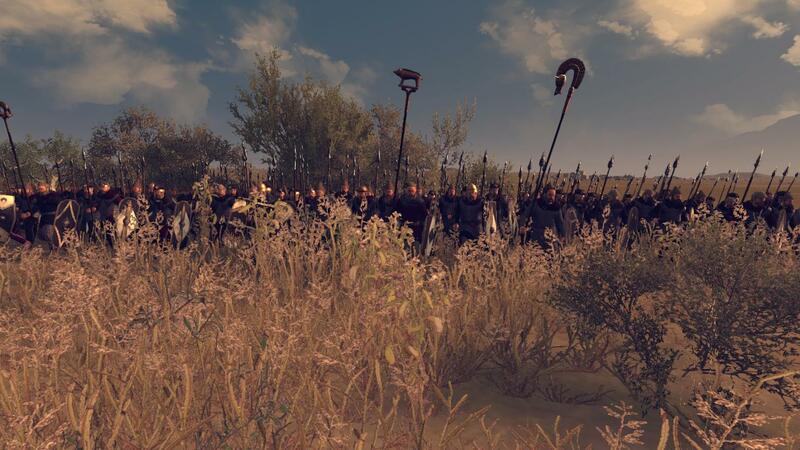 A thousand spears and swords, all stabbing and swinging at one another in an effort to kill the other before one is killed themselves. 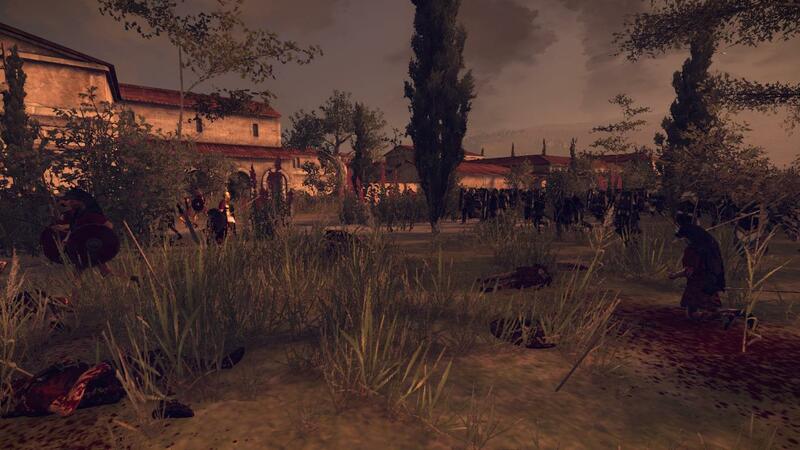 I parried a spear that lunged towards me, while stabbing the neck of the Roman who just tried to kill me. 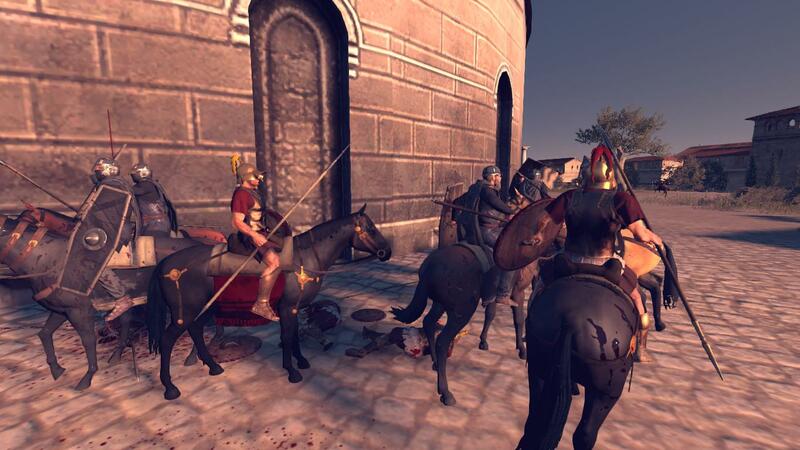 My bodyguards tried their best to protect me from the Romans but in my heart I did not want them too. Even as I was fighting I could hear the voice calling to me. Someone’s spear grazed my thigh, cutting deep. I grimaced, but I ignored it. Lesser men have fought through worse pain; I would not let it stop me. 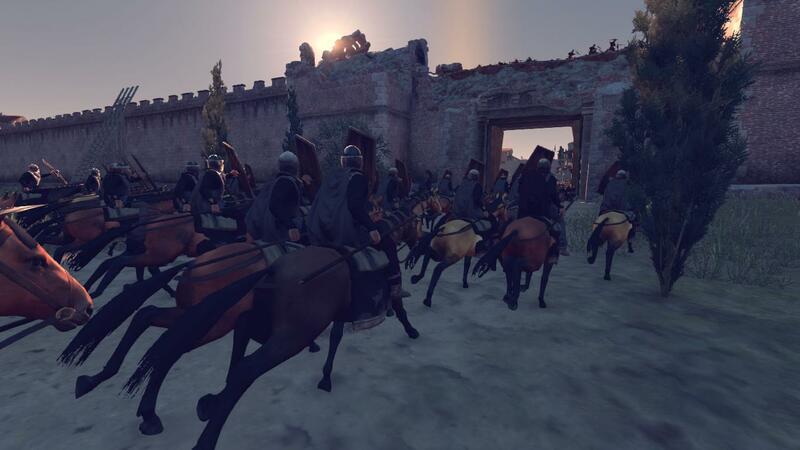 The other Noble Riders, seeing the charge by their Kunungaz, soon joined in to help. As did the rest of the infantry. 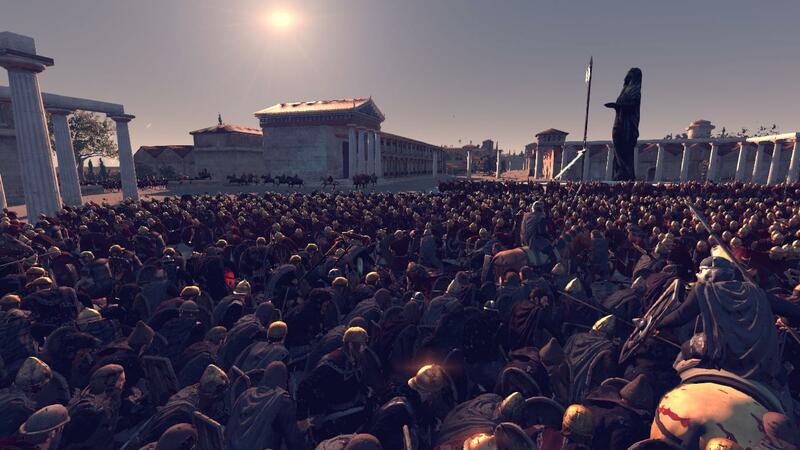 We slowly pushed into the crowd of Romans desperately trying to keep us out. As more of our men came in, the safer that I felt, but that did not stop the Romans from trying to kill me, for they soon had recognized me for the person who I was: the Kunungaz of the Suebi. 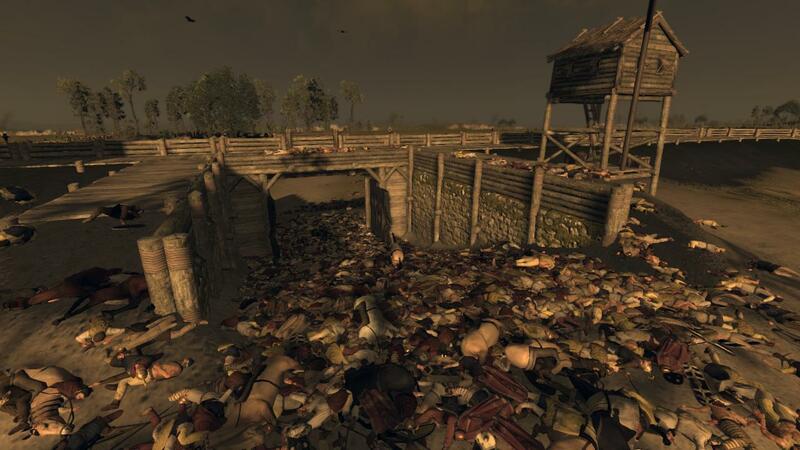 By the time we had finally cleared the main gate, my shield was in tatters from blocking so many sword and spears that I had to take one off of one of my dead bodyguards. My horse, Sleipnir, was slain under me, and I had to find an ownerless horse to ride. I would mourn the loss of my horse later; there was still a battle to fight. With the main group of Romans dead or fleeing towards the city center, we had a moment to breathe. I ripped some cloth off my pants and wrapped it around my thigh to stop the bleeding, while I tried to get my men in order. I had lost thirty-seven bodyguards. Alban asked me if we were going to lead the charge again for the center of the city. I inquired about what happened with the mercenaries. 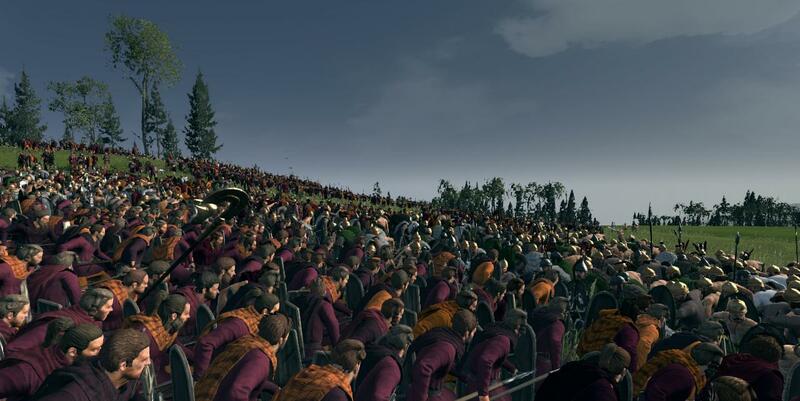 Alban told me that they were almost all completely wiped out, many of them fighting to the death against endless waves of Romans. 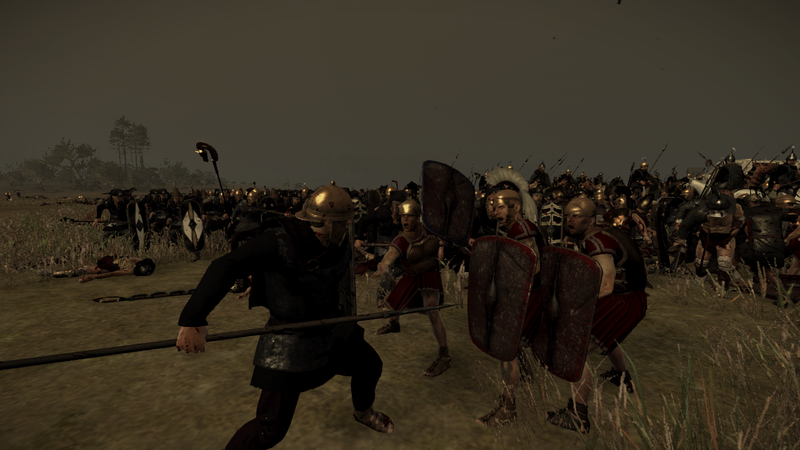 At that time I noticed a large group of Romans gathering to our left, so I sent a few units of Spear Brothers to take care of them. As our men moved away from the front gate, it revealed the slaughter that had taken place. 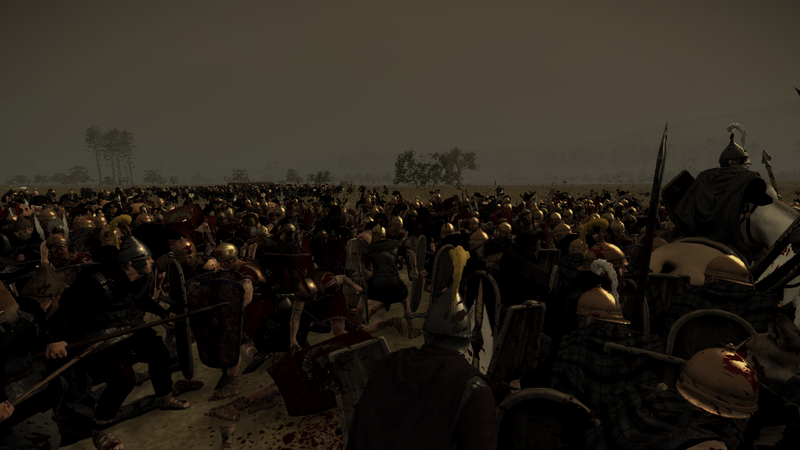 I then noticed a large number of Romans moving to our right. I ordered one of my units of Noble Riders to intercept. 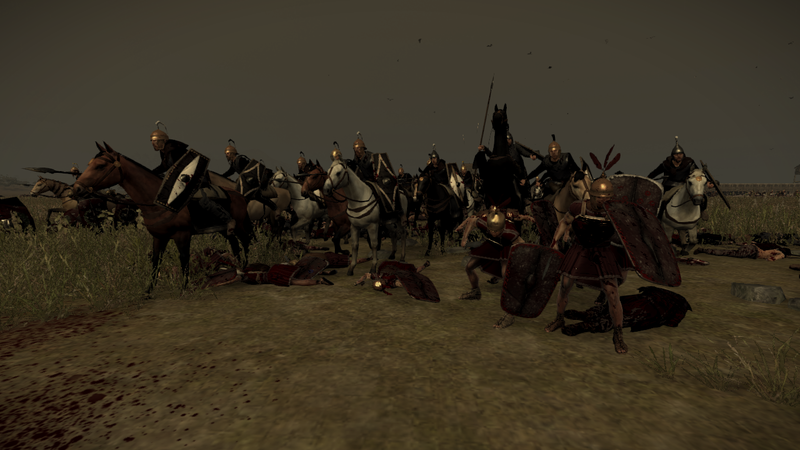 I thought that our heavy cavalry would easily clean up whatever Romans were there, but to my surprise, they were completely wiped out. 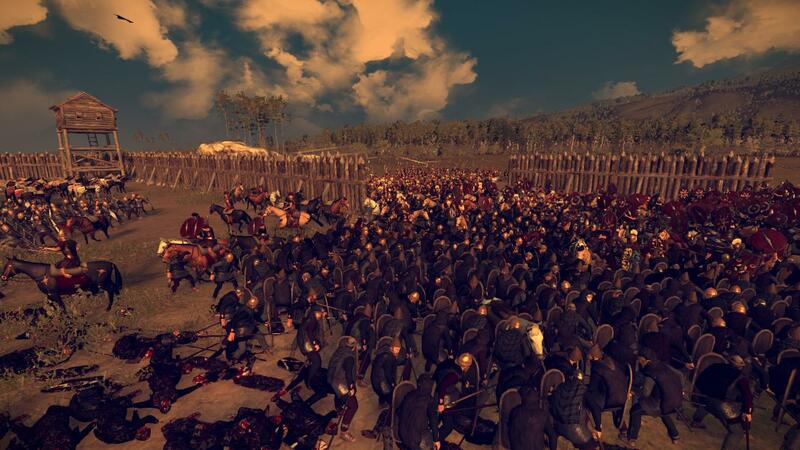 The sheer number of Roman infantry was just too much for our Noble Riders. 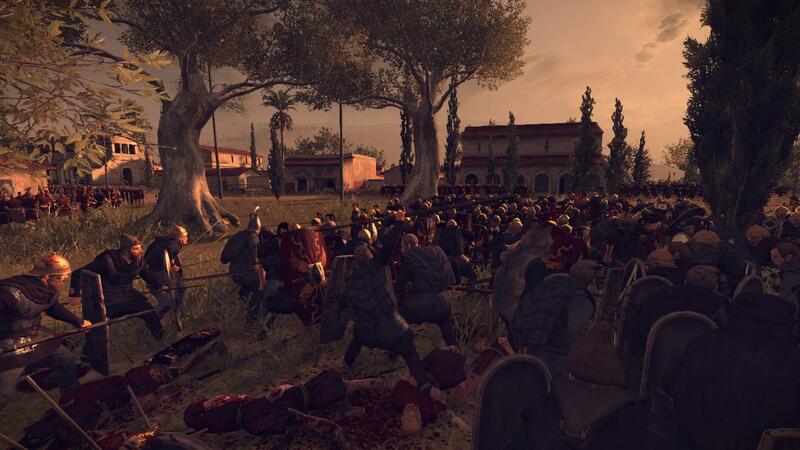 Our main force hit the Roman legionnaires at the center of the town, resulting in a huge melee in which neither side gave an inch. Our men on the left flank finally broke the Romans they were fighting, and I sent them to flank the main melee in the center. 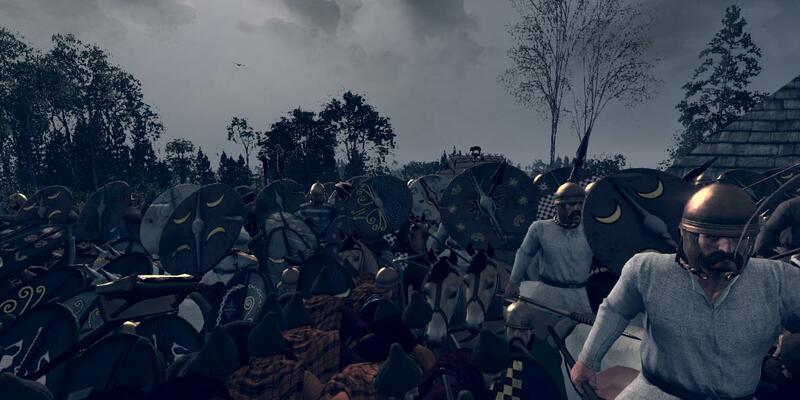 The Romans were now surrounded by two unstoppable walls, and they soon were crushed between our Suebi warriors. 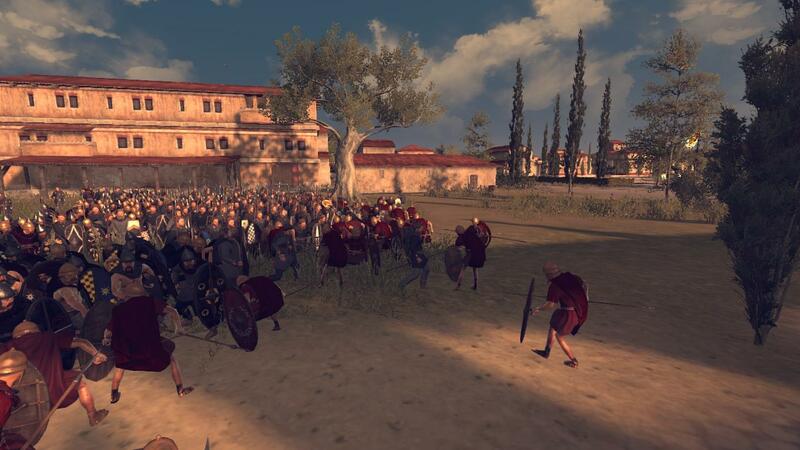 With the main battle completed, our men fanned out to hunt whoever was left of the Roman garrison. 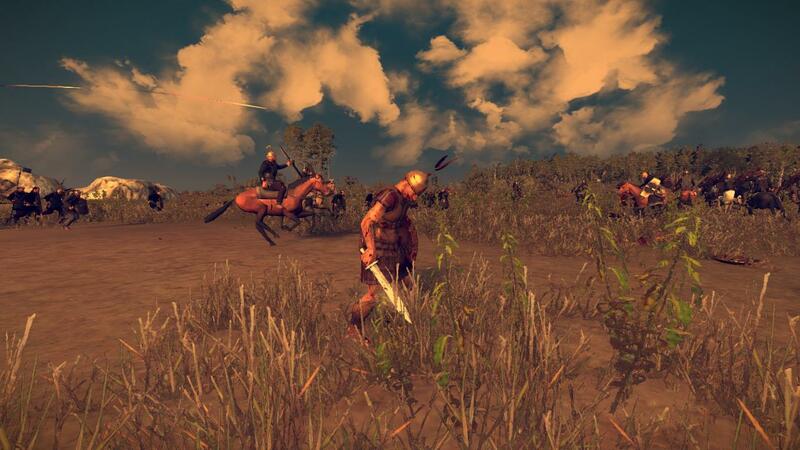 I took my bodyguards and began to hunt for the Roman general. I found them behind a building, trying to slip away. We did not let them. The enemy general was slain by one of my men, leaving only three of his bodyguards left. I faced off against one of them, confident that my bodyguards would kill the other two. But they didn’t, and I found myself surrounded by Romans. Then I felt it. 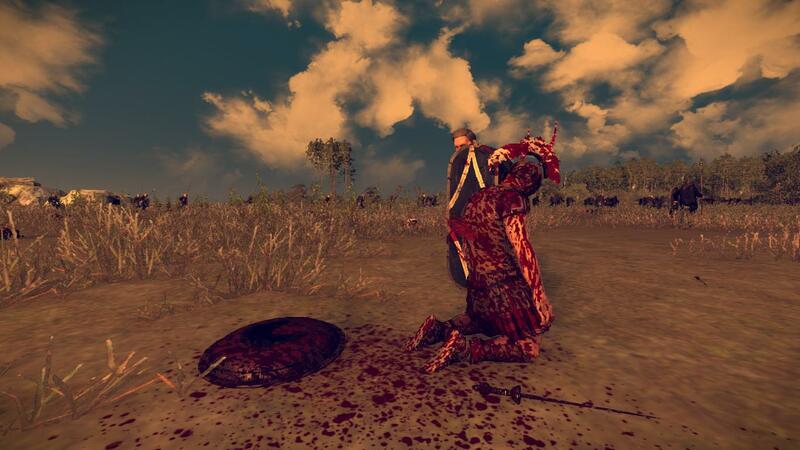 The spear in my side, piercing through the unprotected side of my armor, the screaming pain surging through my body as I fell off my horse, unable to move. 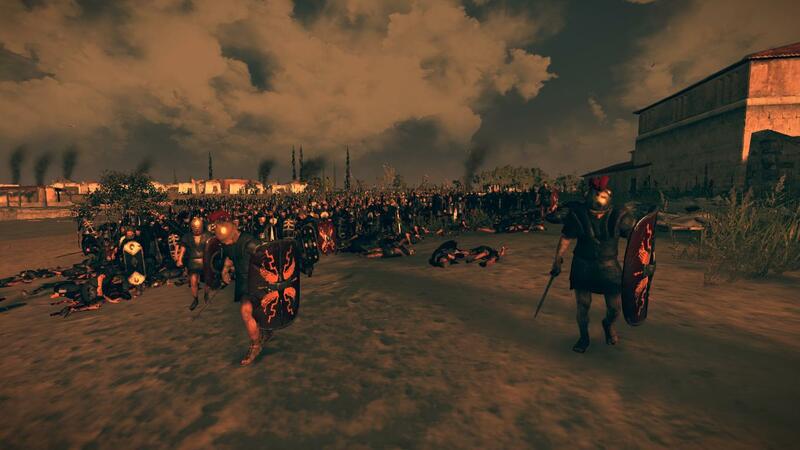 My men quickly slew the remaining three Romans and carried me off the battlefield as I writhed in pain. When word spread about what happened among the ranks, nobody was celebrating this victory anymore. I was laid on the bed in my tent, the doctors doing what they could to save me, but I knew that it was for naught. All they could do was stall what was inevitably coming. Everything was fading. I could hear everyone talking in worried voices but I could not see. I had lost a lot of blood. They knew I was dying. I knew I was dying. I wish my wife, Milja, was with me, and my son, Sebjorn. Both were still in Lupfurdum. It would be a while before they would hear of my death. I wish they could be here to mourn me. 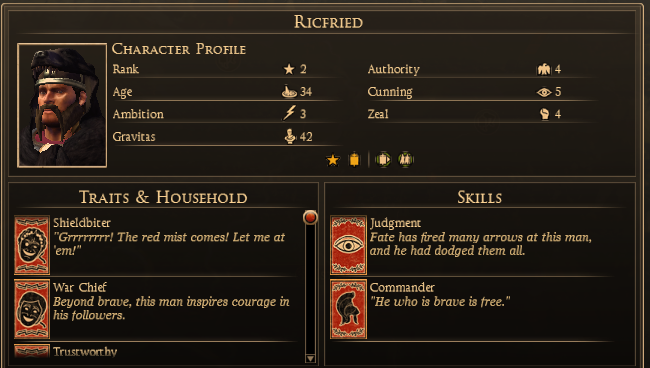 I told my captains that Ricfried would be the next ruler until my son came of age. I trust Ricfried, he has been a loyal subject and friend my entire life and I expect that he will be an excellent teacher for my son. Alban asked me if I had any final wishes. I made Alban swear that he would make my successor swear to crush the Romans wherever we could find them. We had taken their last major city in Italia and now they were on the run. But I didn’t care anymore. Ricfried would have to care about that now. I was free of that burden. I had taken Roma in my lifetime; I have seen its streets and the buildings. I have accomplished that lifelong dream of mine. It did not pan out how I imagined it would be, but I had the immense pleasure of watching Roma burn into the night, and that is just as good in my eyes. If I die now, I die content. I have led a good life, a life of service to my beloved Suebia and her people. I die with no regrets. I had conquered great swaths of land. I had become Kunungaz with only a single city under my control. Now I had brought my people to greatness, from the Northern Sea all the way to the bottom of Italia. I had faced off against great tribes and nations. They were now dust in history, while we will be lauded in songs for generations to come. I cannot hear the voices of my men anymore. Everything is dark. I feel two sets of hands on me. They feel like the hands of a woman. They begin to lift me. Could it be? Had the Valkyries chosen me to march alongside the Einherjar in Walhalla? I could feel the darkness parting, as I heard the voice calmly and firmly announce my fate. 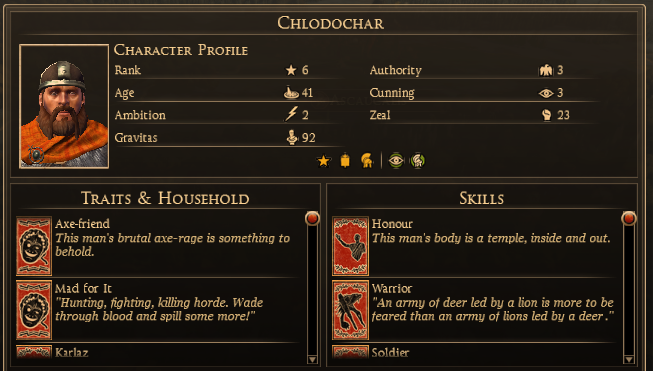 Welcome, Chlodochar, son of Valbrandr. Welcome to Walhalla. Welcome home. It has been a huge pleasure to do this AAR, which, I might add, is the first one I have ever officially finished. 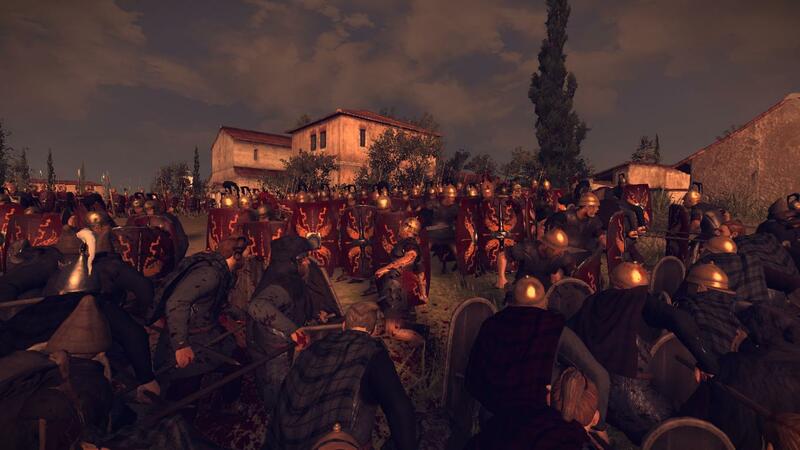 Now I, along with a few others, will begin serious work on a complete Rome II guide in the likes of the Frogbeastegg guides of years past, which I hope will be completed before Christmas. So from the bottom of my heart, thank you all so much for reading! 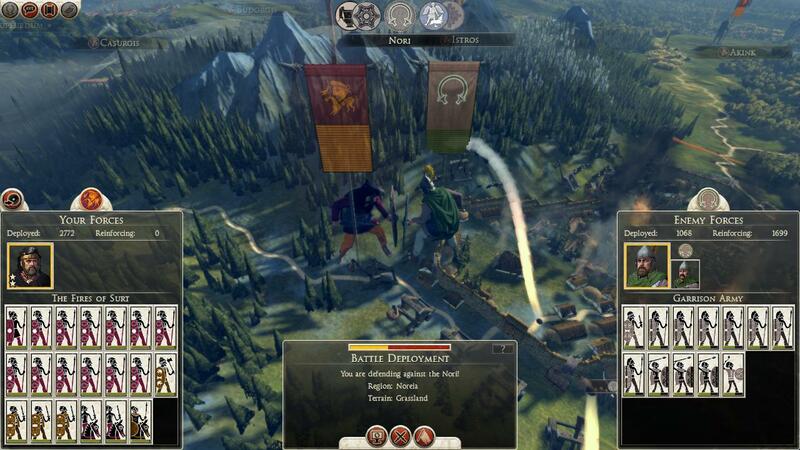 The berserkers are quite huge, makes even cavalry look puny! Oh yeah, should have mentioned the mods and difficulty settings: Im playing on H/H, and Im using the Radious mods, the 4 turn per year mod, the extended zoom mod, and the yarkis battle mod. Extended zoom is a must imo, if I can't zoom out in an strategy game with good graphics I feel claustrophobic and need breaks every few minutes. I use debug cam for battle map to ease up my eyes. 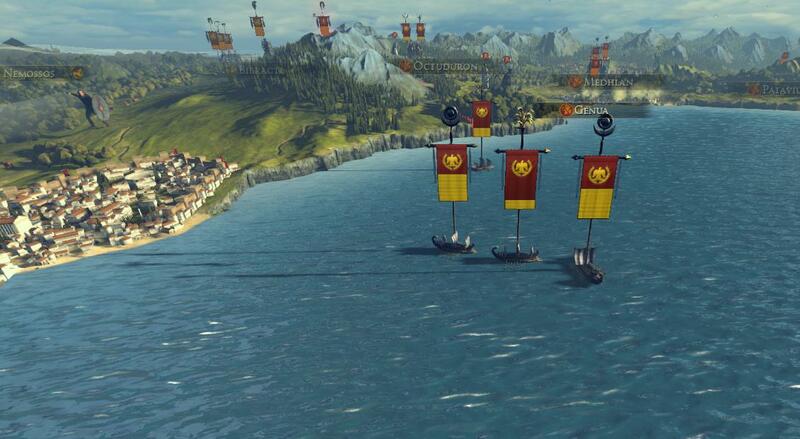 Seems like Radious is churning out mods, his Shogun 2 ones seem quite polished and challenging. If the mods have 4tpy then it's wise to make teching slower or else you get Marian's even earlier. I never really understood the appeal of having more turns per year. 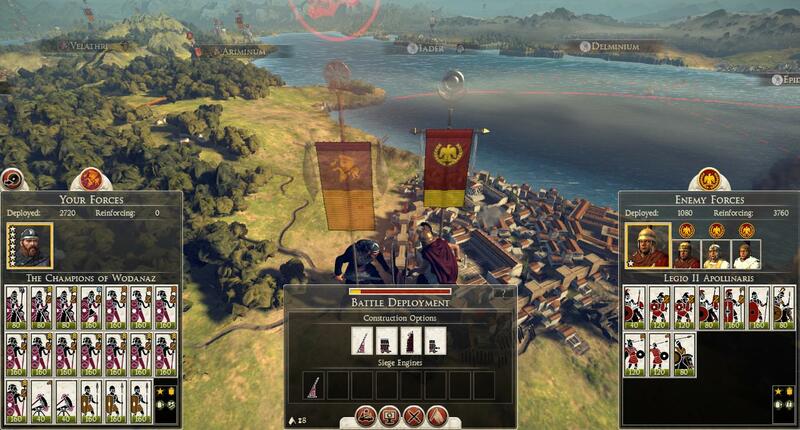 All the arts and build times are fitted to a campaign game that finishes around 0 AD I guess. That's 270 turns at least, which seems plenty to me. You must be playing really slowly if you want 4 times that. I'm not saying it's a bad thing but to me that sounds boring. Its really more about keeping my generals and agents alive. They were dying off way too fast before, now with 4 turns per year I can get the most out of my generals and really become attached to them. Well of course. 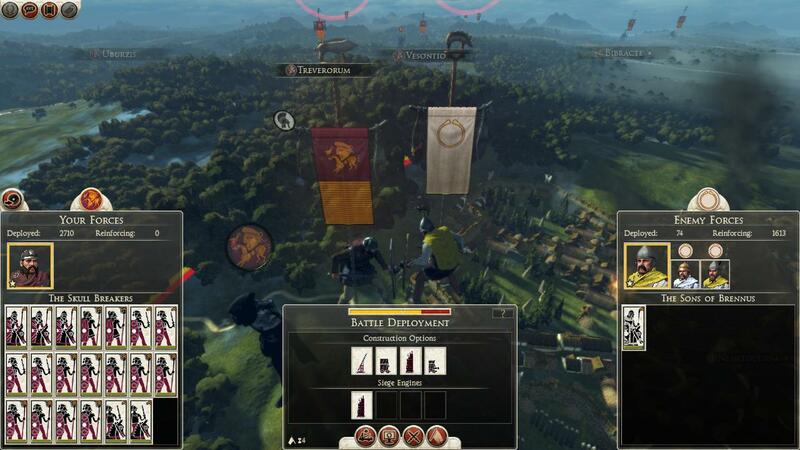 A big part of the Total War series is getting attached to the characters. 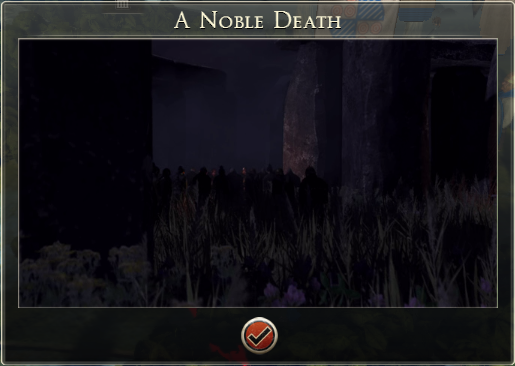 Hard to get attached to them when they die in less than 30 turns. Another aspect to this is the internal politics system. Currently, politics is mainly about managing the civil war situation. 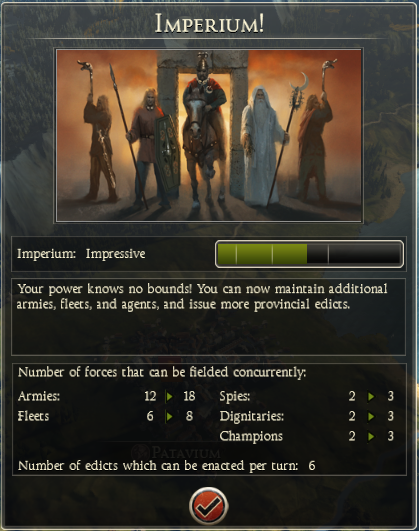 If generals lived longer, however, then there would also be increased value to the political promotion feature as well. 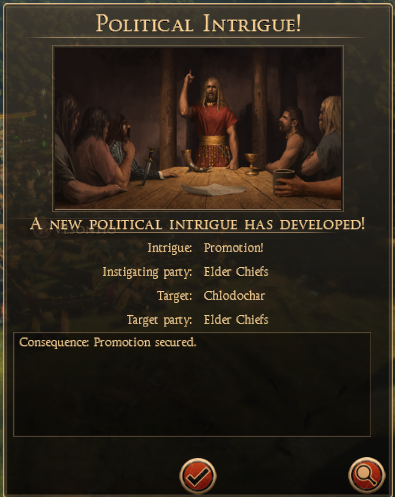 Some of the higher promotions (Consul, Governor) have some pretty nice trait bonuses associated with them. In addition to senate influence and money, however, these promotions also have age/rank requirements. I haven't quantified it, but it seems to me that each rank requires more and more success to achieve (i.e., a guy has to win more battles to go from rank 2 to 3 than it did for him to go from rank 1 to 2). Thus it can take an entire lifetime to get to rank 7 and qualify for Governor. By the time the guy gets there and you spend the money and influence to get this promotion, then he's on death's door. Right now, there seems to me insufficient reward for spending the time/effort/influence/treasury to work a guy up the political promotion ladder. (There may be promotions above Governor, but I've not seen them yet. Which indirectly helps prove my point...). I never really understood the appeal of having more turns per year. Anybody tried a 36tpy mod or something like that? It sounds quite fun; I know Fots has around 24tpy. Quite useful in covering short time frames. 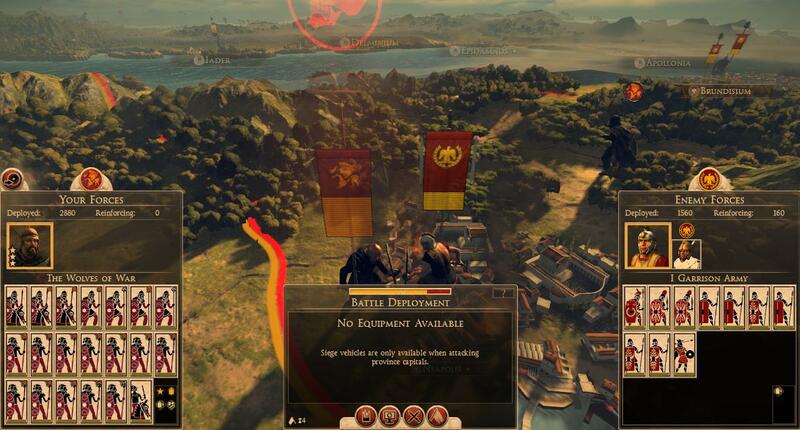 Rome 2 vanilla should've came out with at least 2tpy with mechanics that fit 2tpy, though now they leave that stuff to modders. 2tpy would've added some variety and more thinking on the campaign and battle map plus introduce more interesting characters. No I didn't. 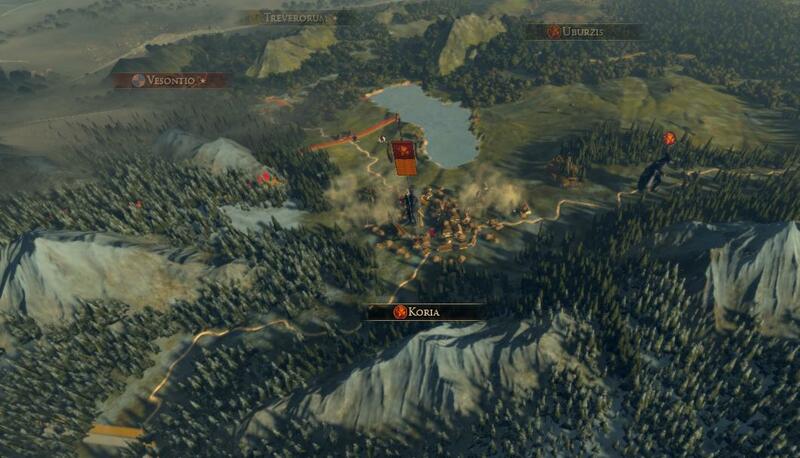 I started with Rome 1 and I probably played Medieval 2 or Shogun 2 the most. I more or less skipped ETW and NTW. .......waiting for the enemy formations to come streaming out of the murkiness-----straight into your ambush! 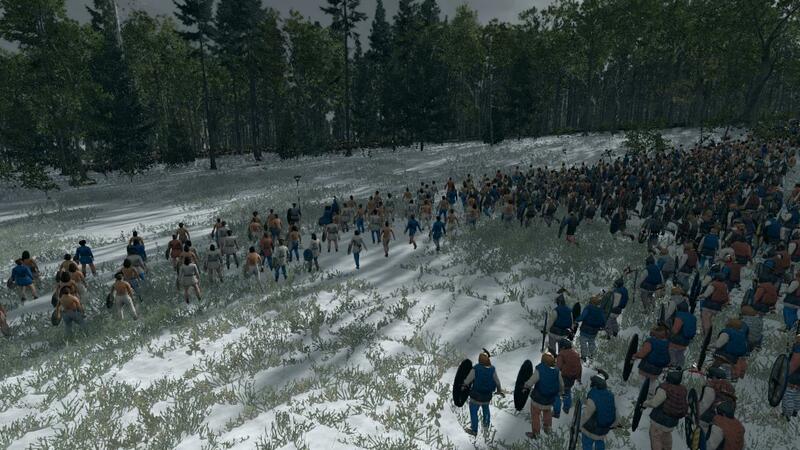 My very first battle in Shogun was not on the campaign map but one of the historical battles, Okehazama. You play as Oda Nobunaga and the battle starts in a crashing thunderstorm. 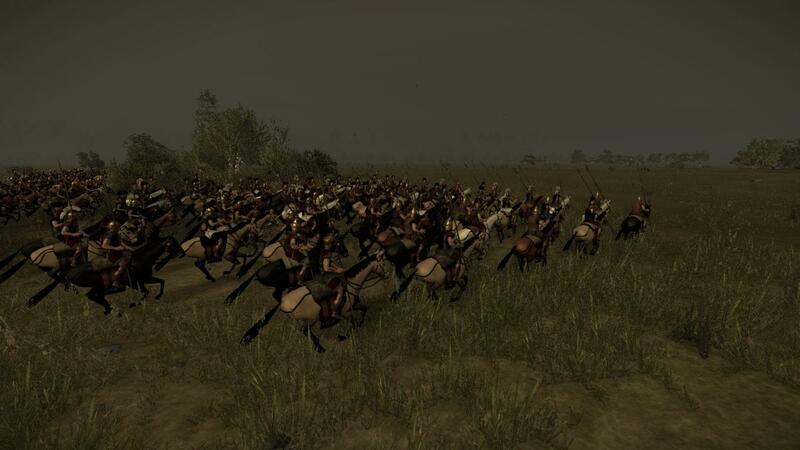 As your heavy cav comes thundering down the hill, hoofbeats in rhythm with the lightning flashes, you feel giddy. And then there's your "Braveheart" moment (specifically when Longshanks heavy horse are bearing down on Wallace and his men at the Battle of Stirling) when you have to decide when to loose your Nodachi and Battlefield Ninja who are concealed in the woods on either side of the Imagawa troops headed up the valley to stop your heavy cavalry. "Hold-------Hold---------HOLD---------NOW!!!" Last edited by ReluctantSamurai; 09-13-2013 at 01:53. Oh music.. music!!! MUSIC!!! 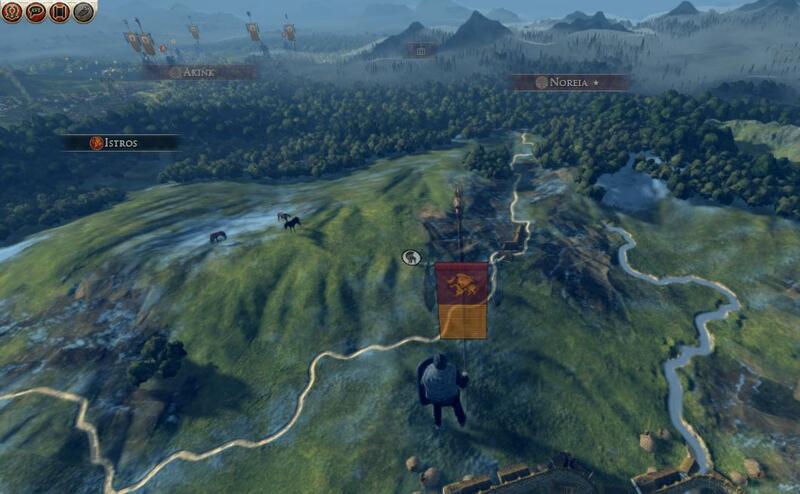 I don't like the music in Rome 2. It blends in so well with the surroundings and the goings on, which means you really don't even notice it's there! Sometimes during a quiet moment, when you march your people around I'm all like hey! There is music! @ OP, Good start and nice write up! Sadly, for me this always meant REEEEELOAD! Hey, money was always tight! Incredible experience though, first day I played it I stayed up for over 24hrs non-stop. I looked like a bugged out crackhead with Cheez-It crumbs all over my shirt and face, and empty 2 liter bottles of ice tea everywhere. Sad. I looked like a bugged out crackhead with Cheez-It crumbs all over my shirt and face, and empty 2 liter bottles of ice tea everywhere. LMFAO!!! There are no icons to depict how hard of a laugh I had at this! Last edited by Hooahguy; 11-18-2013 at 00:47. Wondering if you're going to have an army composition full of melee for the rest of the game? 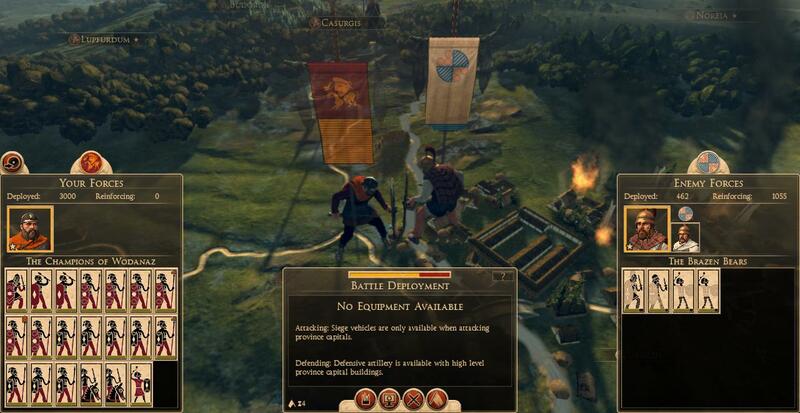 From footage and my own experience with Rome 2 Averni are the best melee non phalanx faction. 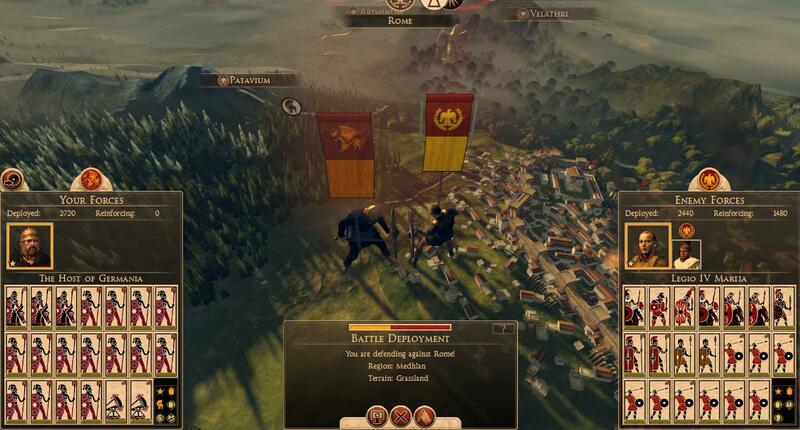 They even got the best shock cavalry compared to Parthia. You talking cav on cav or generally speaking cav usefulness? Also, the Avernii seem to have very powerful stacking smithing bonuses so they could get huge once they get enough major cities with tier 5 smithies. Averni noble cav beats the Parthian noble catatanks head on. 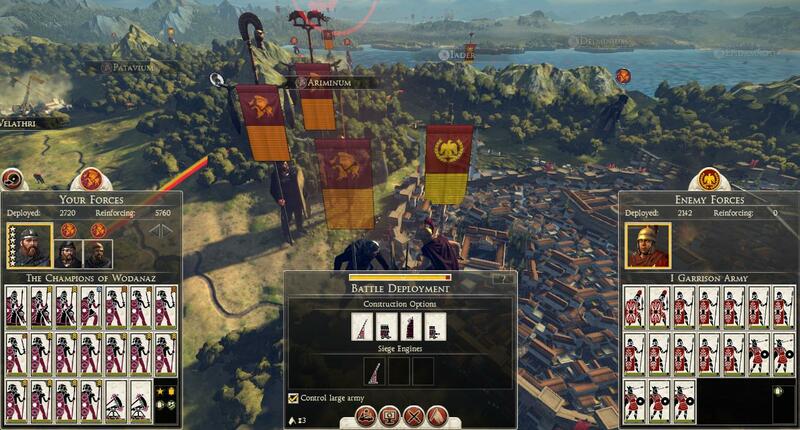 With special abilities activated like frenzy charge the cataphracts just get ripped apart. Im actually not to sure yet. I find that slingers, for my play style, are pretty useless, because they cant fire over my men and because Im a fan of the "overwhelming firepower" doctrine. 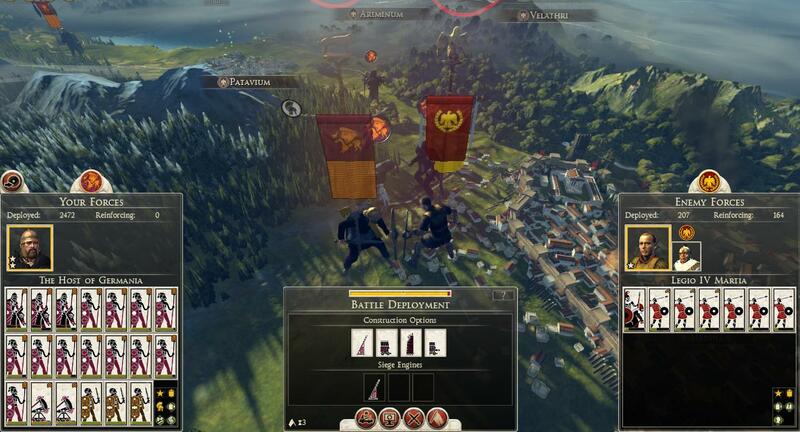 So I might just abandon using slingers and add another unit of cavalry and spearmen. Melee swarm sounds fun though. 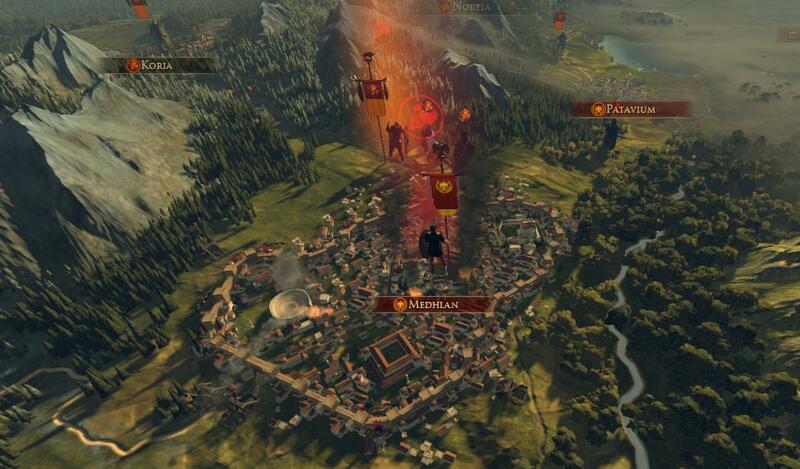 As long as your computer can render a gigantic blob of angry Suebi tearing through the Romans. I was looking at the online encyclopedia for their buildings, they have different buildings that give either damage or a percentage increase of some sort. I haven't gotten to the Averni yet. Oh yeah, Im running a pretty sweet setup, i7 core with a 2gb graphics card. Havent yet had any lag at all running everything on high-very high. I can probably do ultra, but Im going to wait until its optimized more before I make that jump.